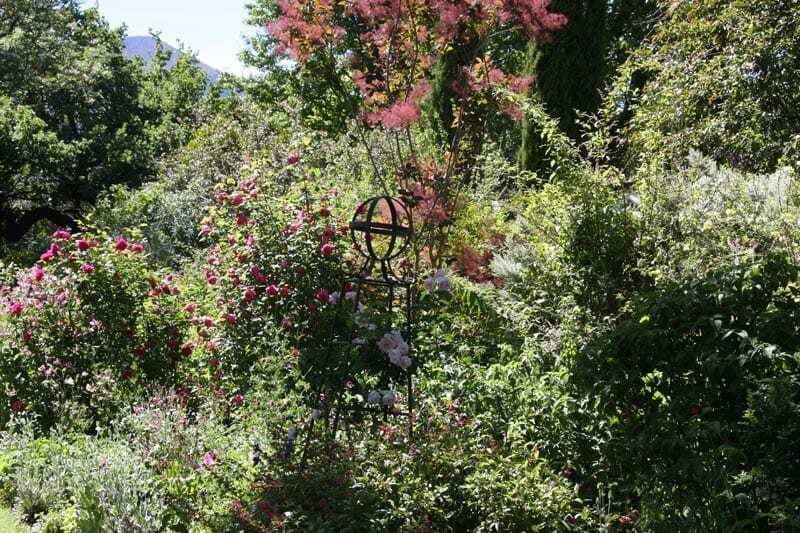 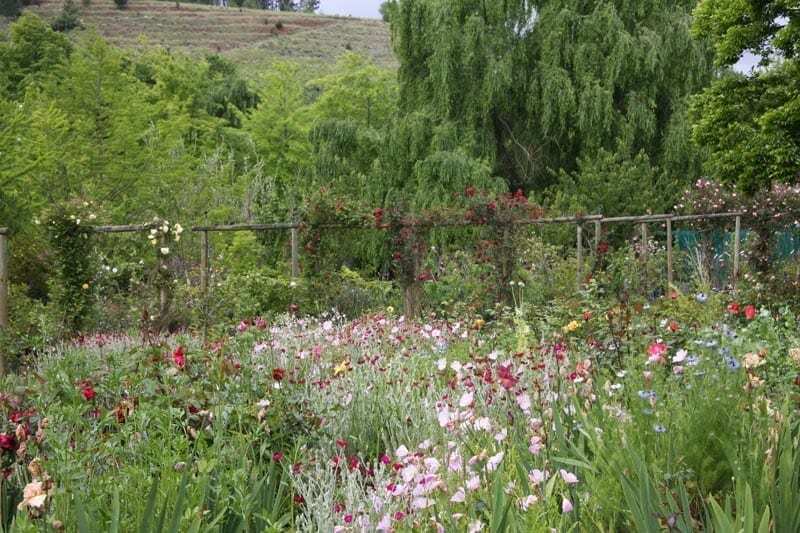 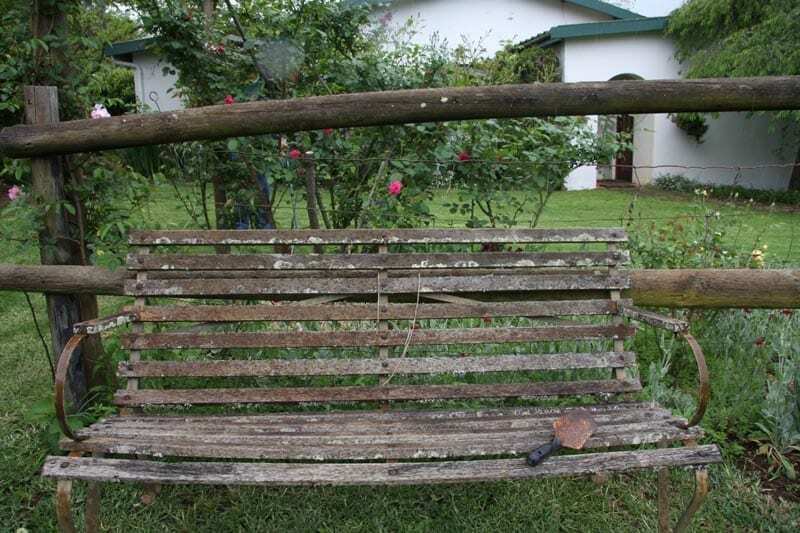 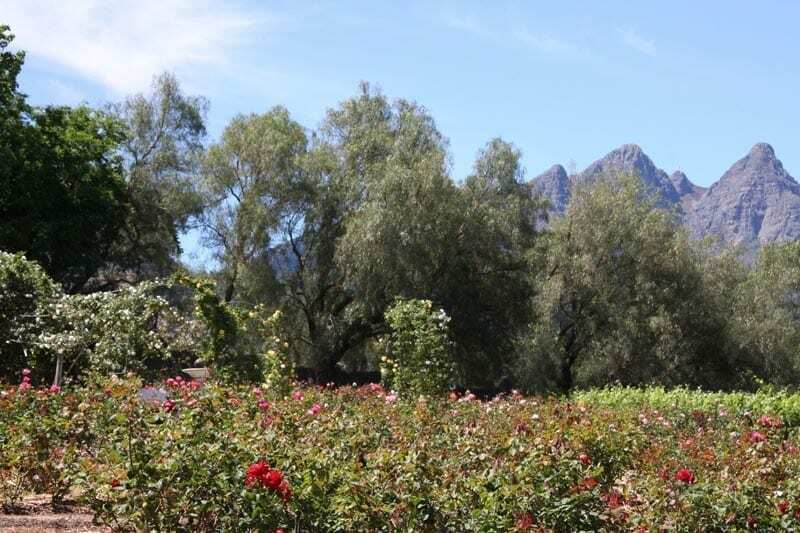 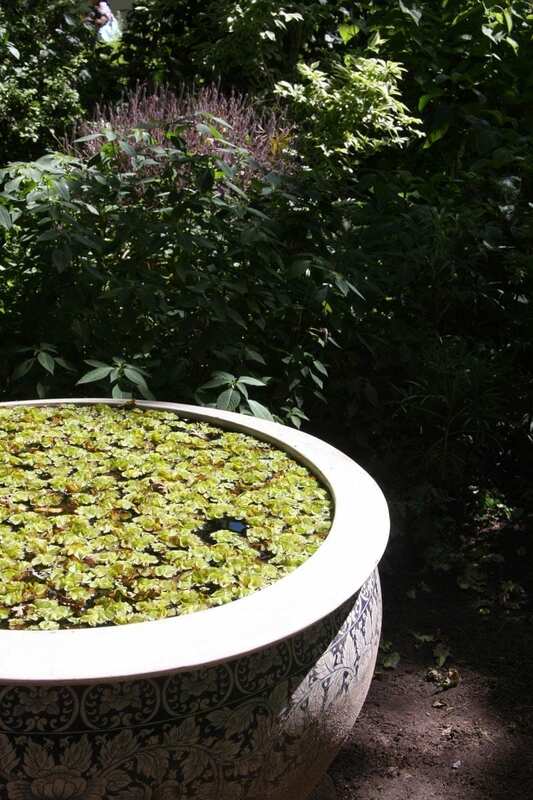 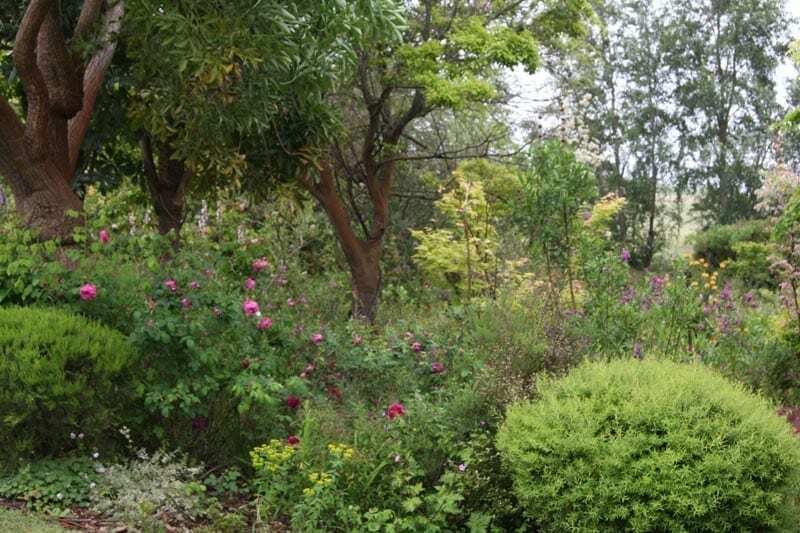 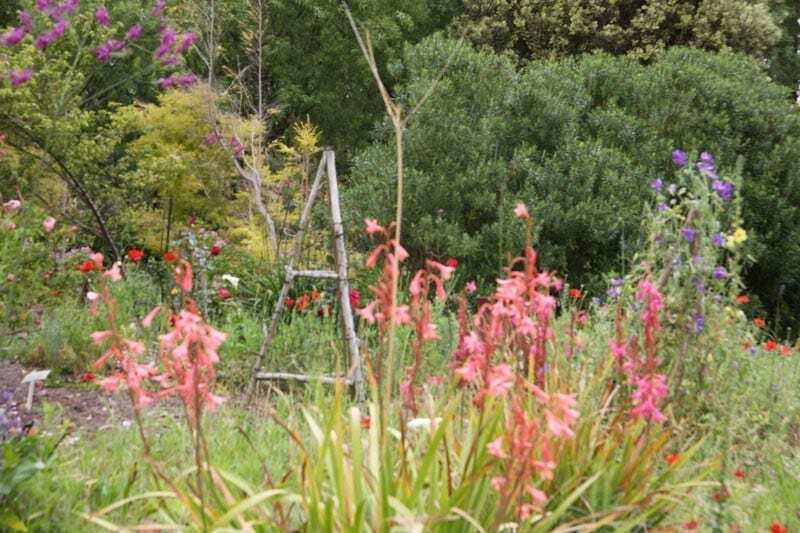 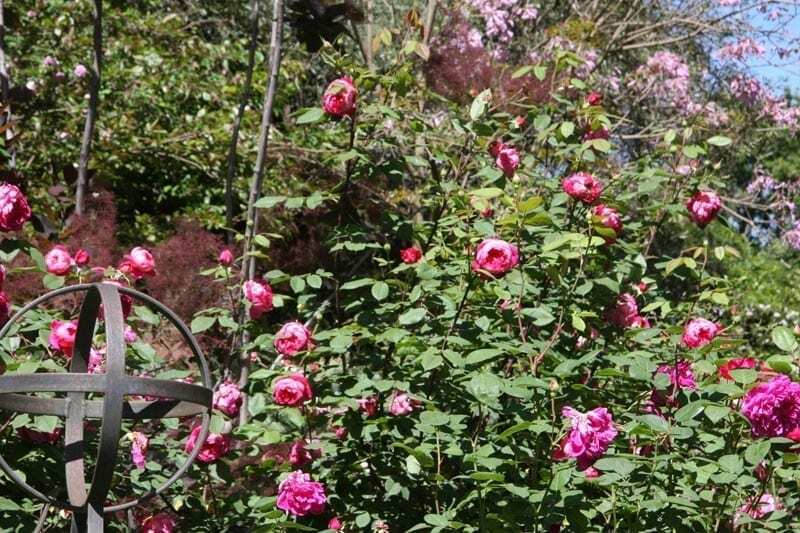 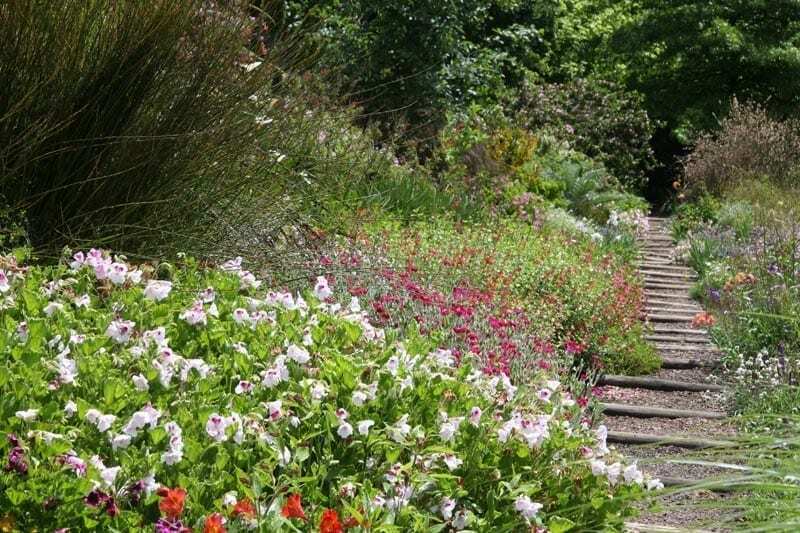 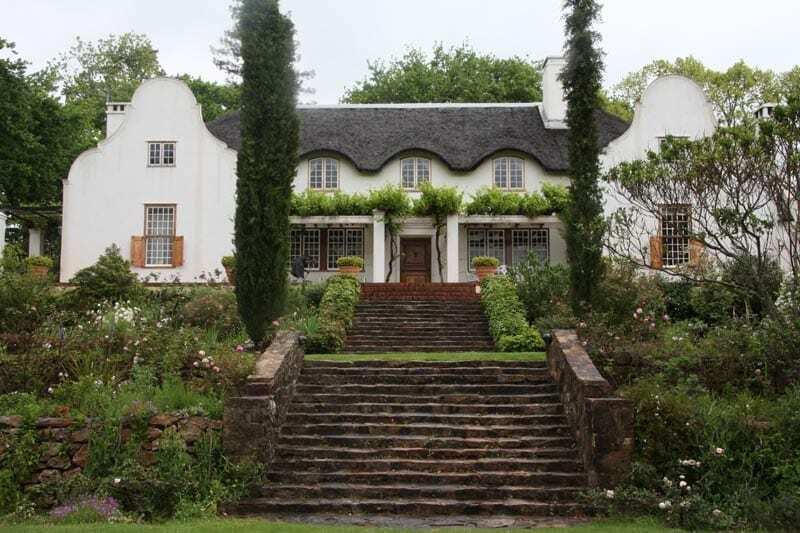 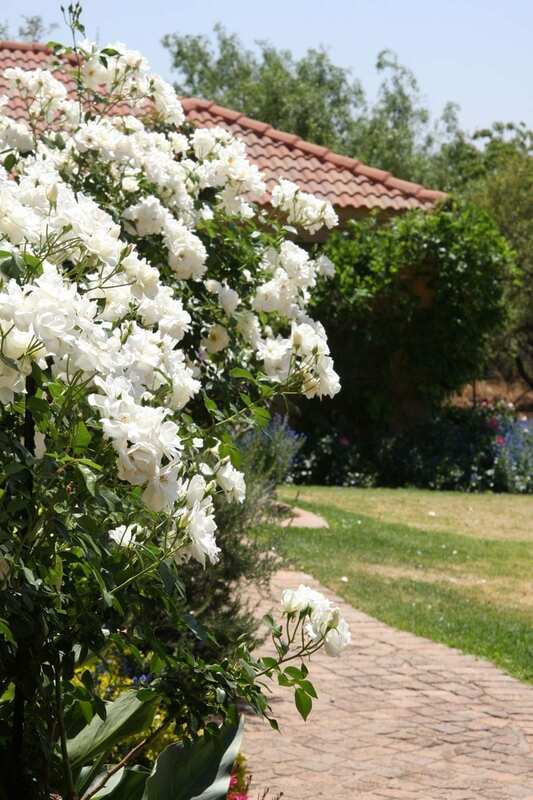 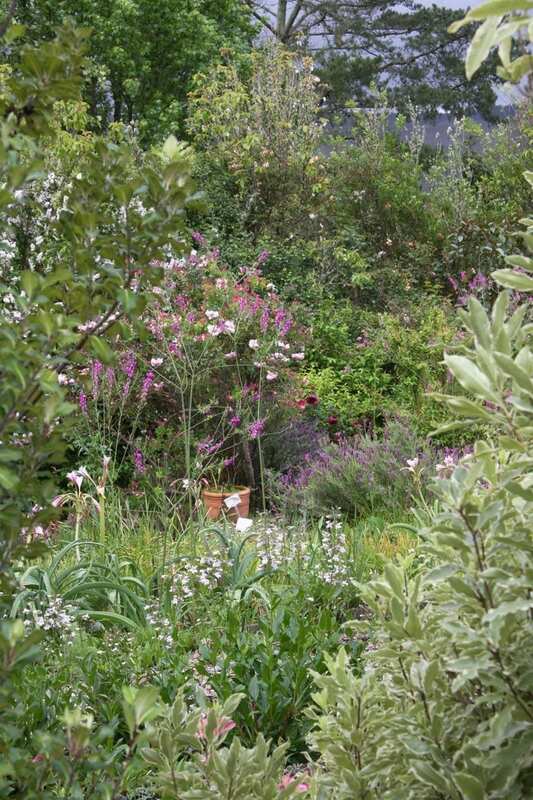 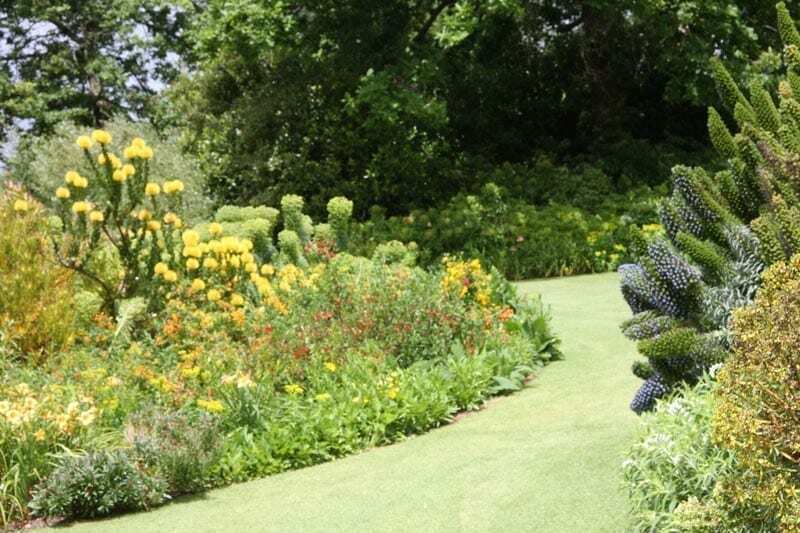 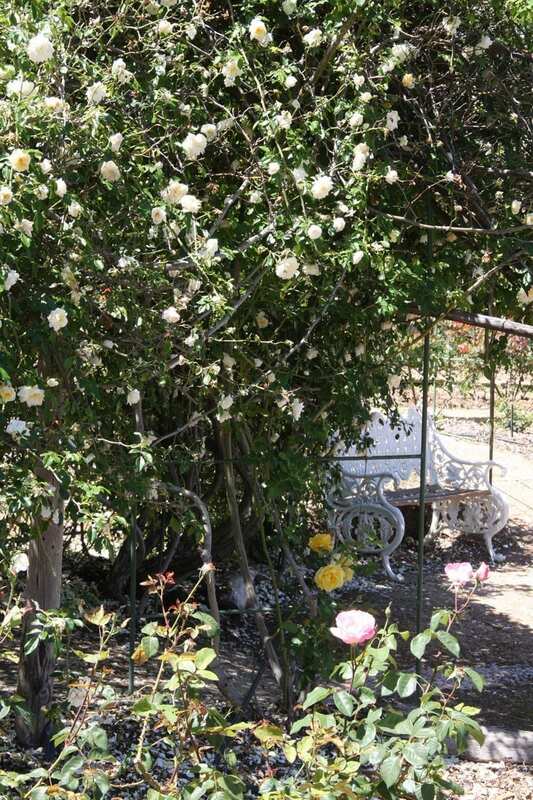 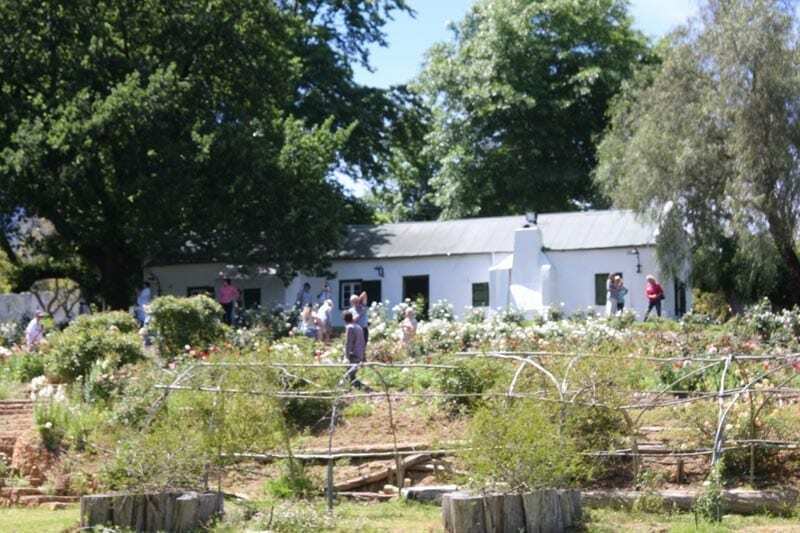 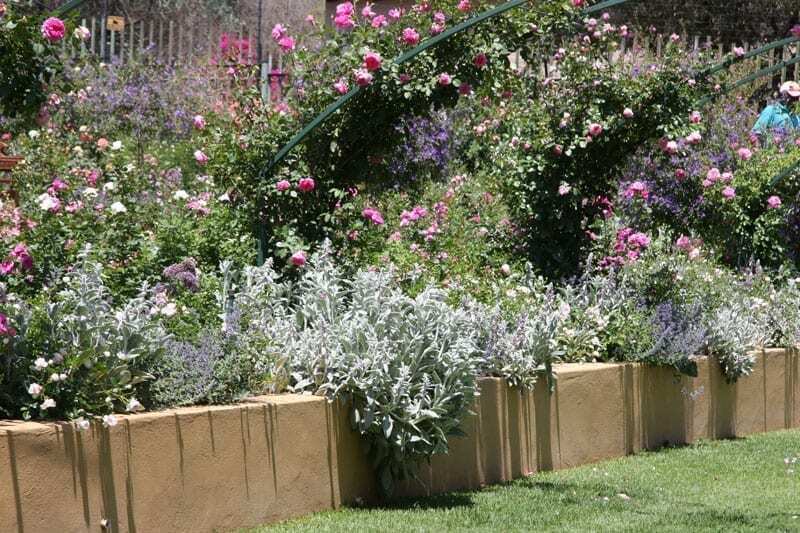 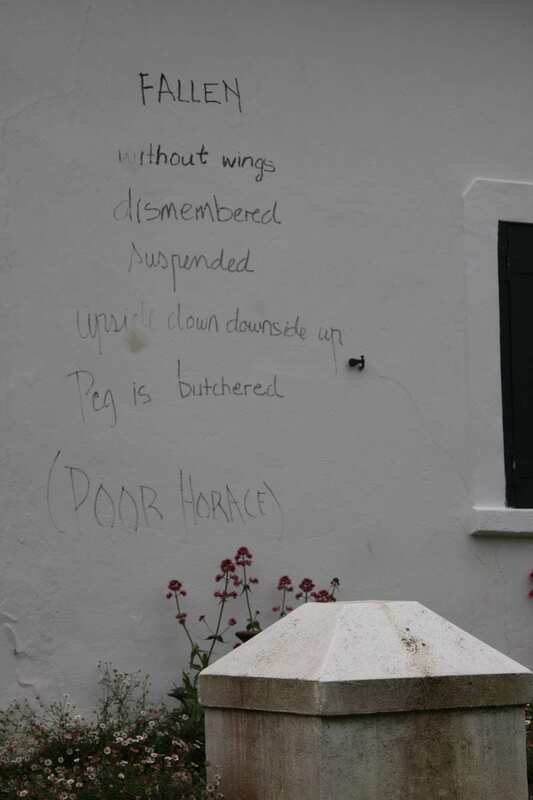 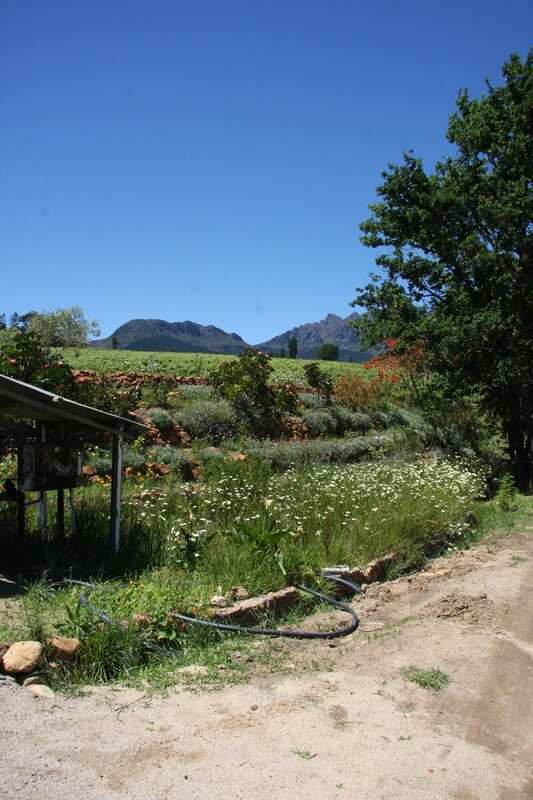 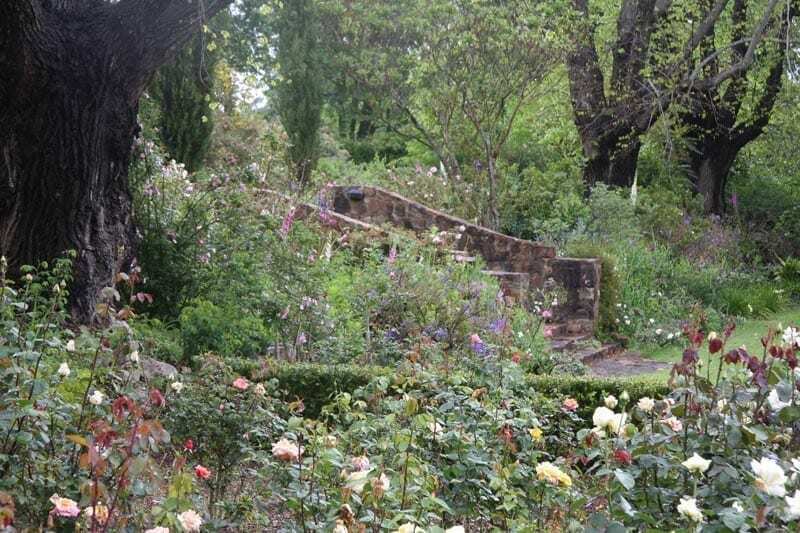 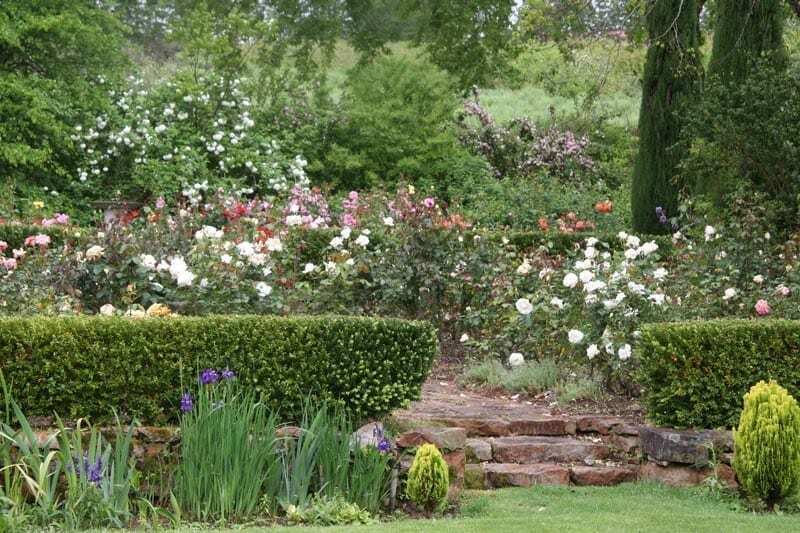 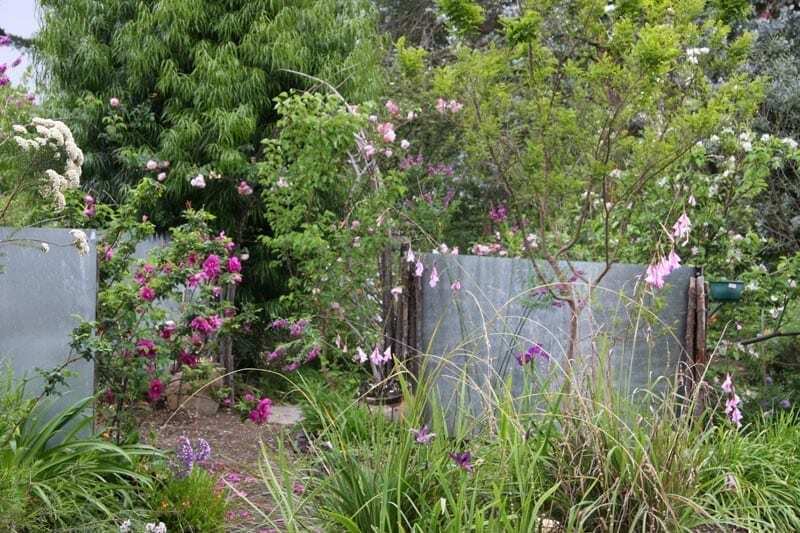 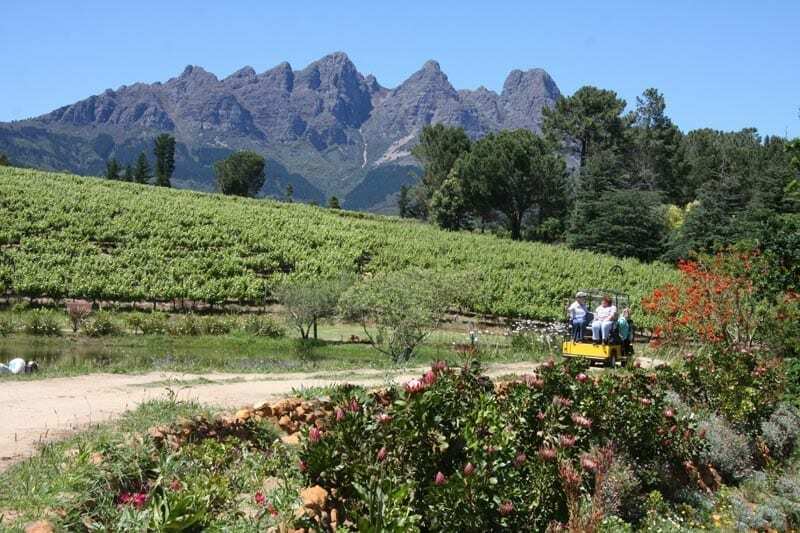 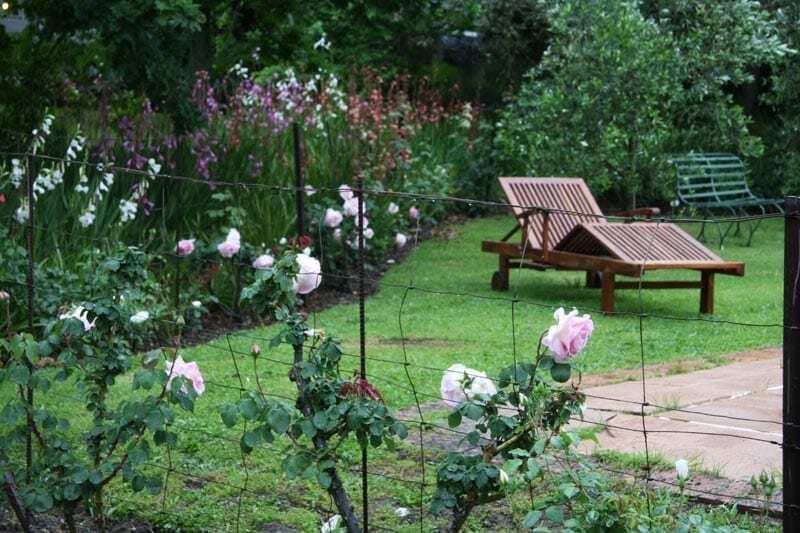 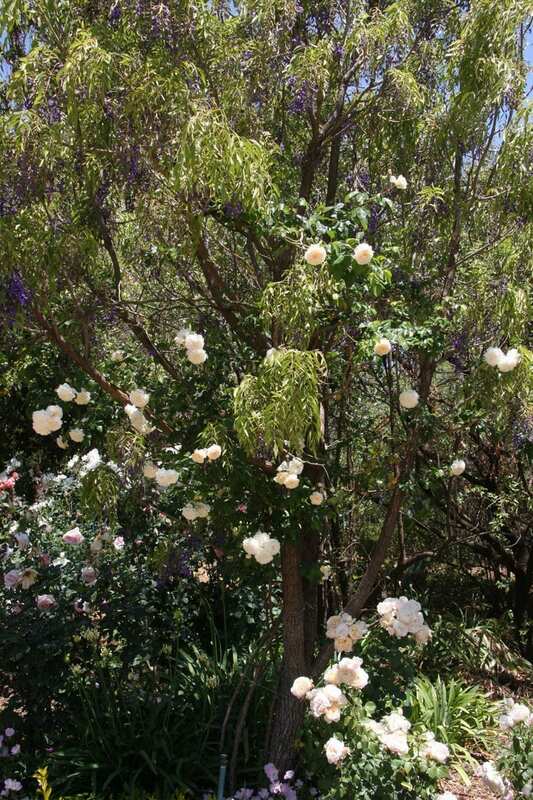 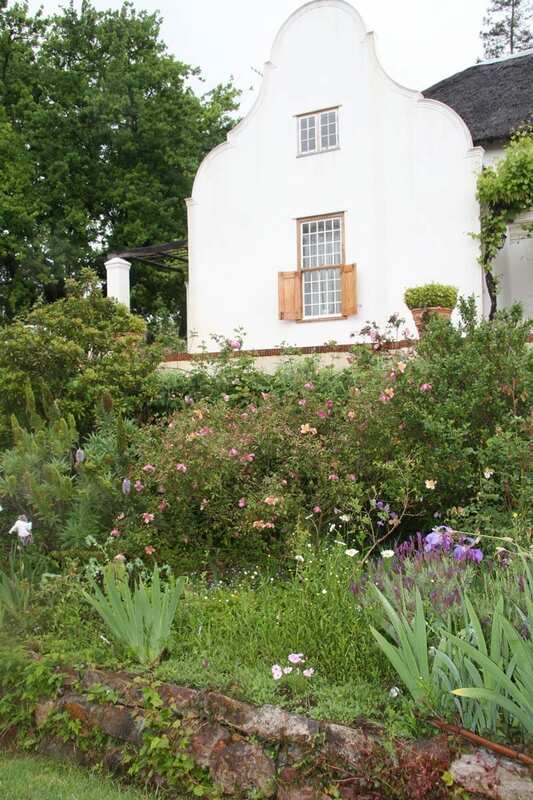 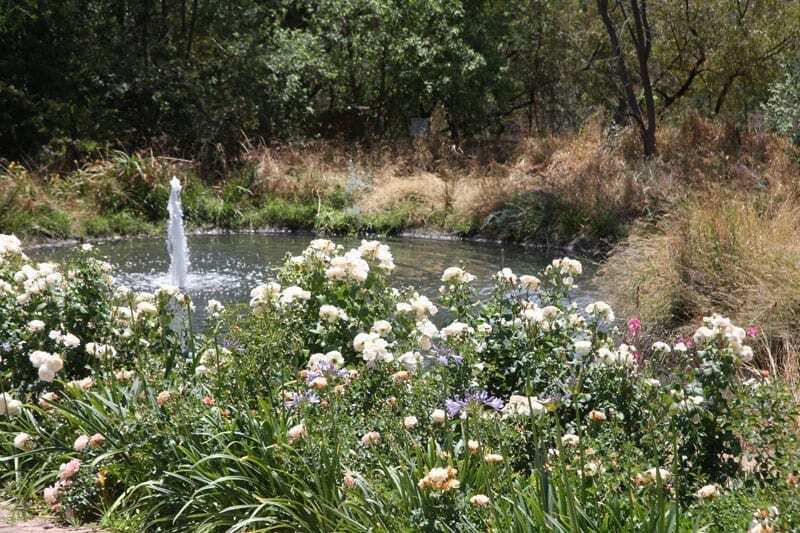 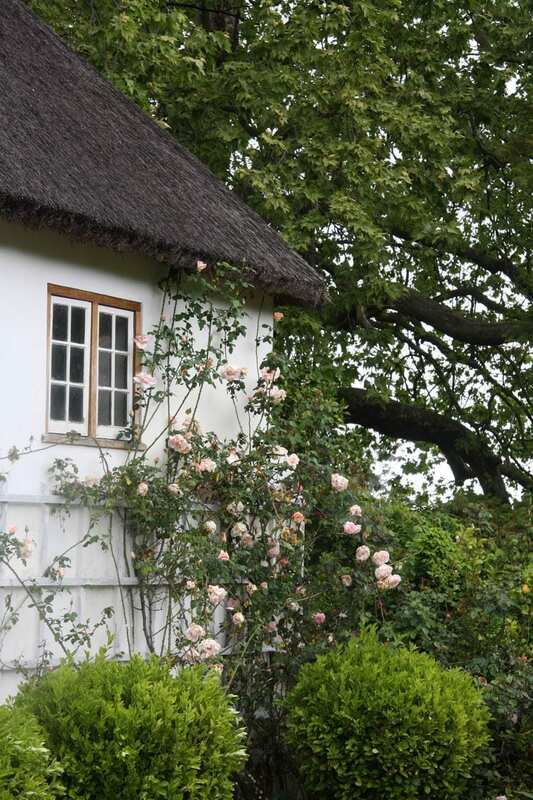 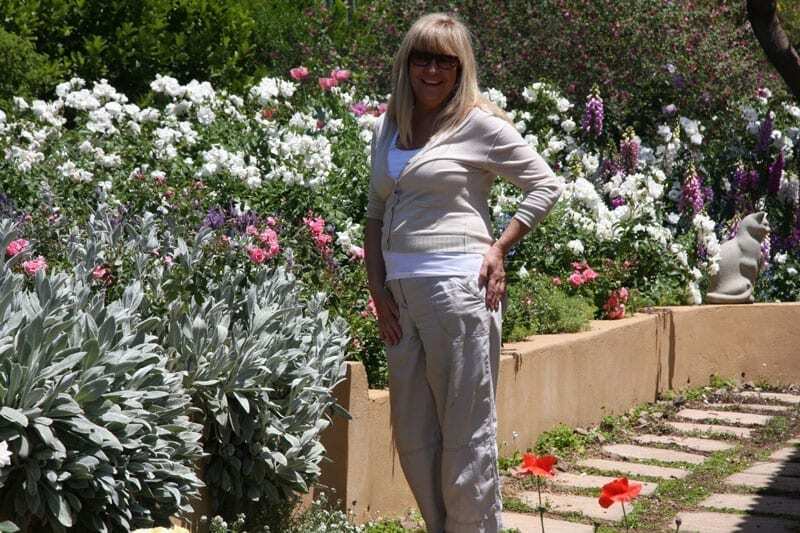 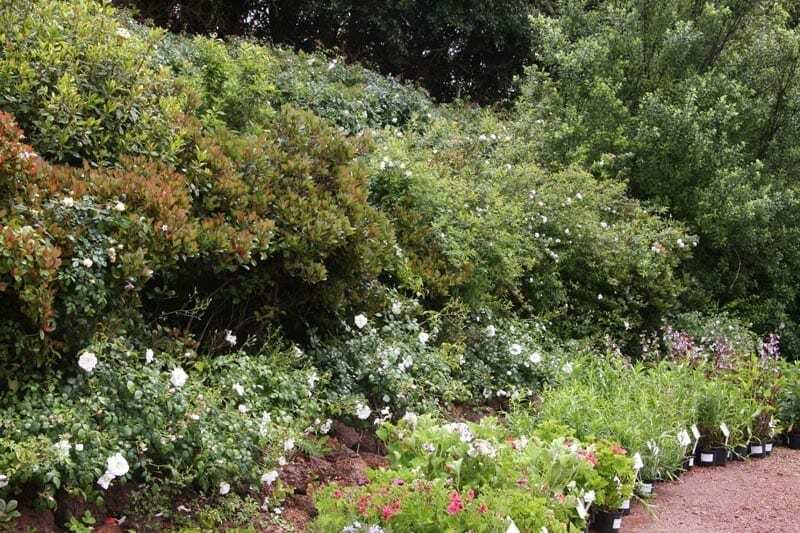 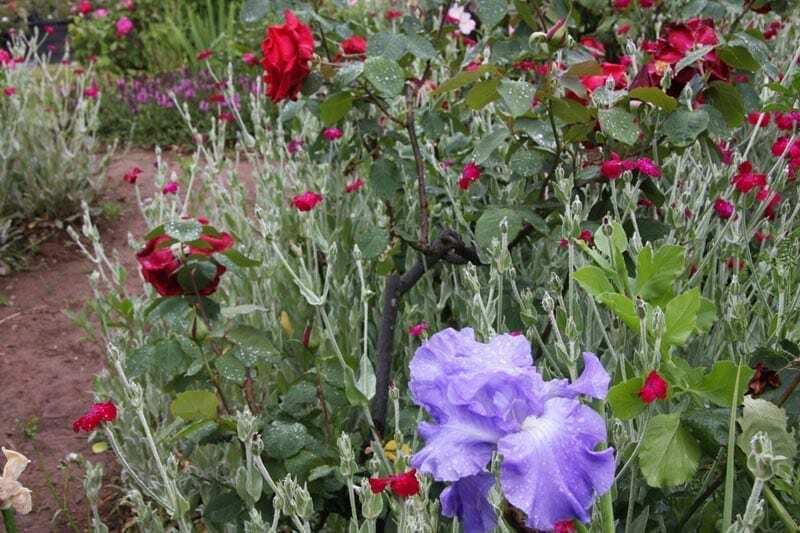 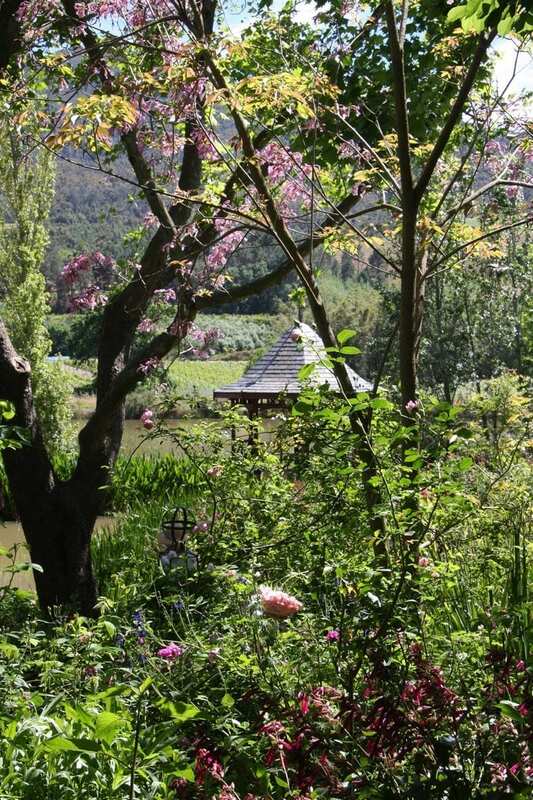 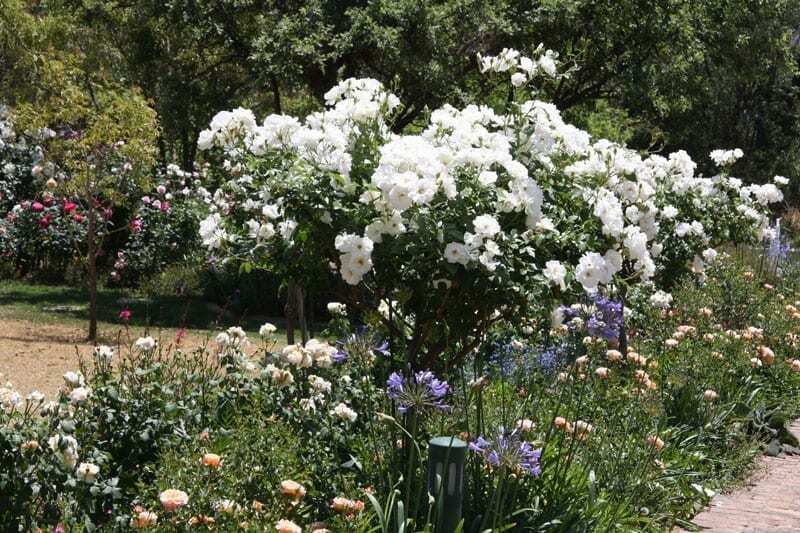 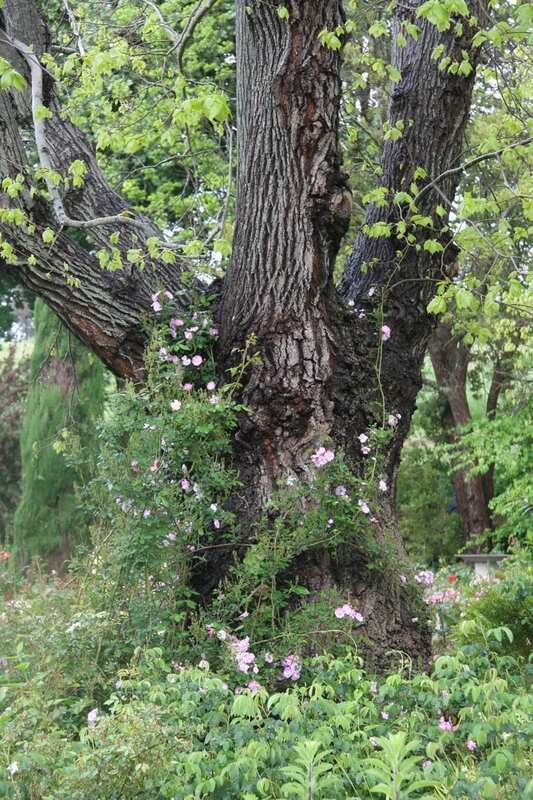 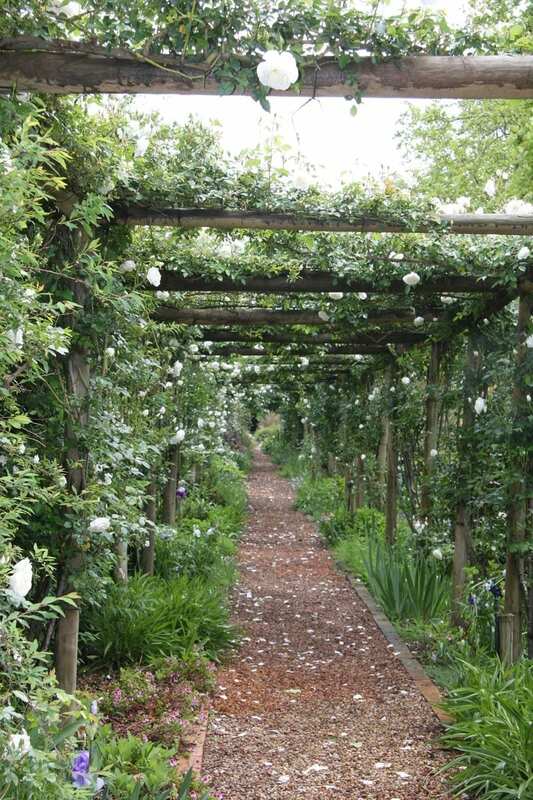 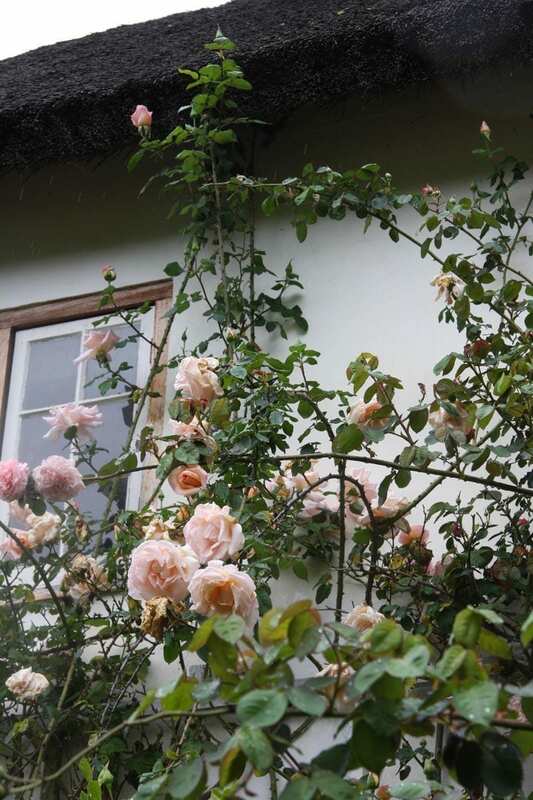 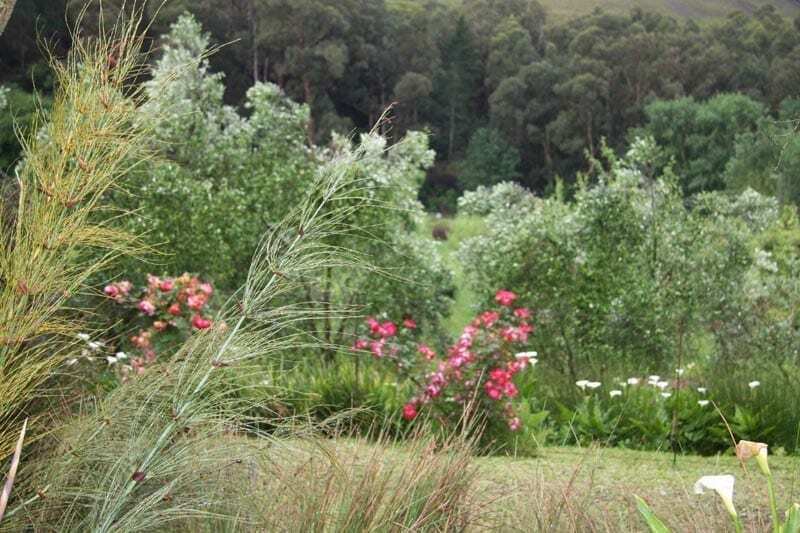 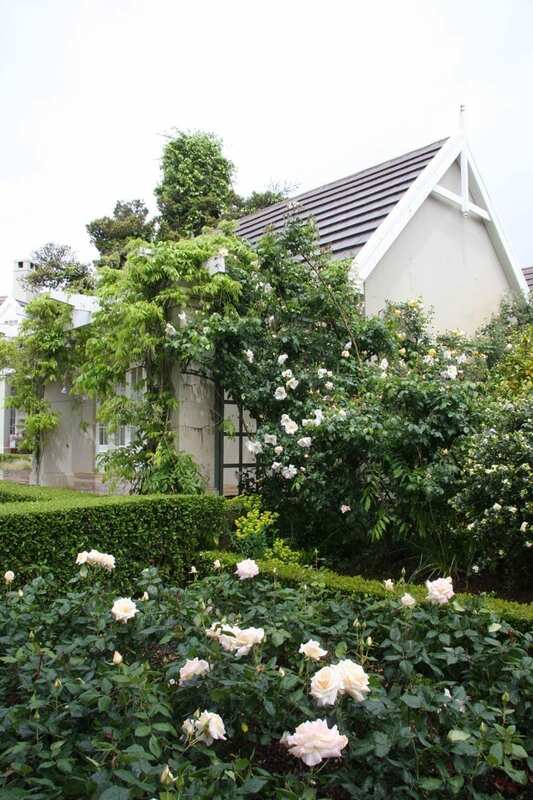 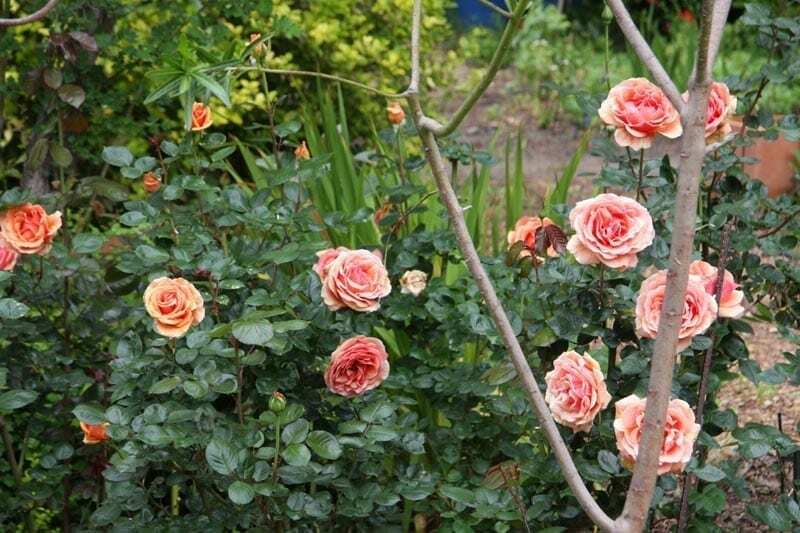 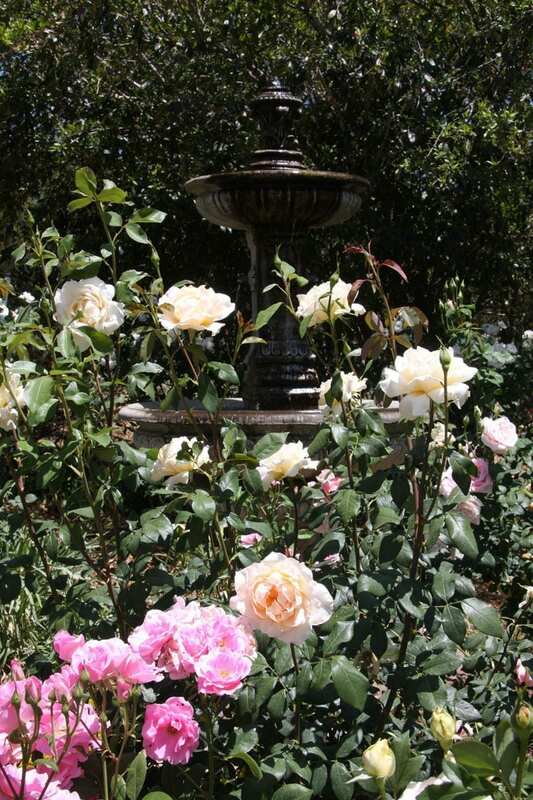 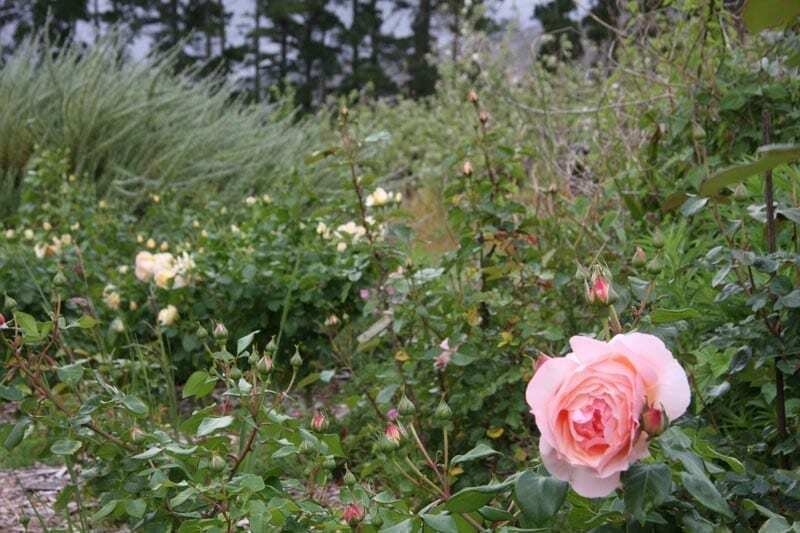 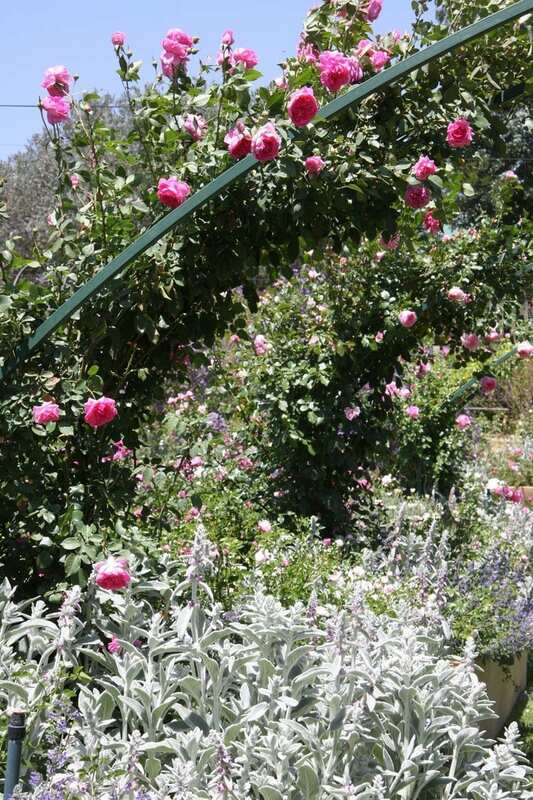 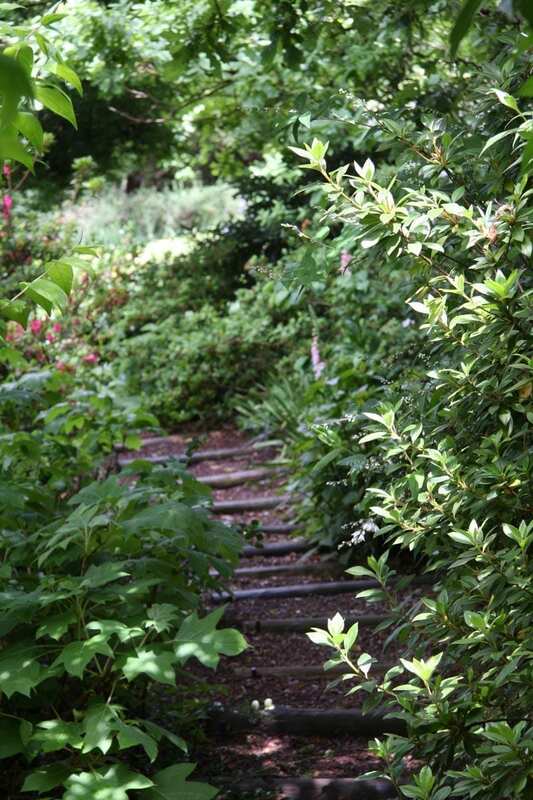 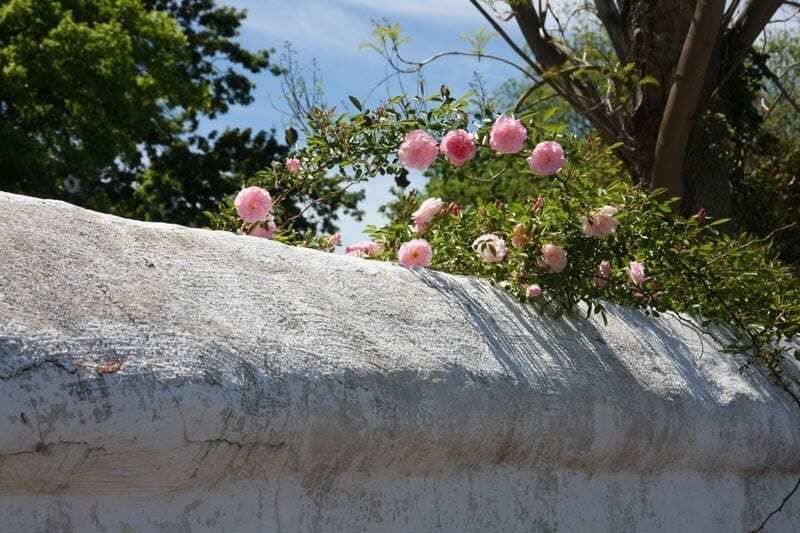 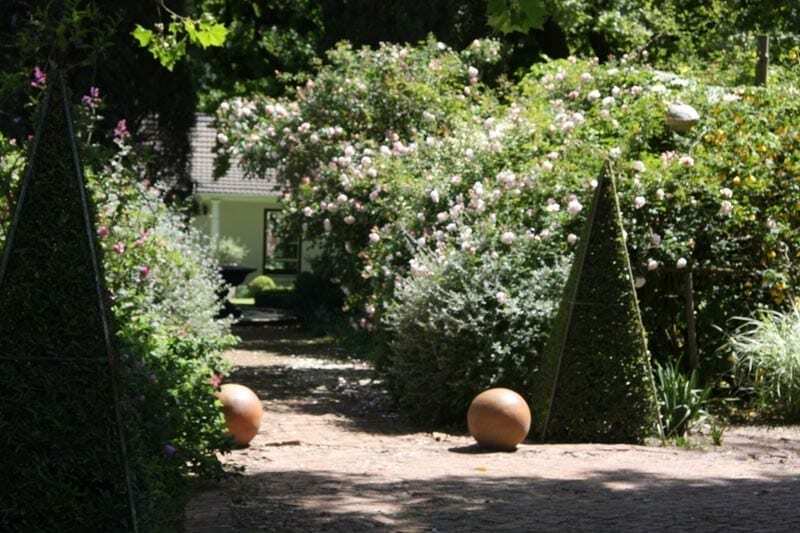 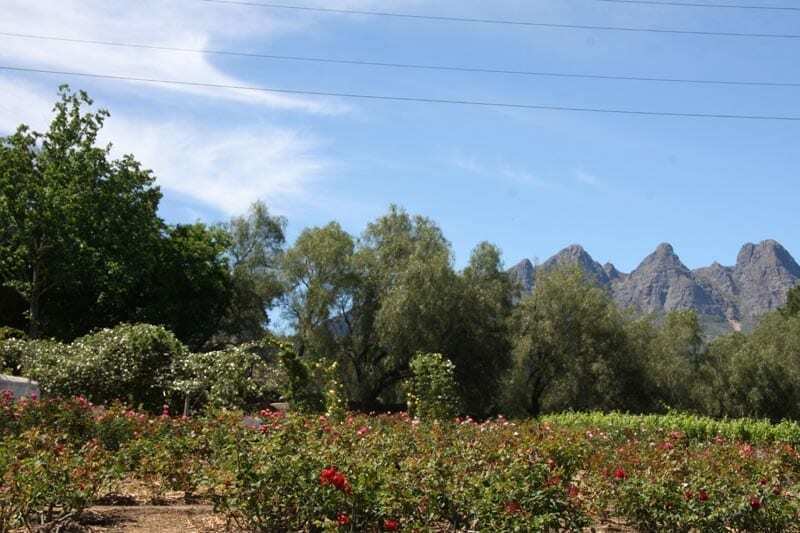 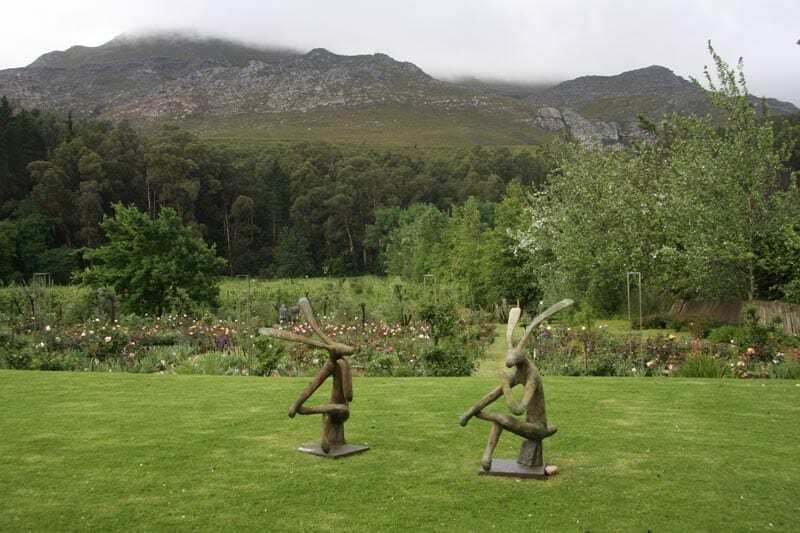 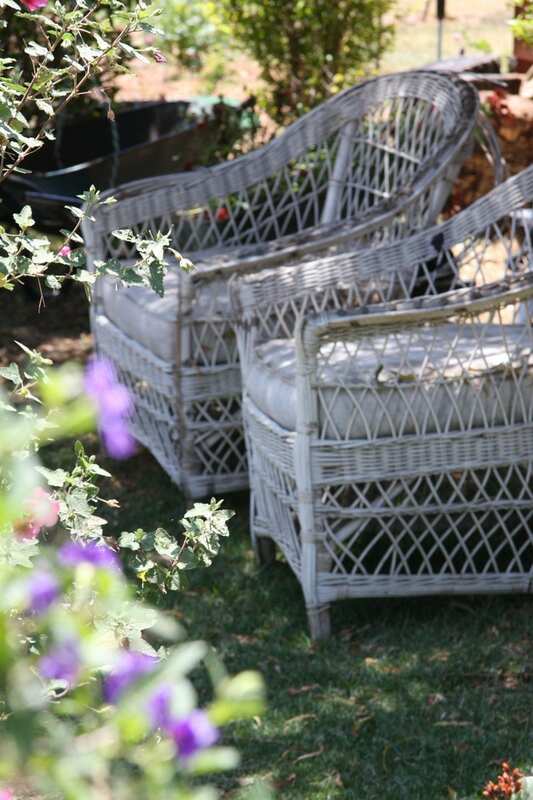 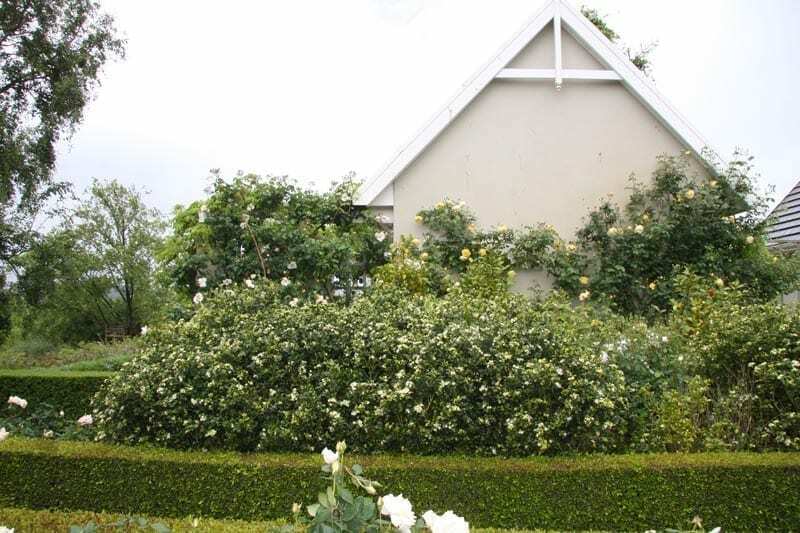 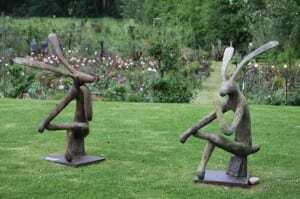 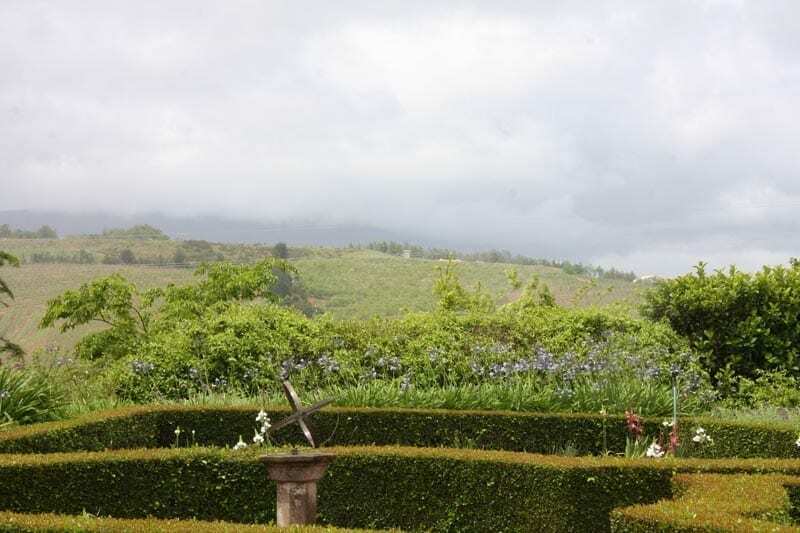 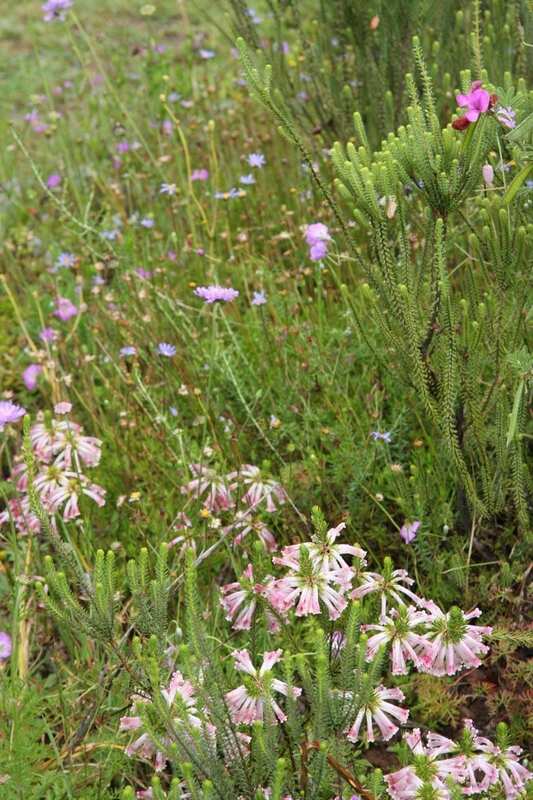 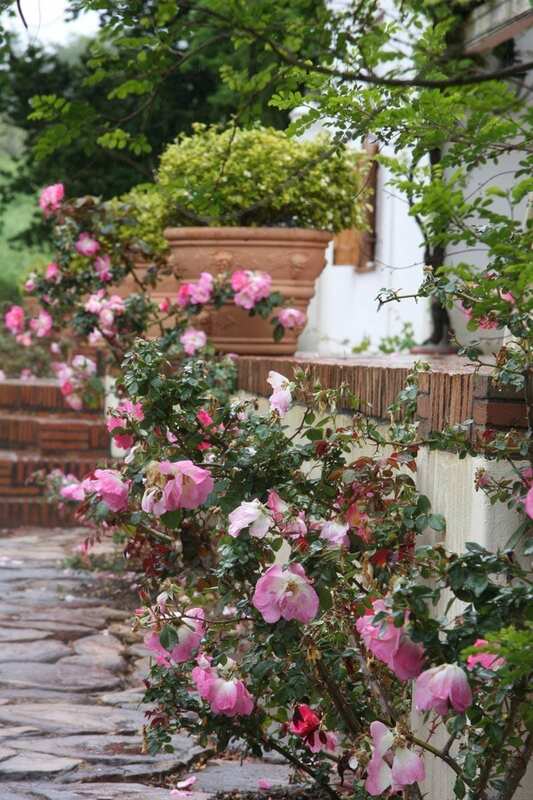 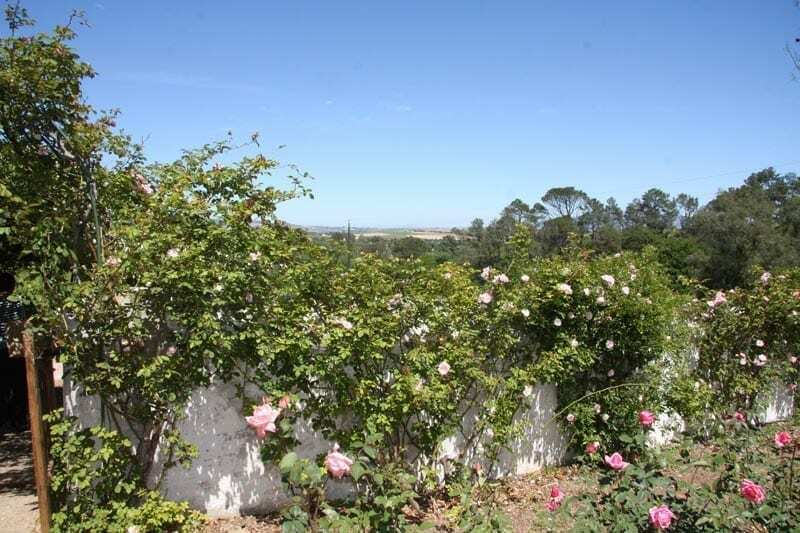 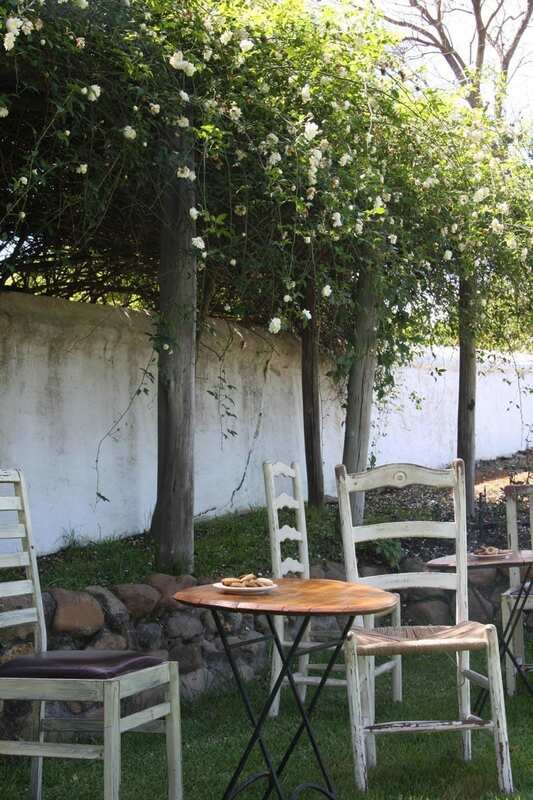 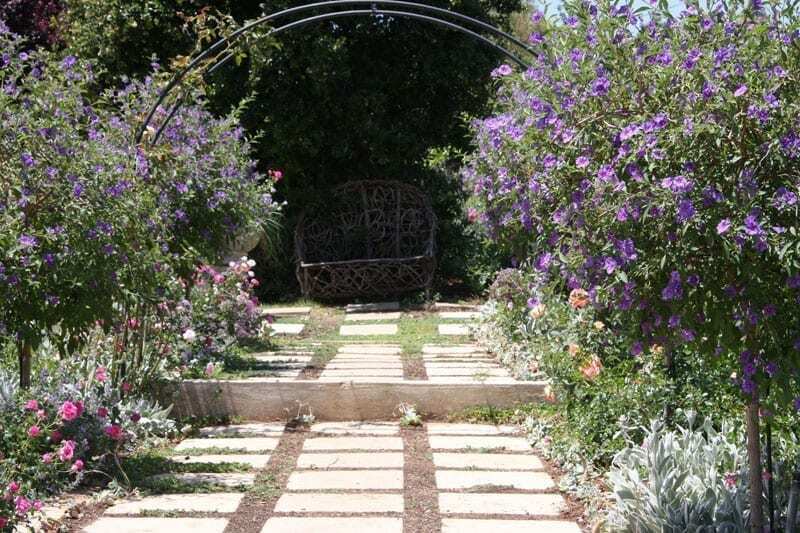 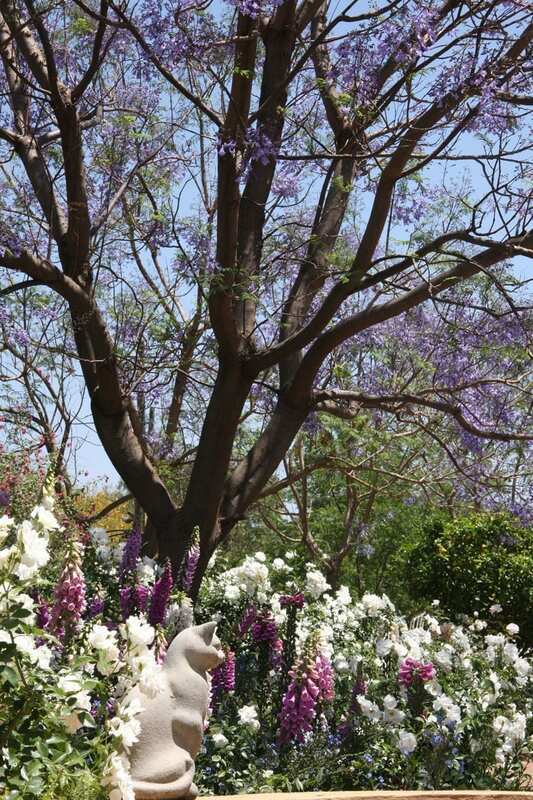 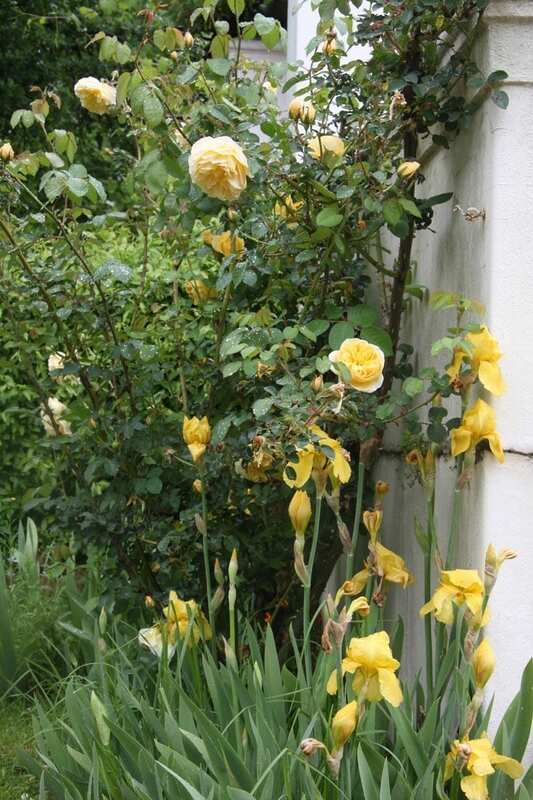 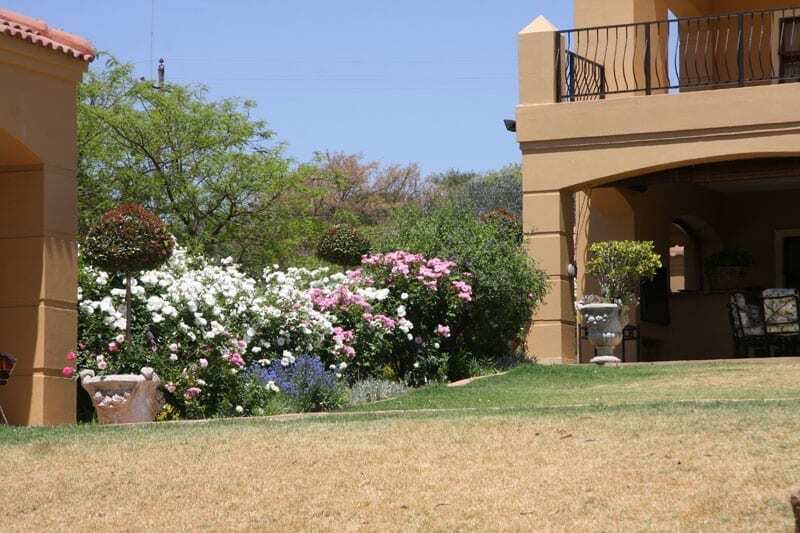 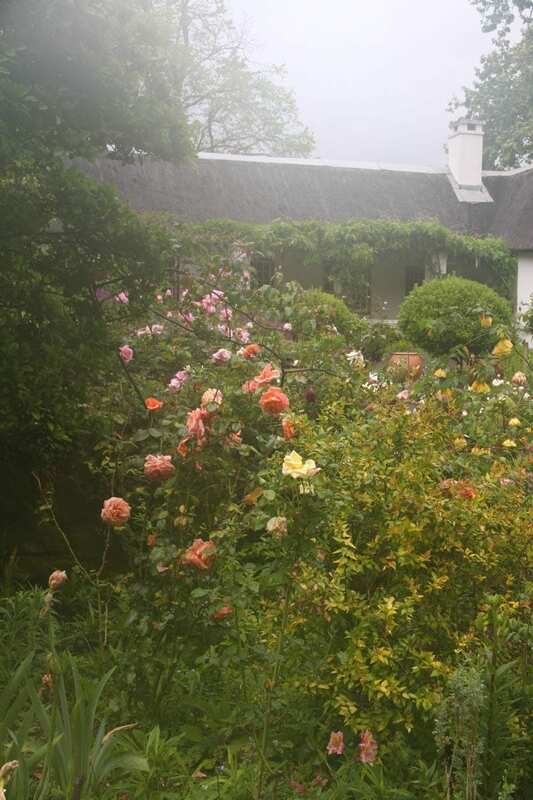 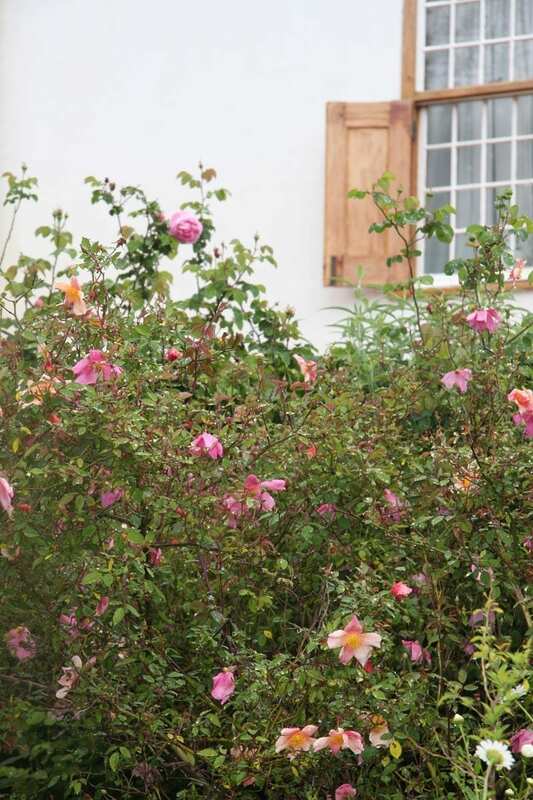 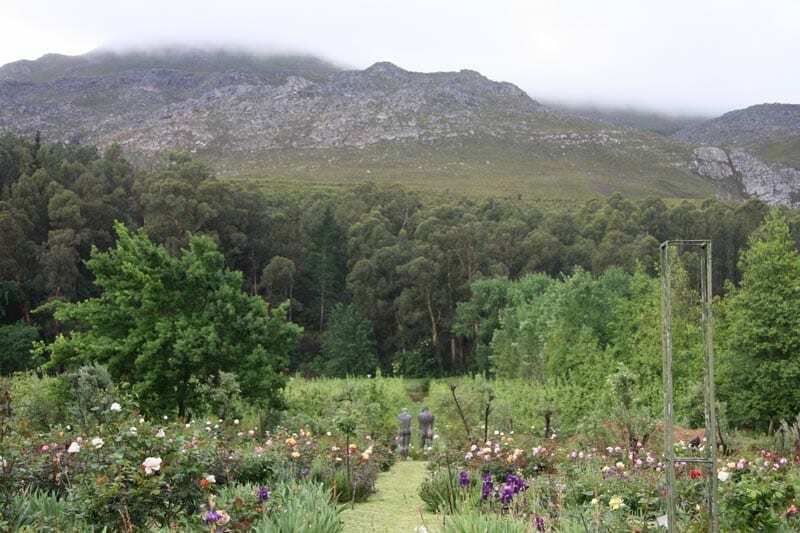 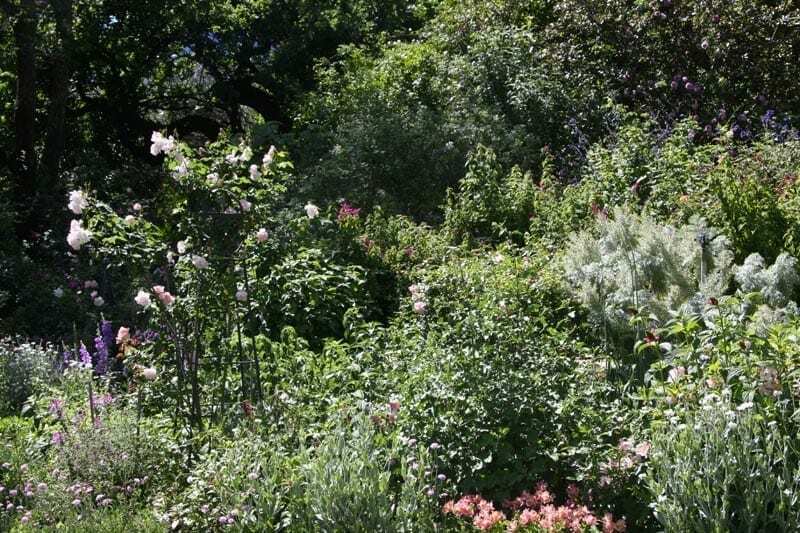 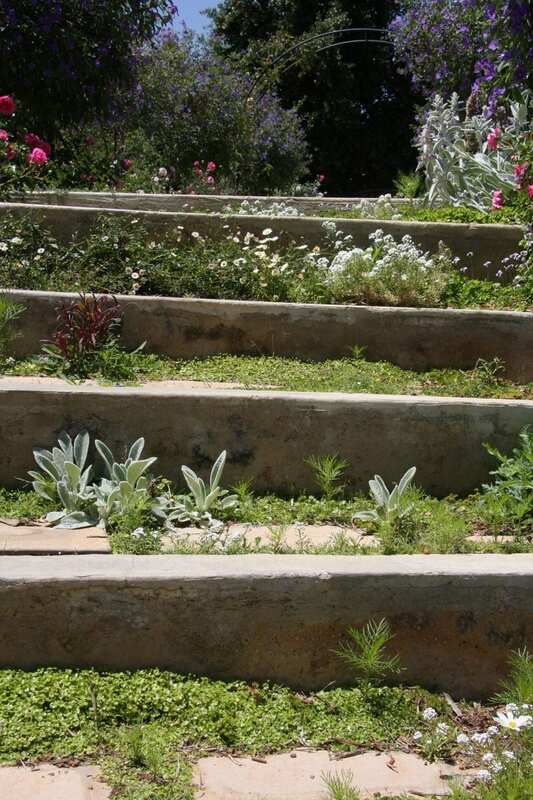 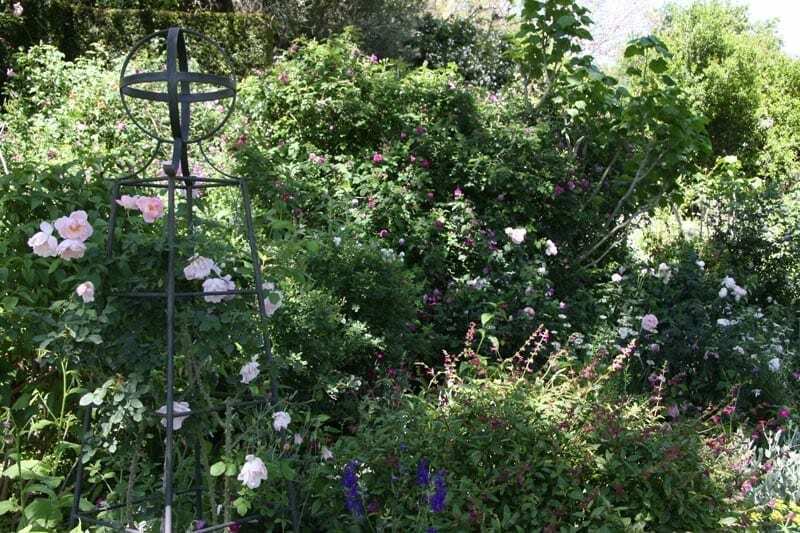 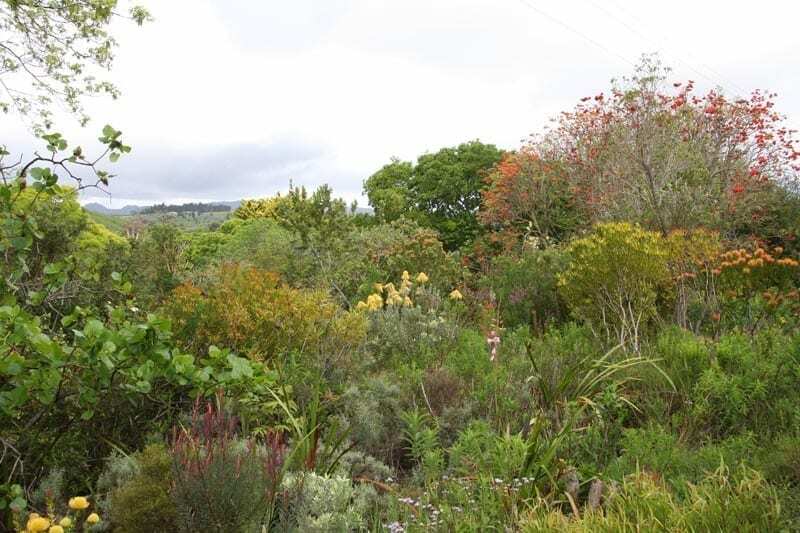 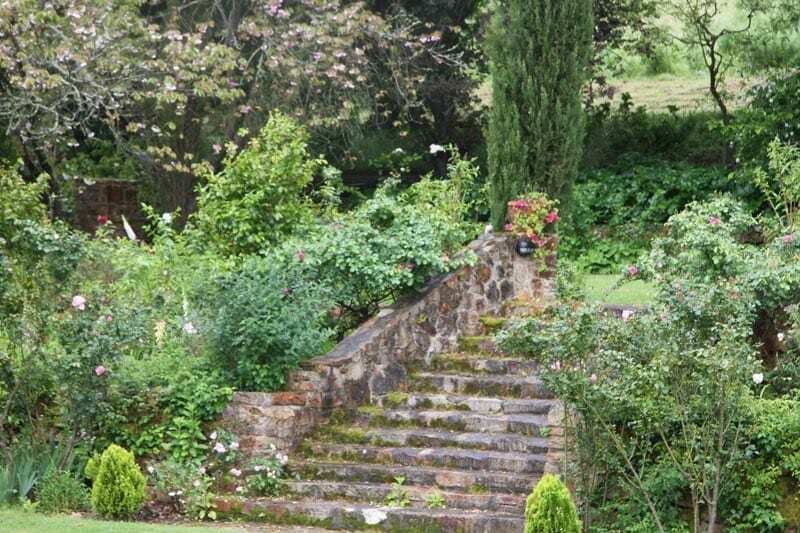 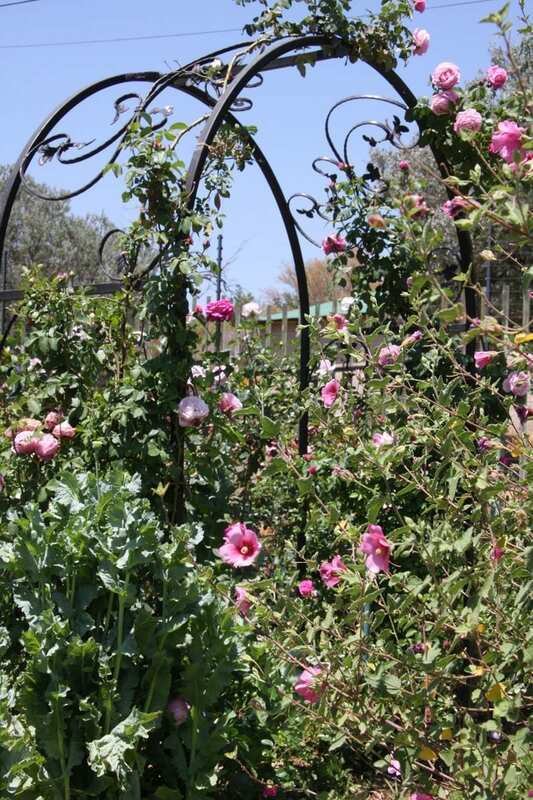 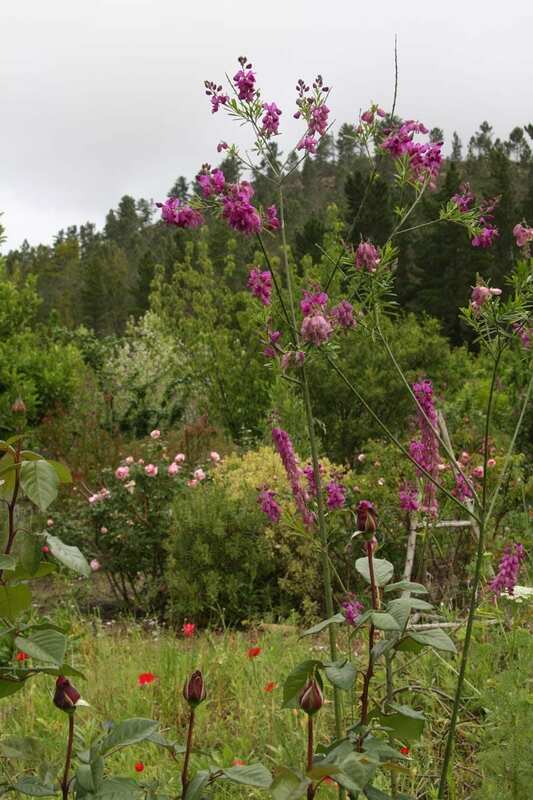 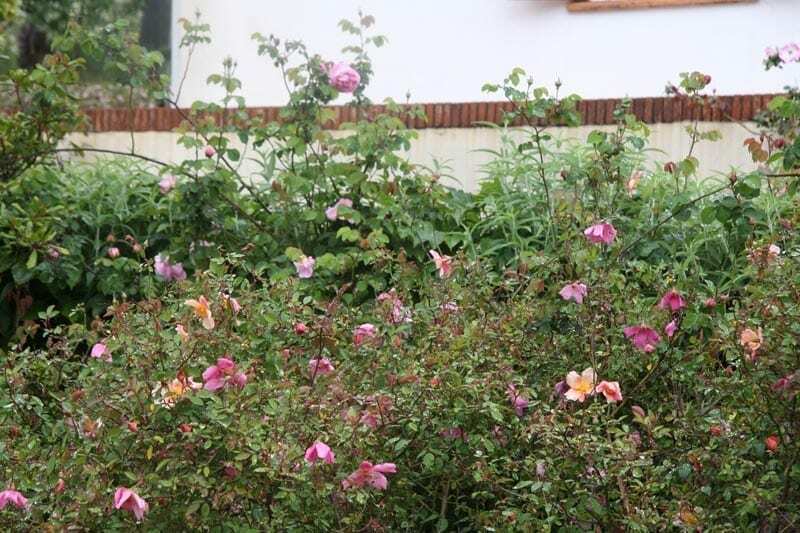 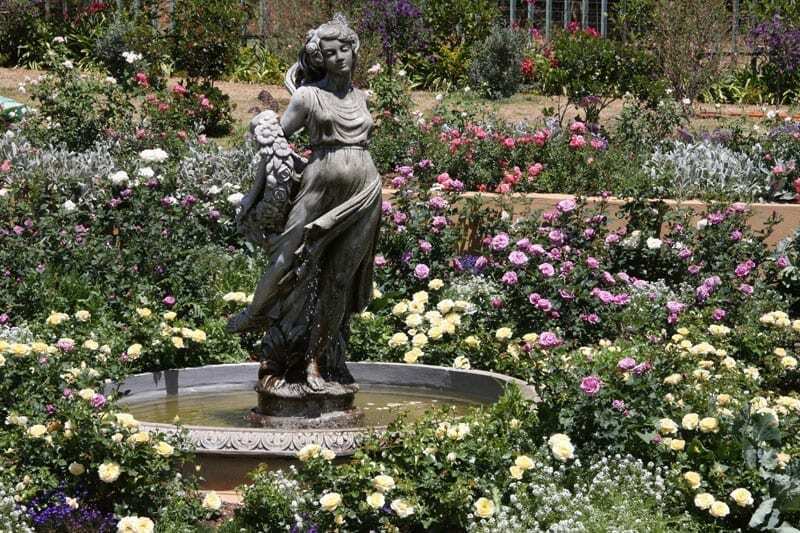 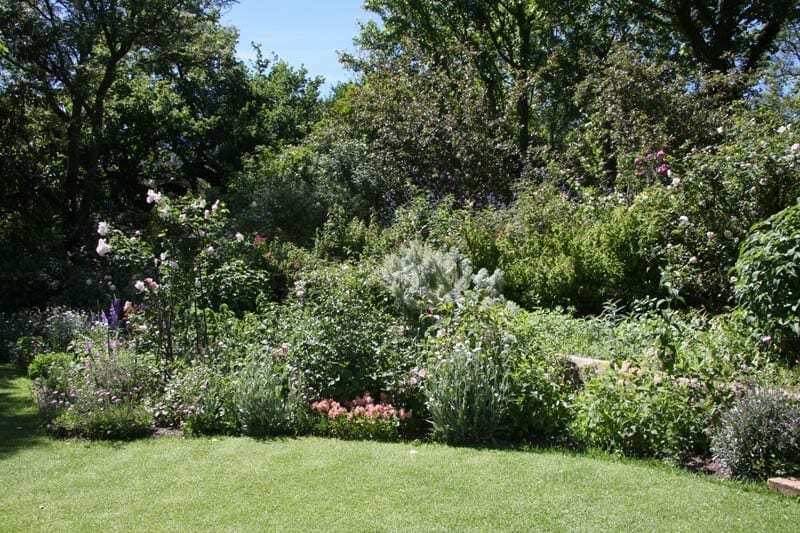 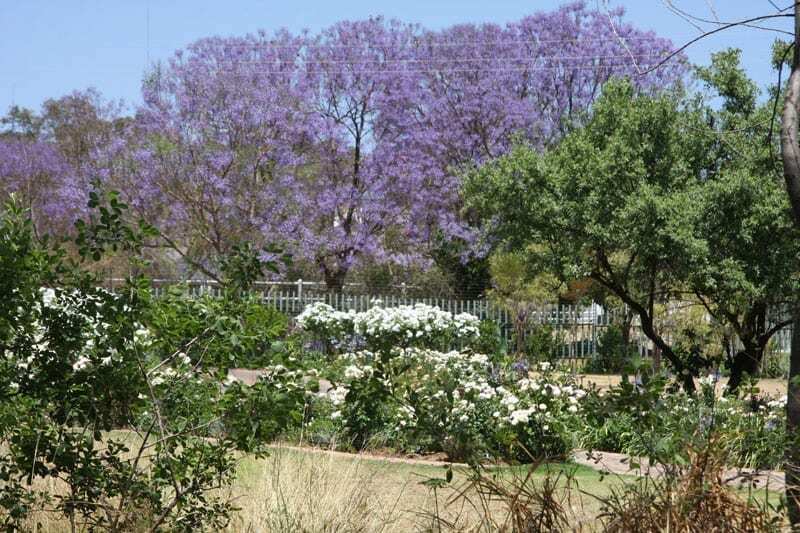 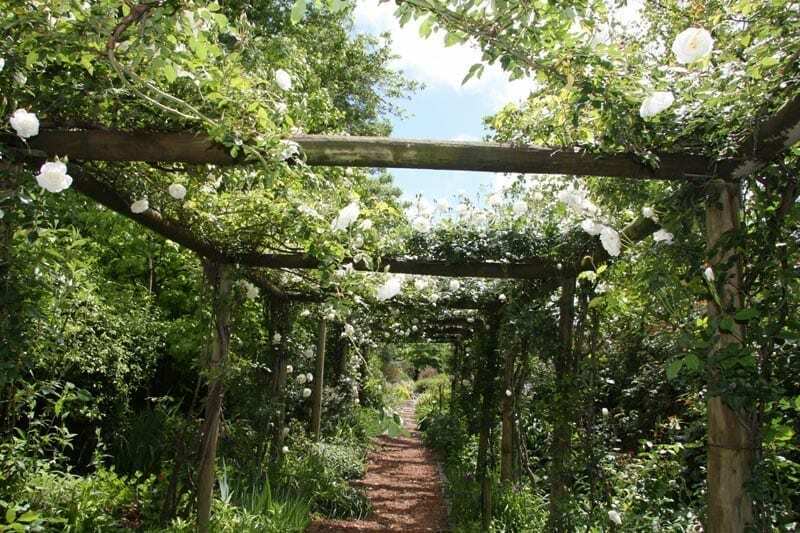 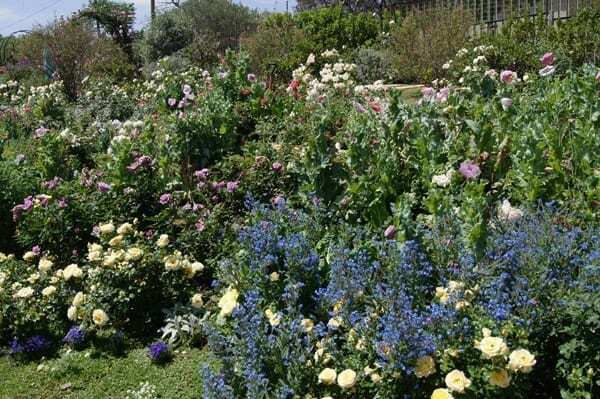 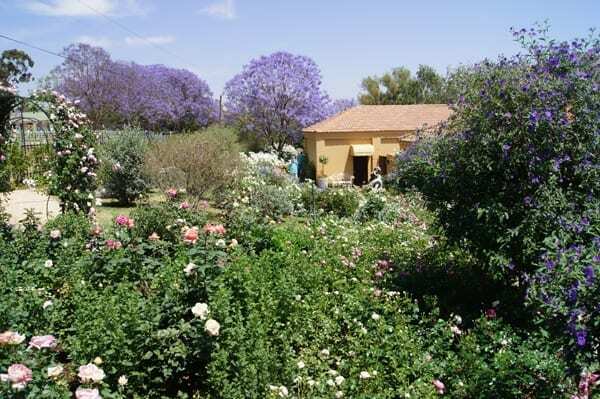 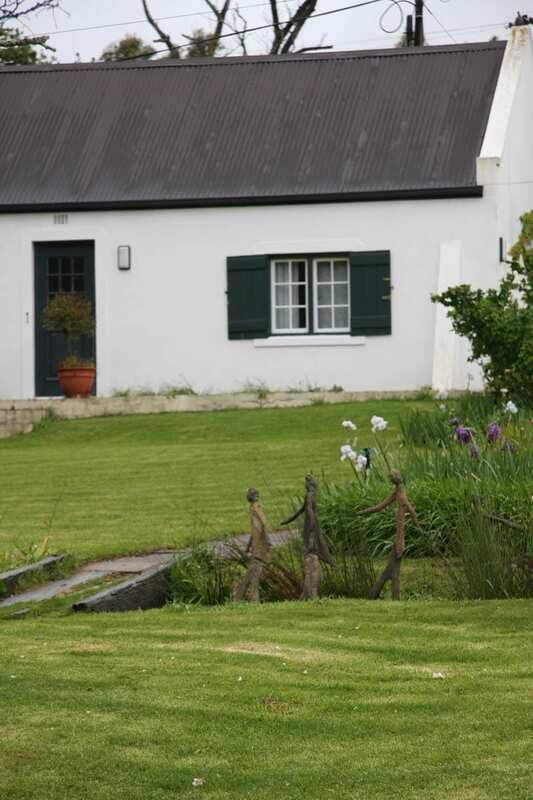 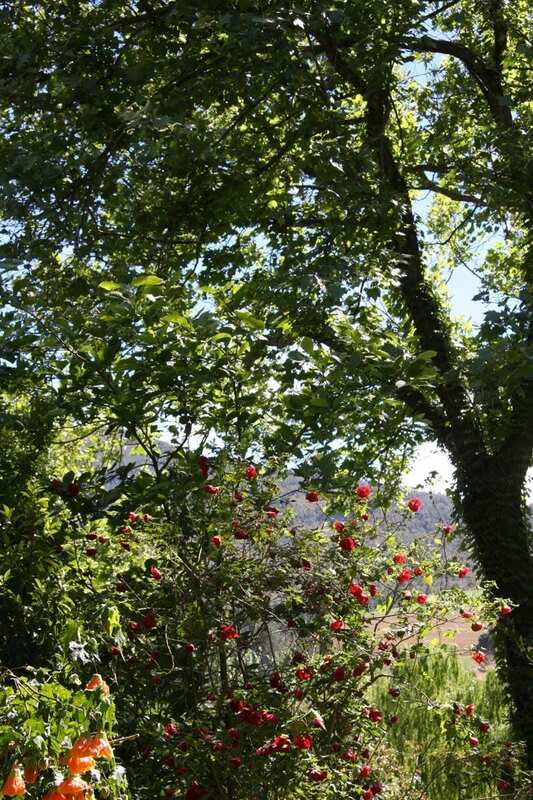 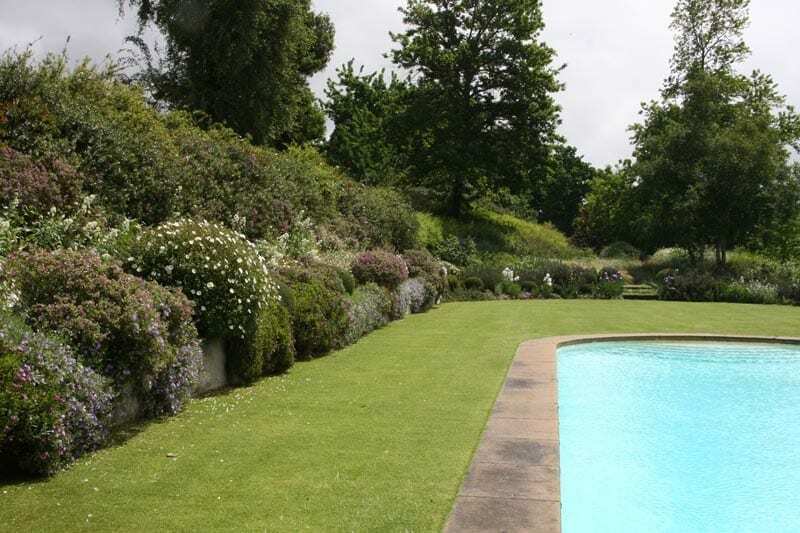 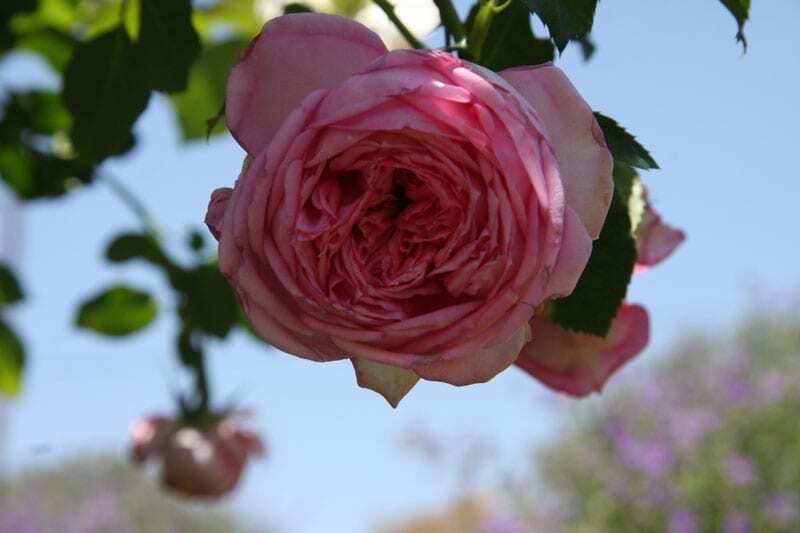 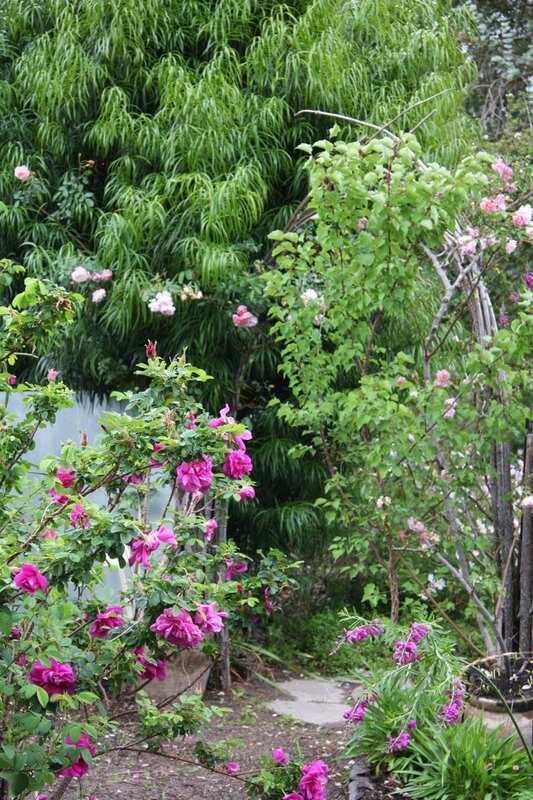 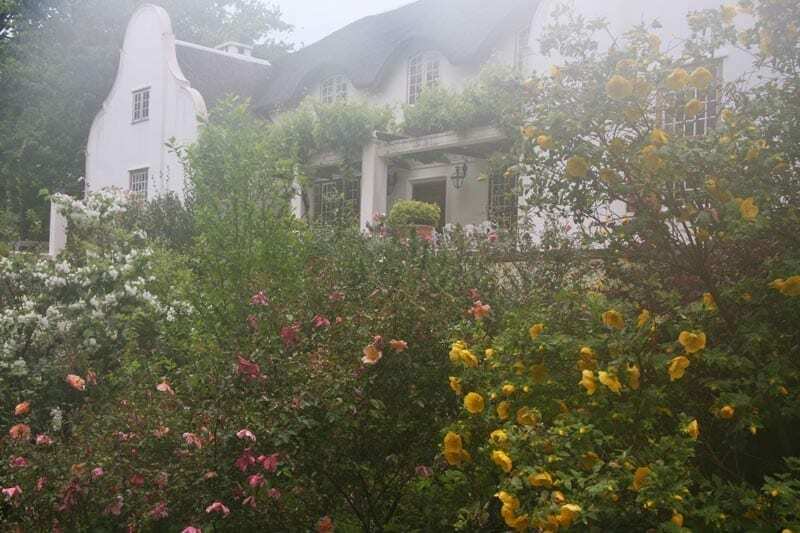 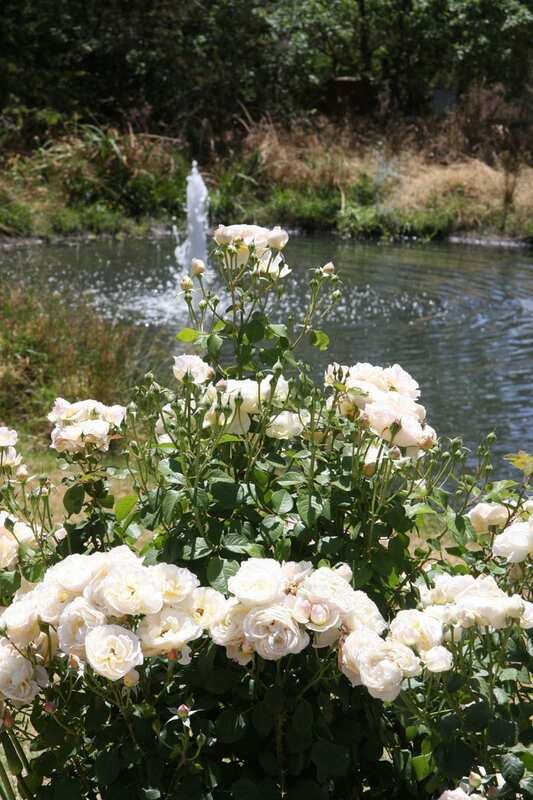 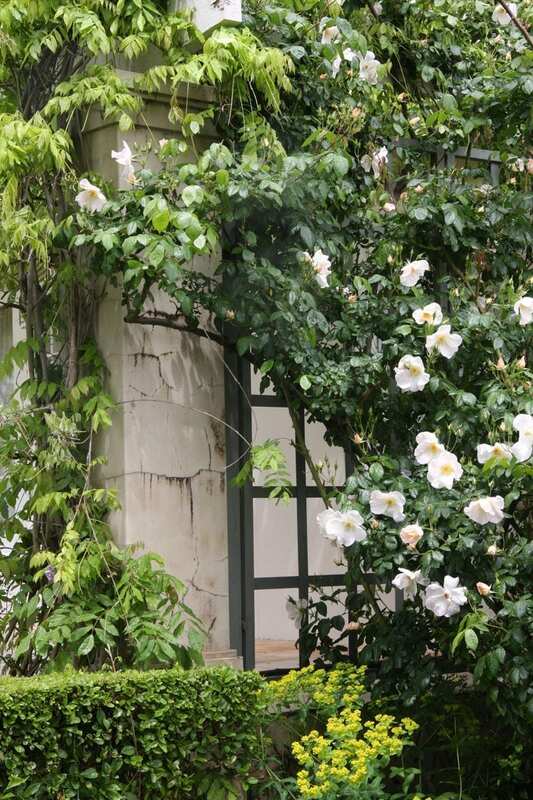 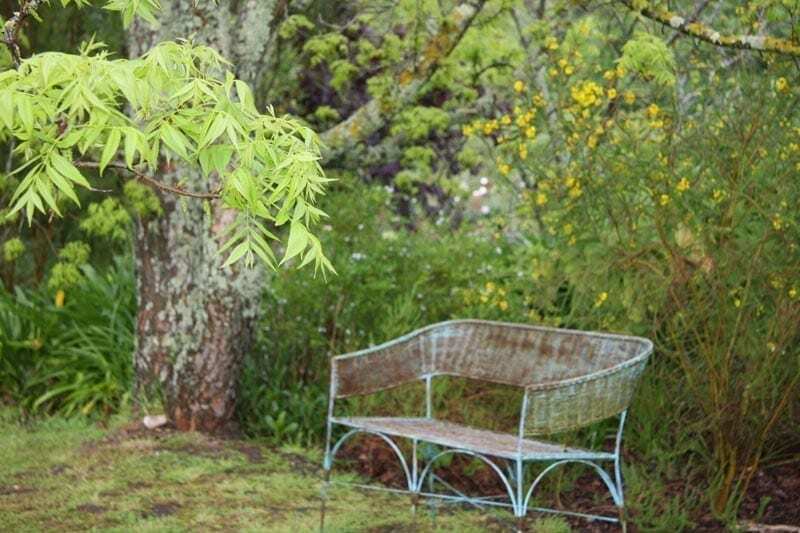 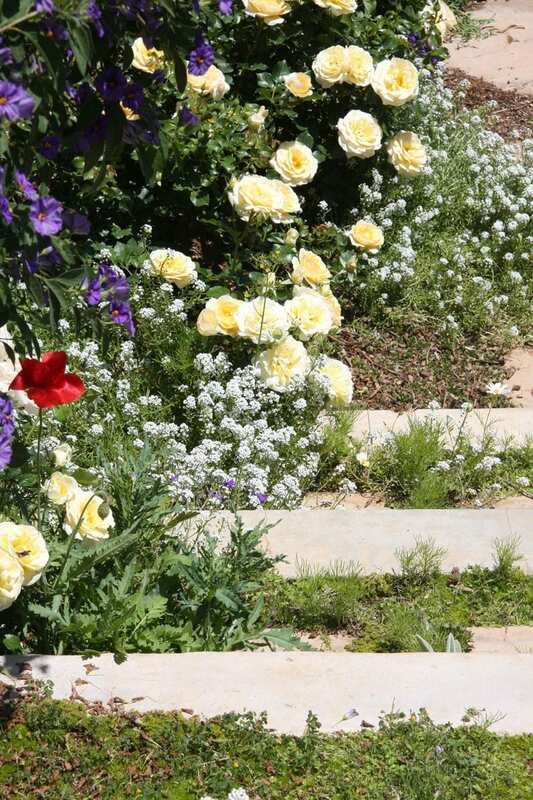 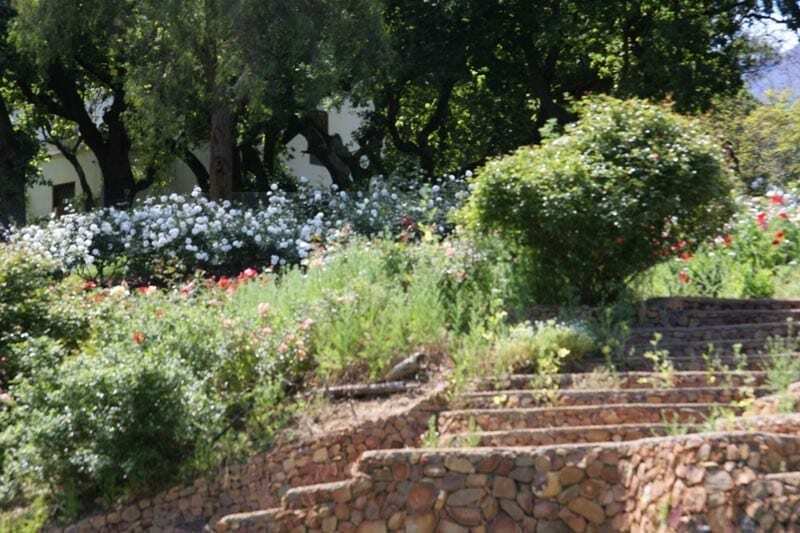 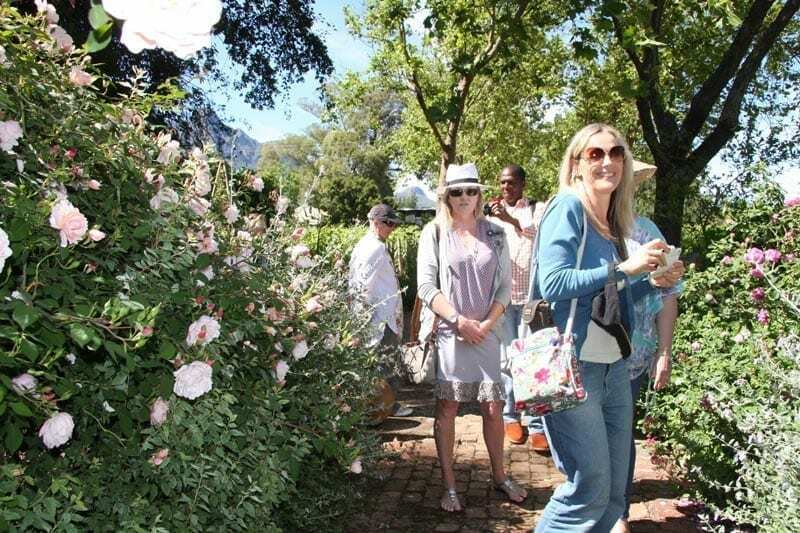 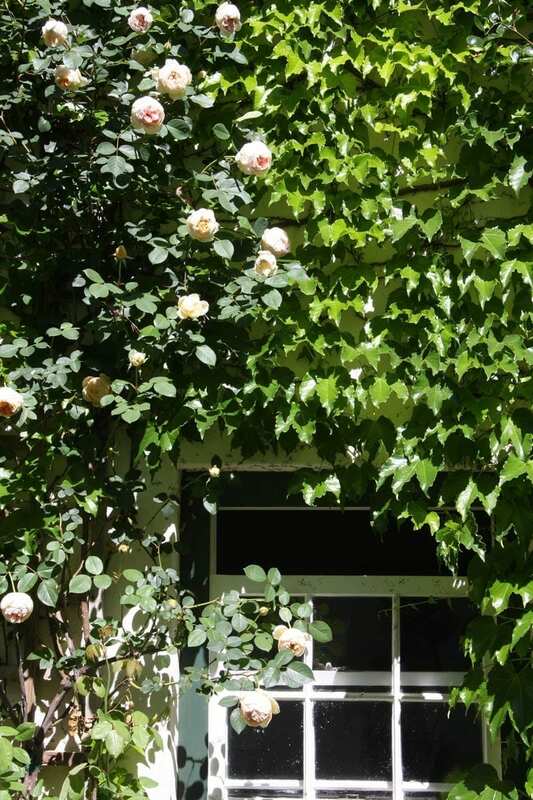 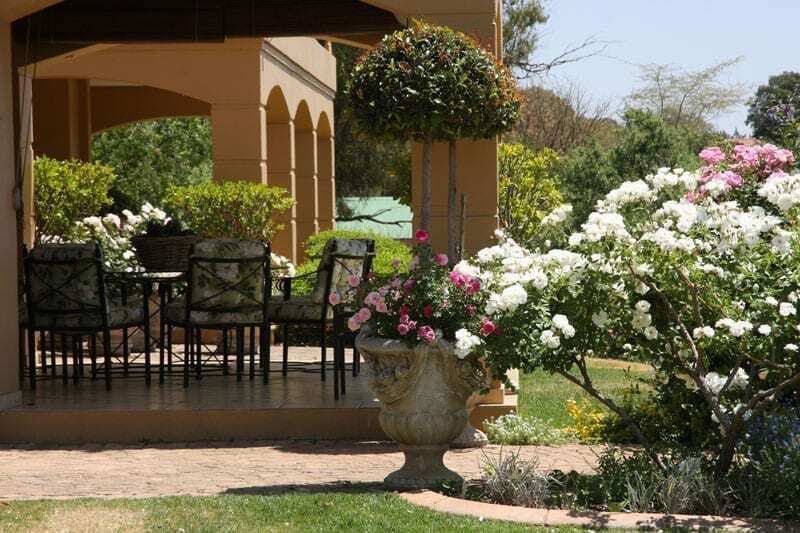 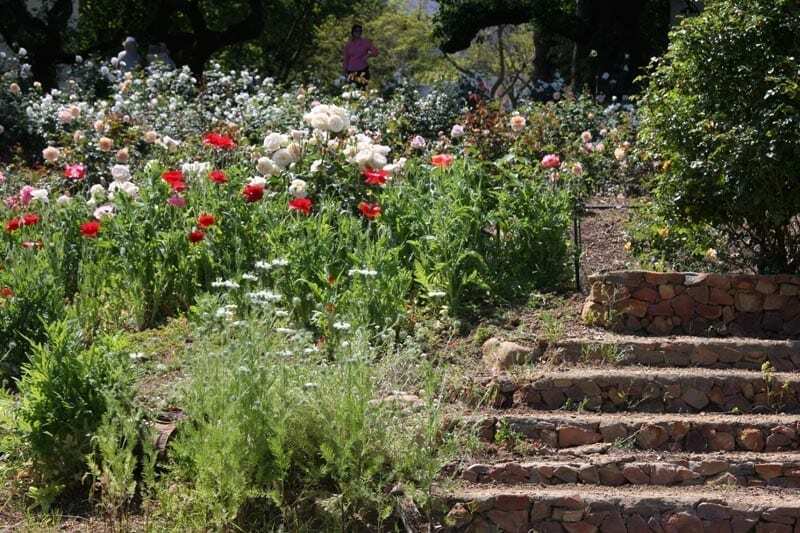 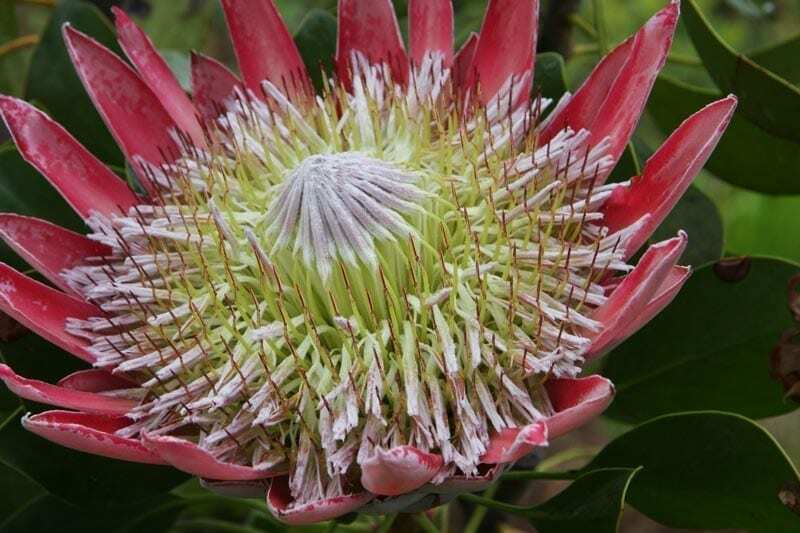 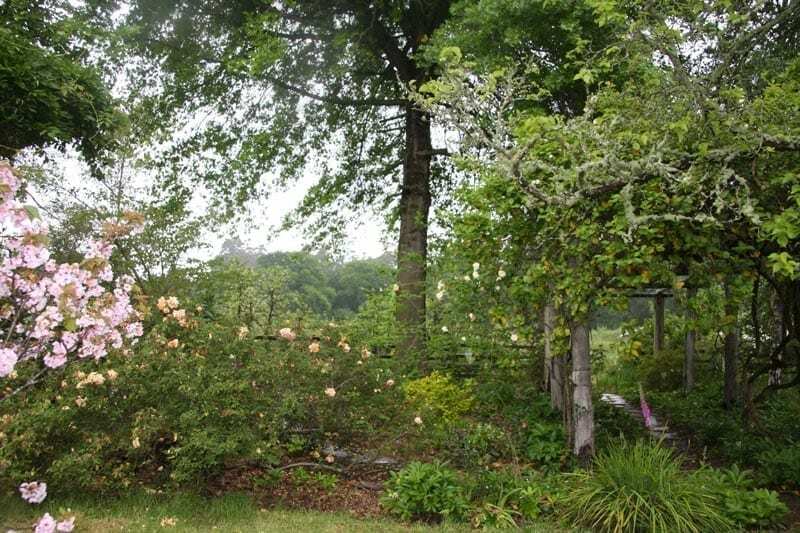 A gallery of private rose gardens from all corners of Southern Africa. 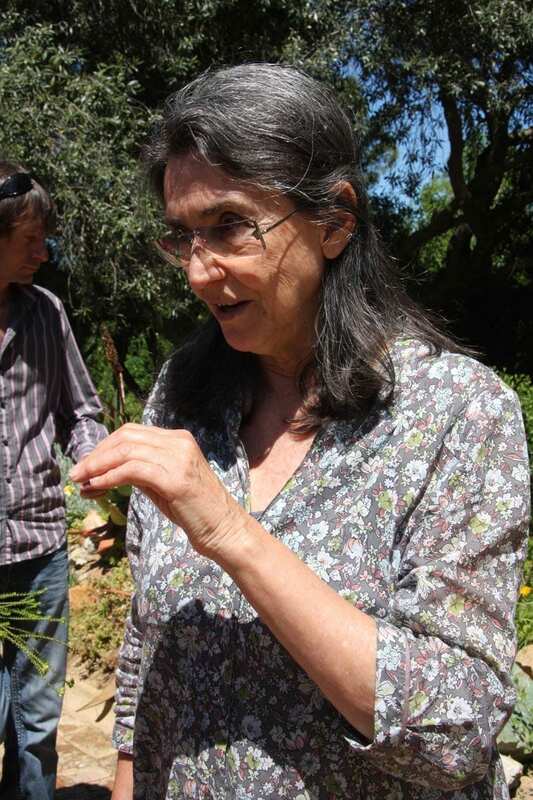 Palmiet, Grabouw – Wanda Molteno. 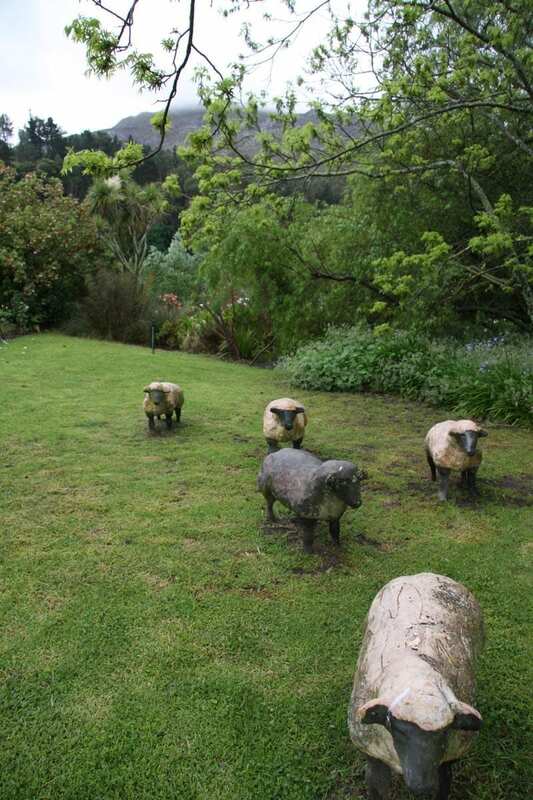 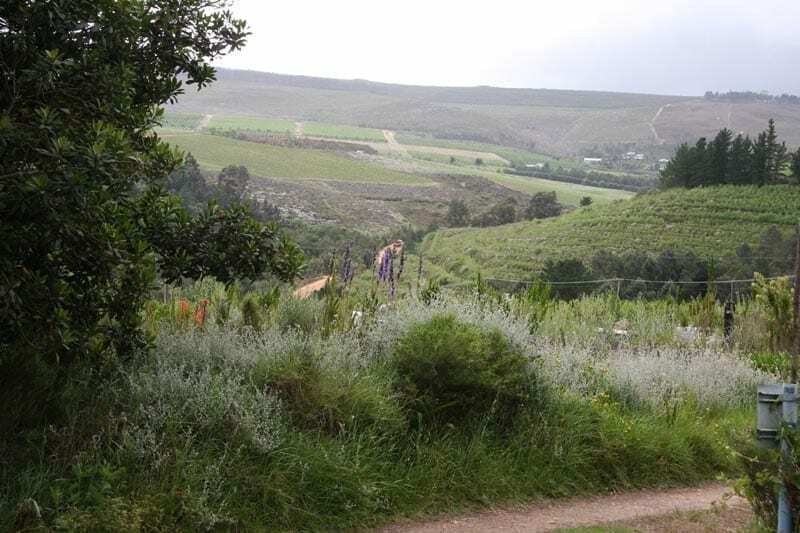 Klein Optenhorst, Wellington, by Jenny Ferreira. 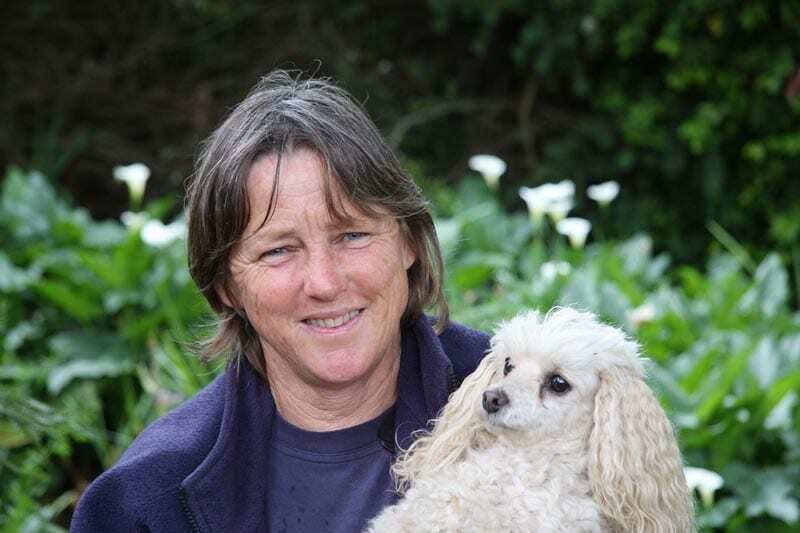 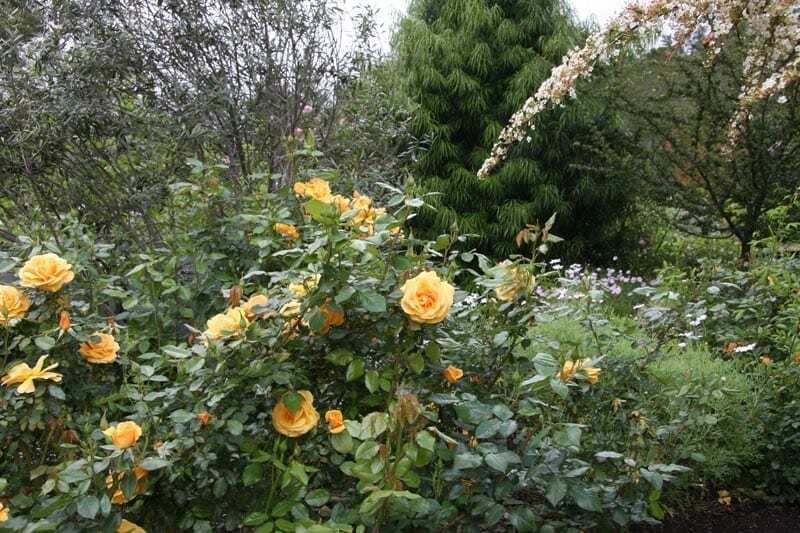 “I fell head over heels in love with roses when I went on a rose tour organised by Ludwig’s to Italy and Bulgaria about five years ago. 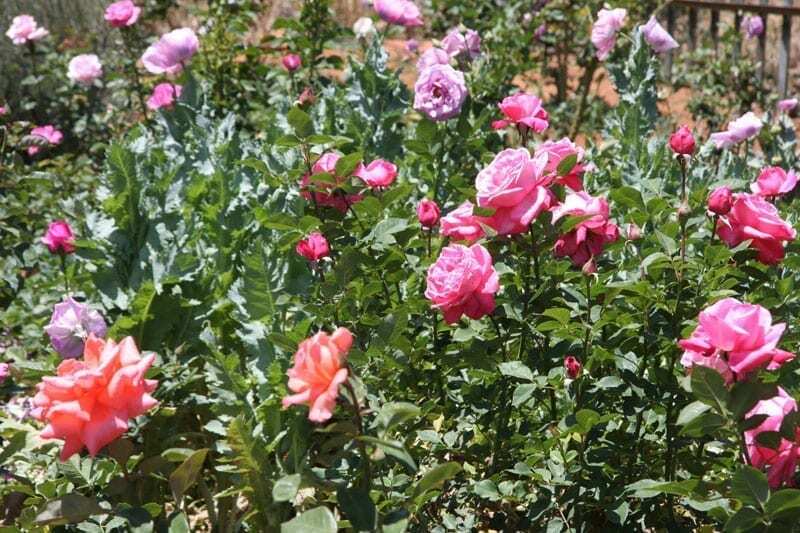 In Bulgaria we went into the fields where the Damascene roses were growing. 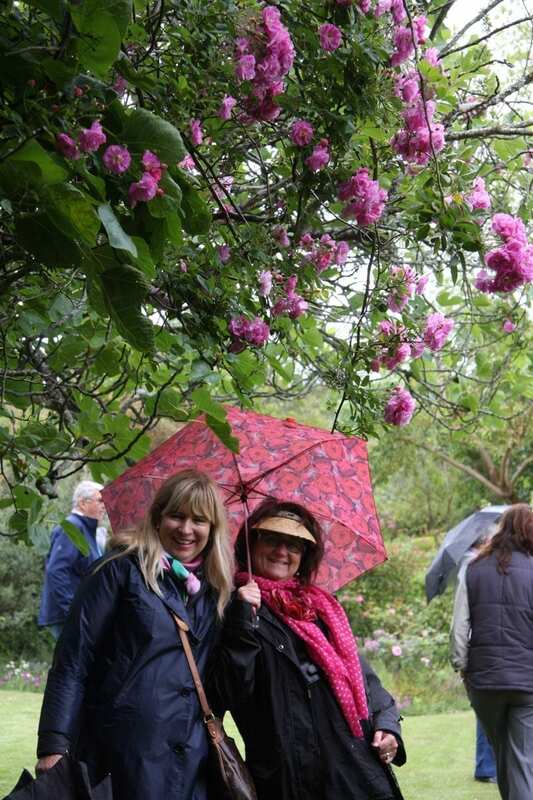 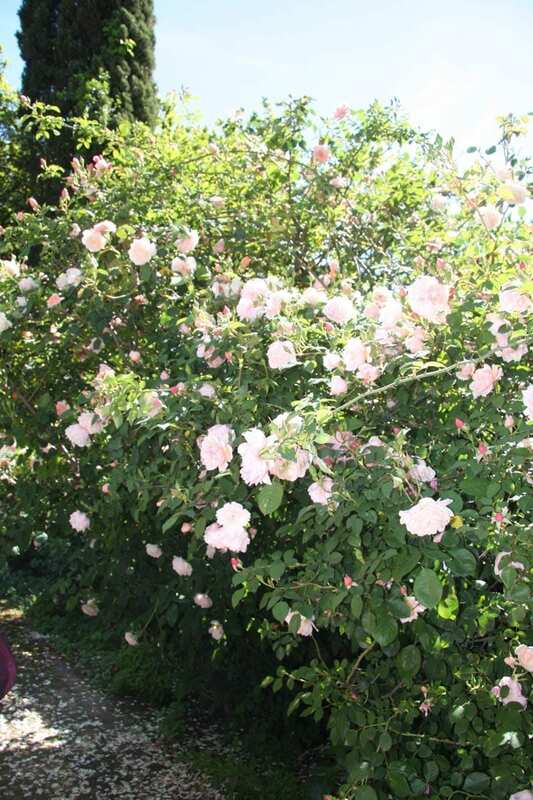 We were allowed to pick the rose petals and smell the roses taken straight from the enormous wild rose bushes. 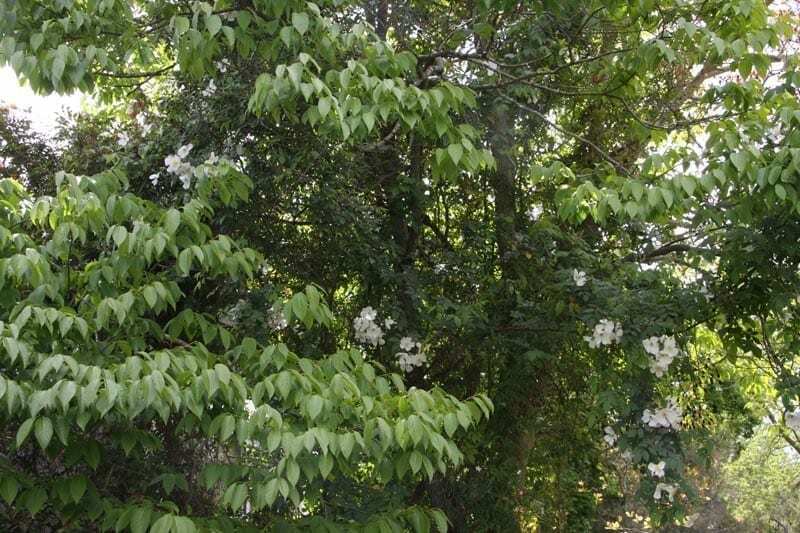 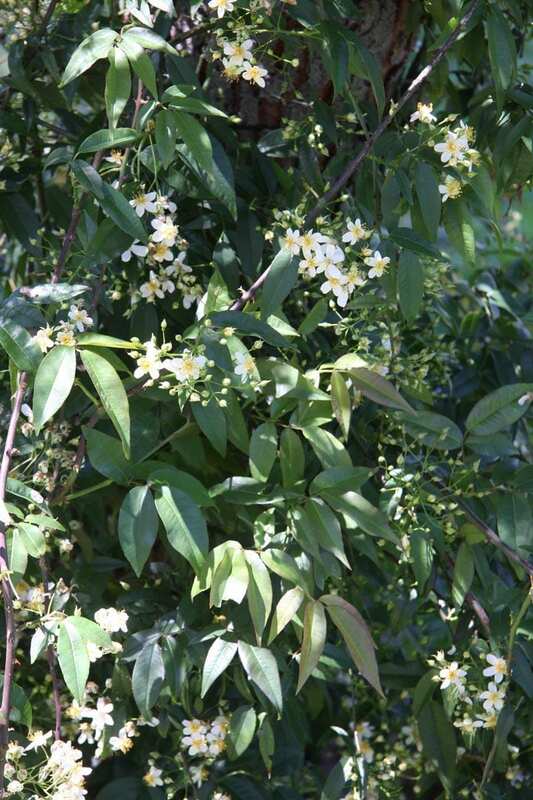 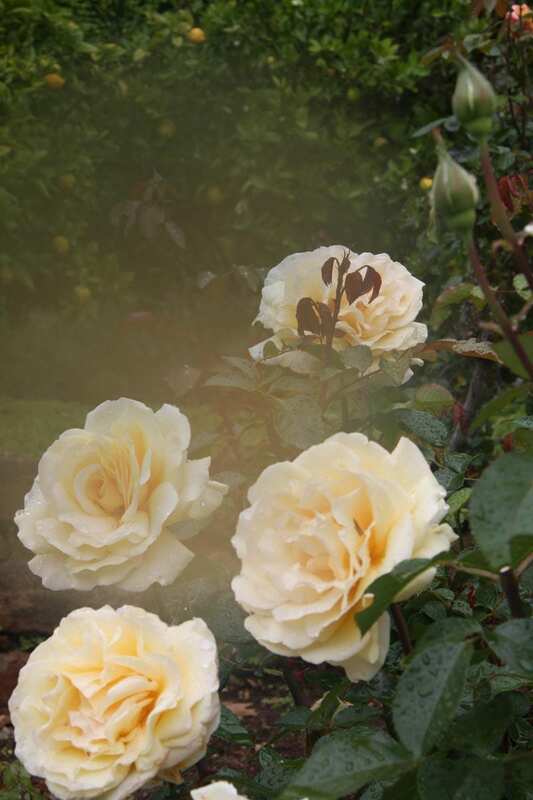 This experience of smelling the lemon essence of the Damascene roses has stayed with me to this day! 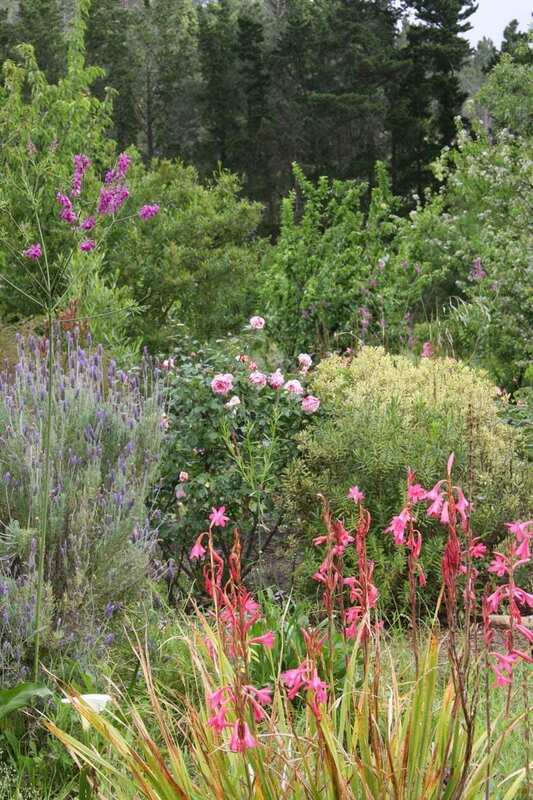 I was hooked! 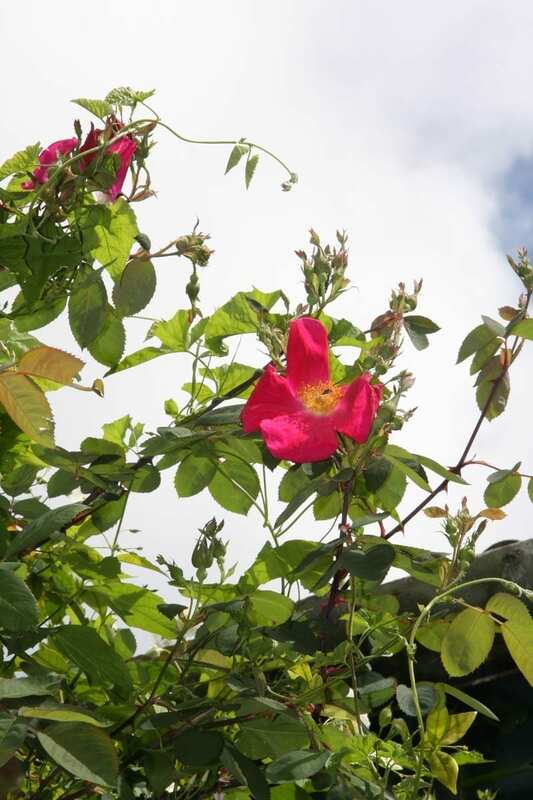 We experienced the loading of four tons of rose petals into vats, which will produce, one kilo of pure rose oil. 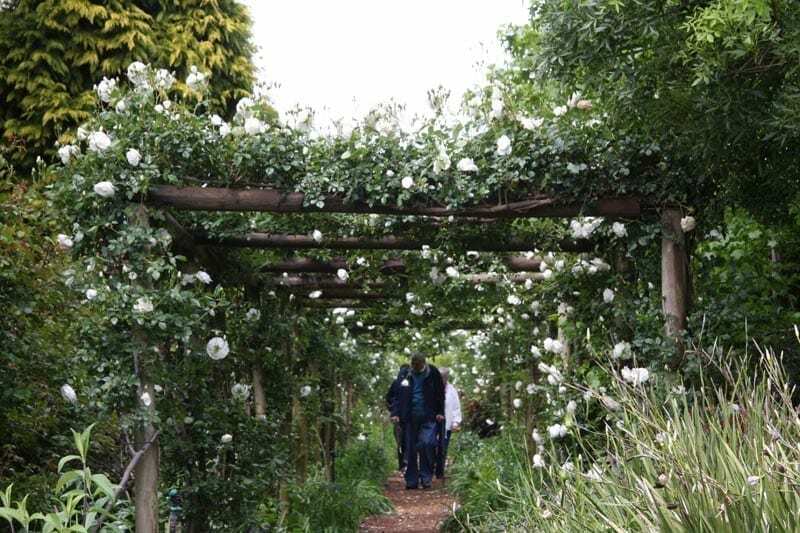 This was the start of a journey which would take me to many more countries to experience roses; the trial gardens of Monza, to Cavriglia, Carla Fineschi rose gardens, where a large number of roses are wild roses which have been collected from all over the world, and to Ireland and soon to India, then France for the World Rose Convention and Beijing. 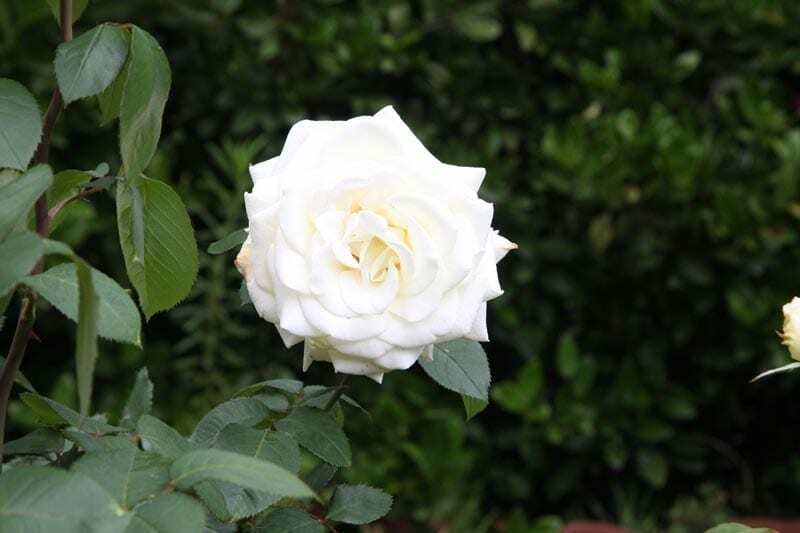 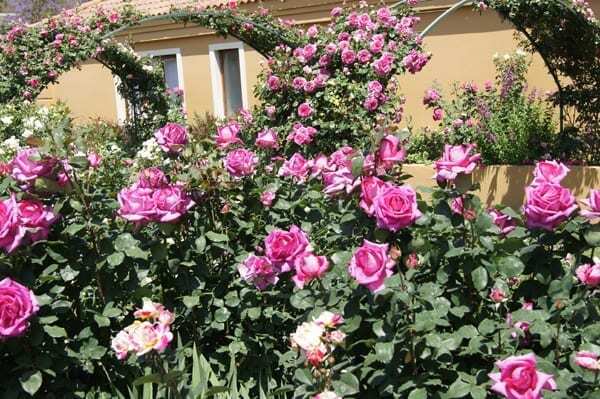 The love of the rose is in my spirit and is with me always, in everything that I do in my home and garden. 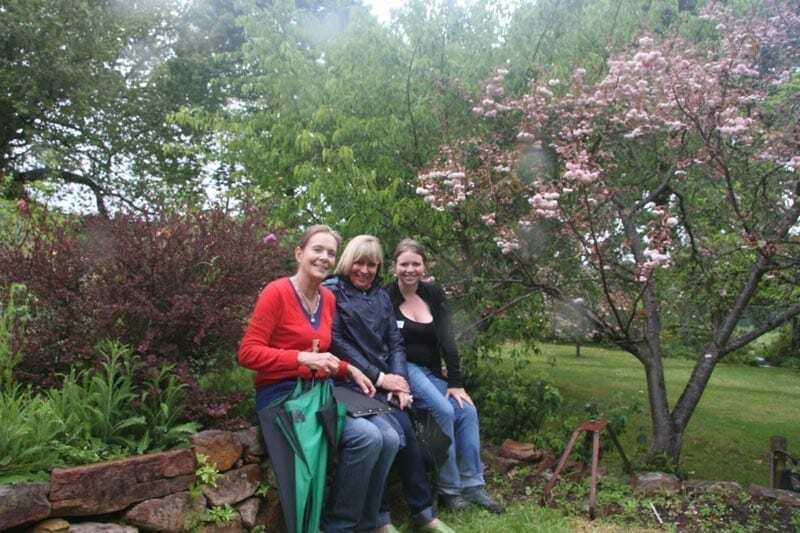 It has connected me with friends and people all over the world, and it has reared its head in so many ways in my life in the past five years. 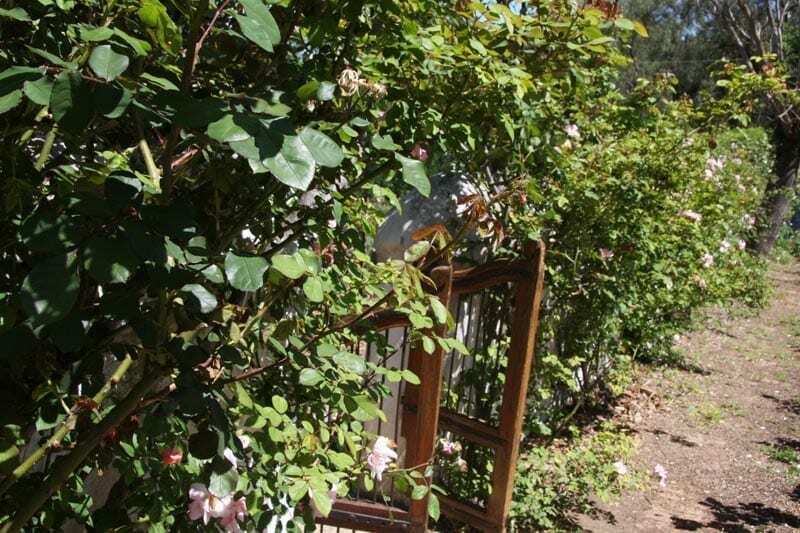 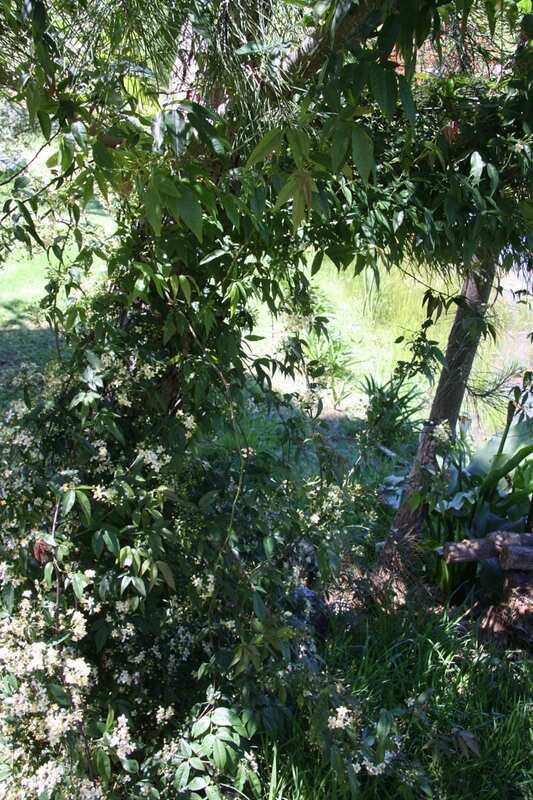 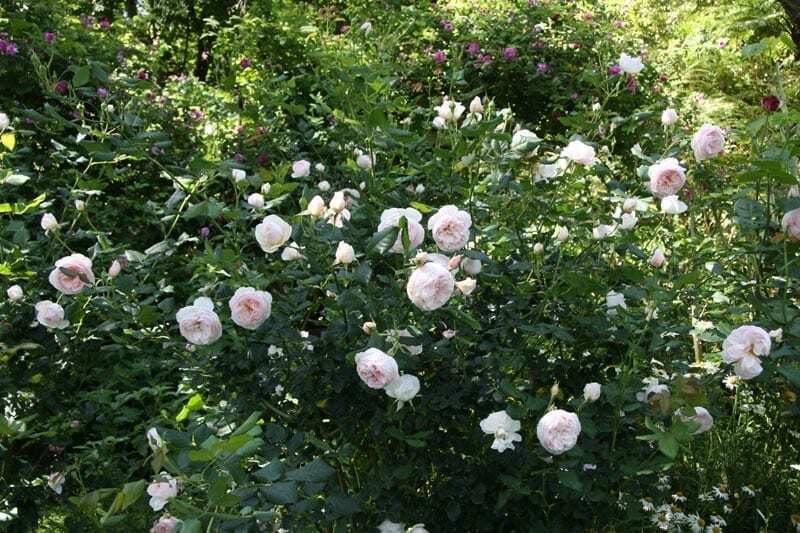 And so this is how my garden was transformed from an ordinary garden with a few Iceberg roses growing up my driveway to one filled with 4000 rose bushes. 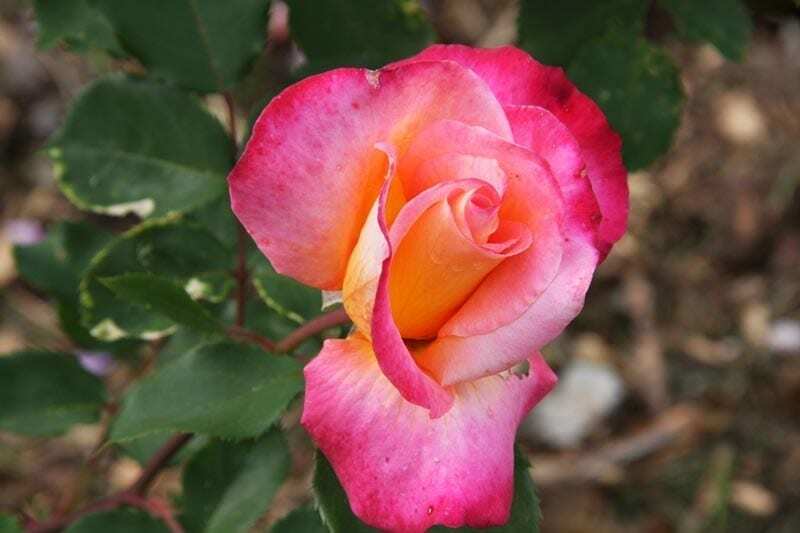 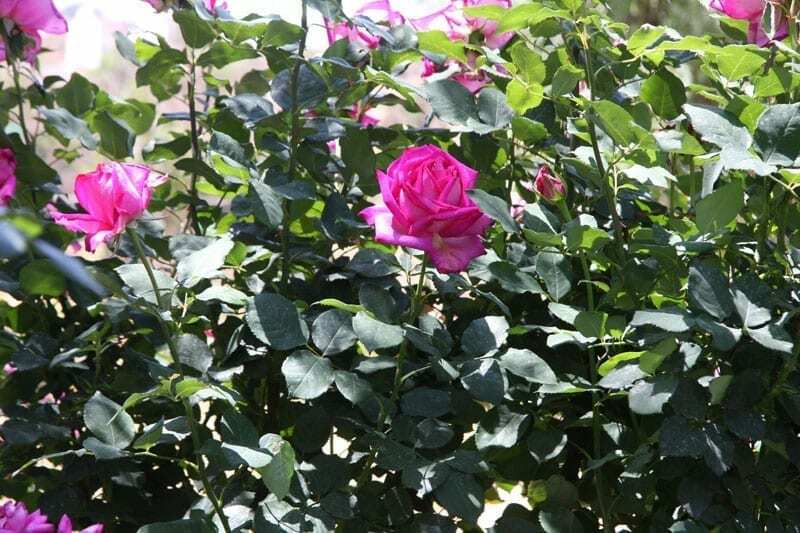 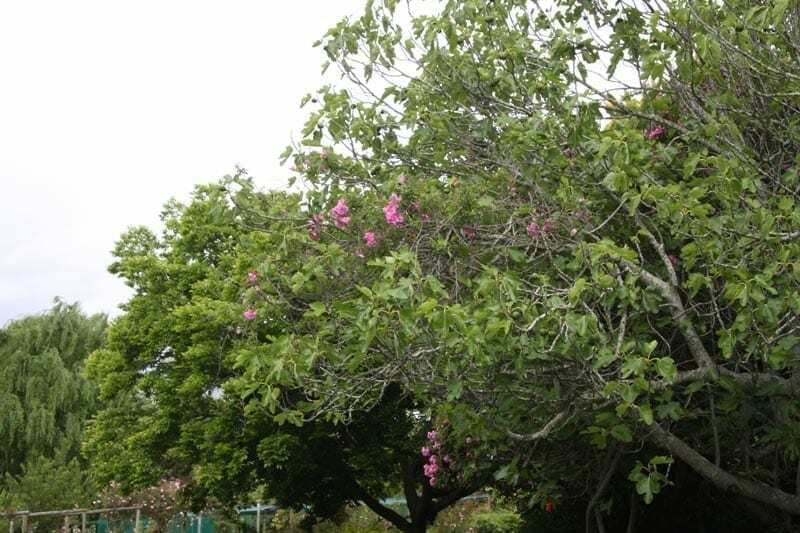 There are 156 difference types of roses in the garden including Hybrid Tea, Floribunda, Climber, Panarosa, Spire, and ground cover roses. 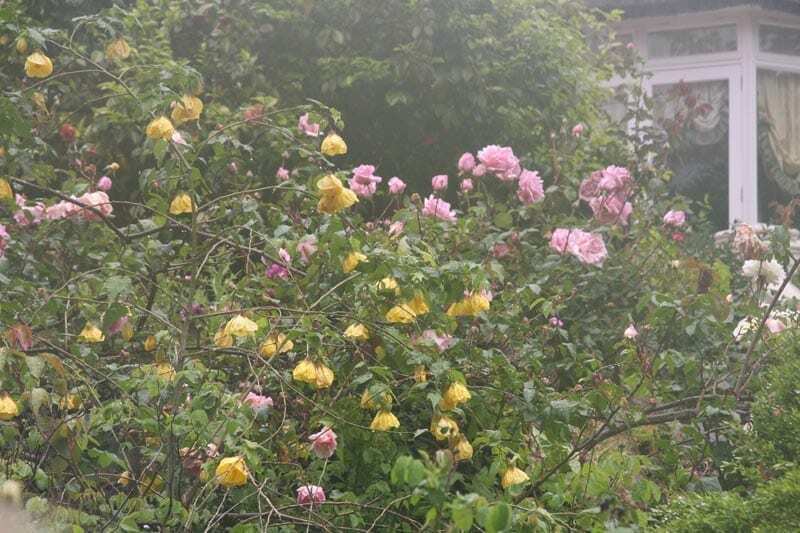 The colour scheme that appeals most to me is cream, white, pink, mauve and purple, and in some areas oranges and yellows. 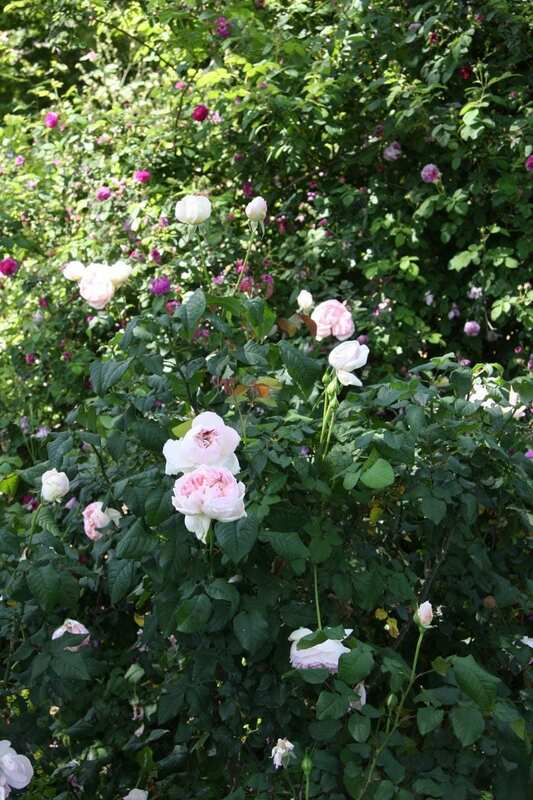 All these roses are bought at Ludwig’s Roses, where I also purchase everything I need to spray and feed the roses. 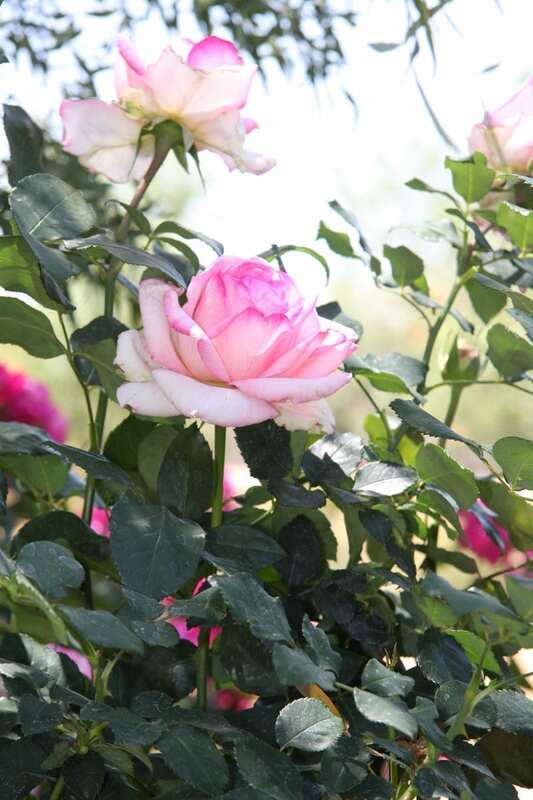 All the Ludwig’s staff are a great help when deciding what roses to choose. 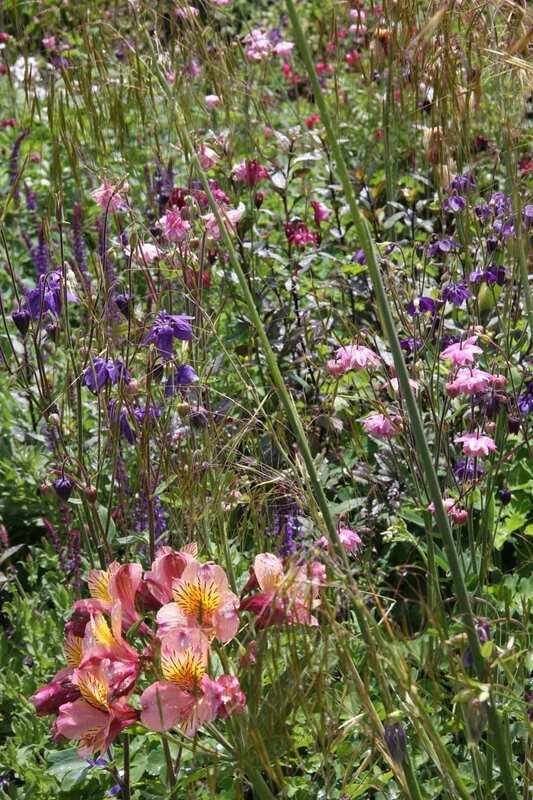 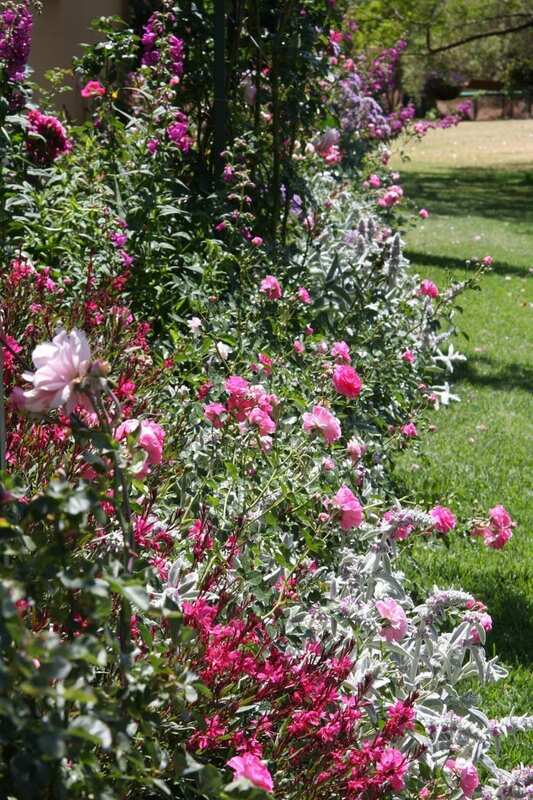 I love roses but prefer mixed beds. 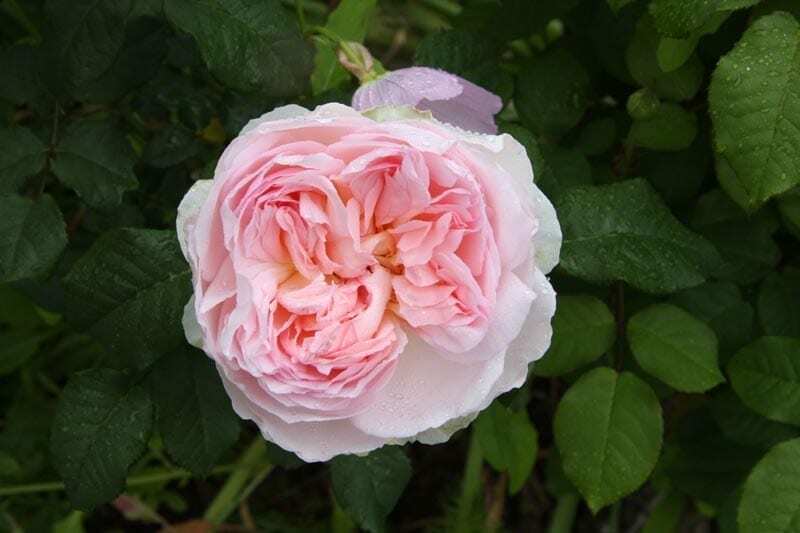 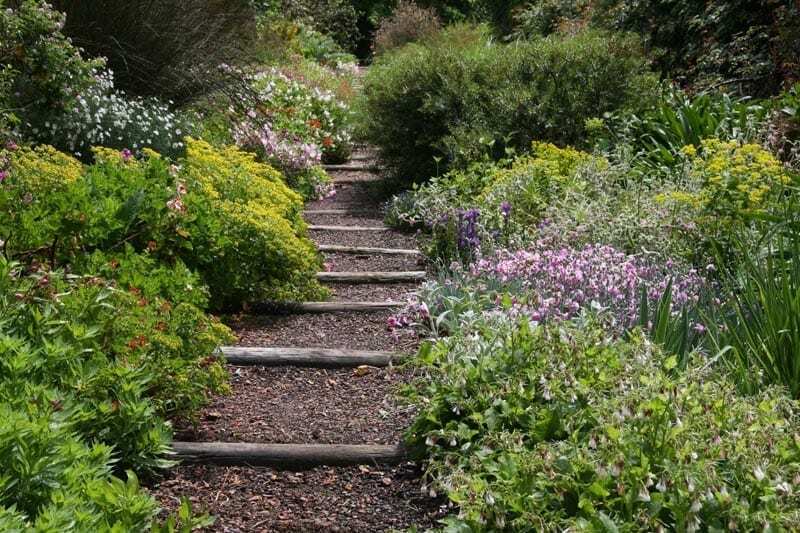 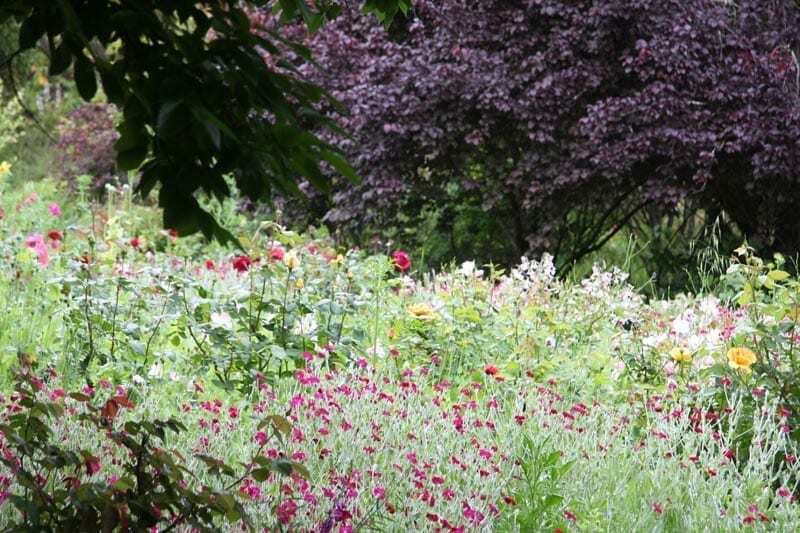 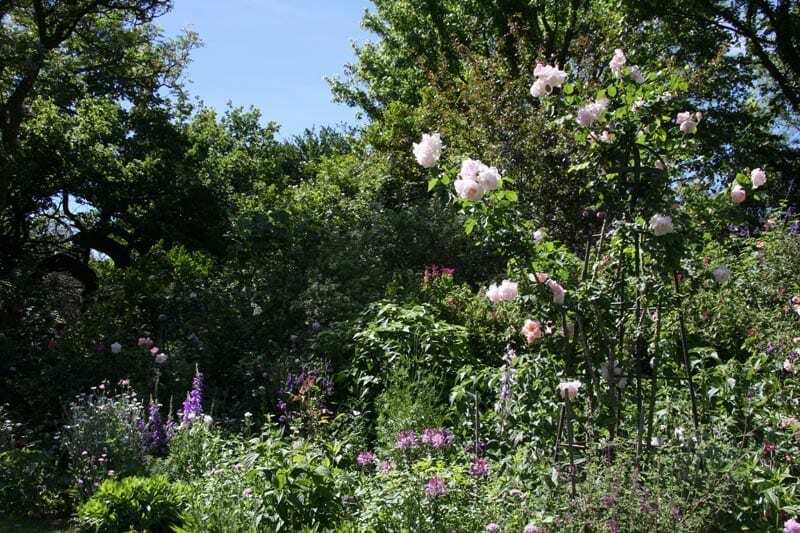 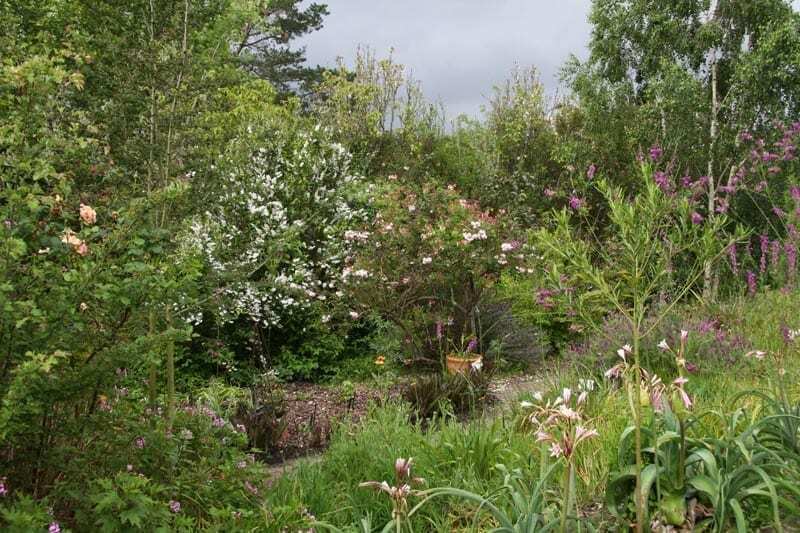 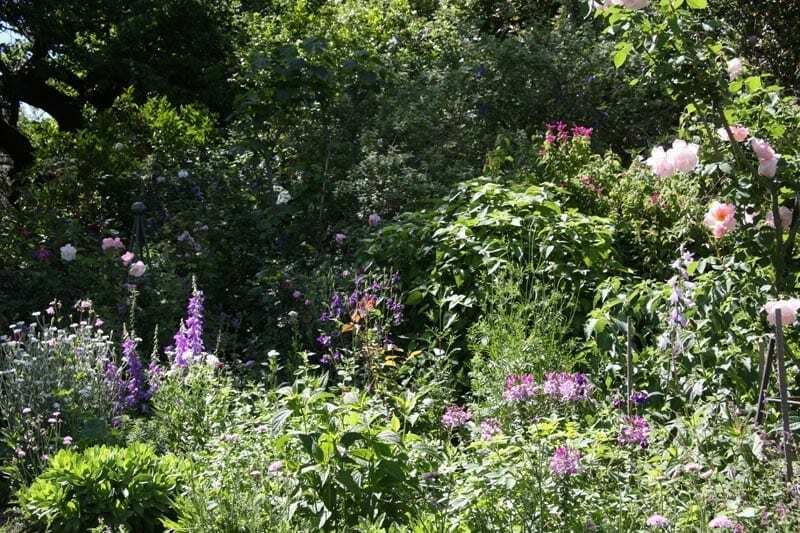 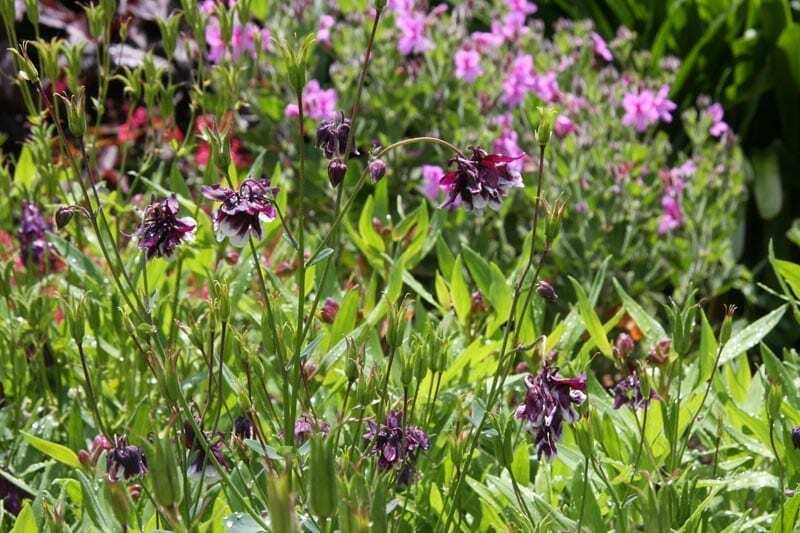 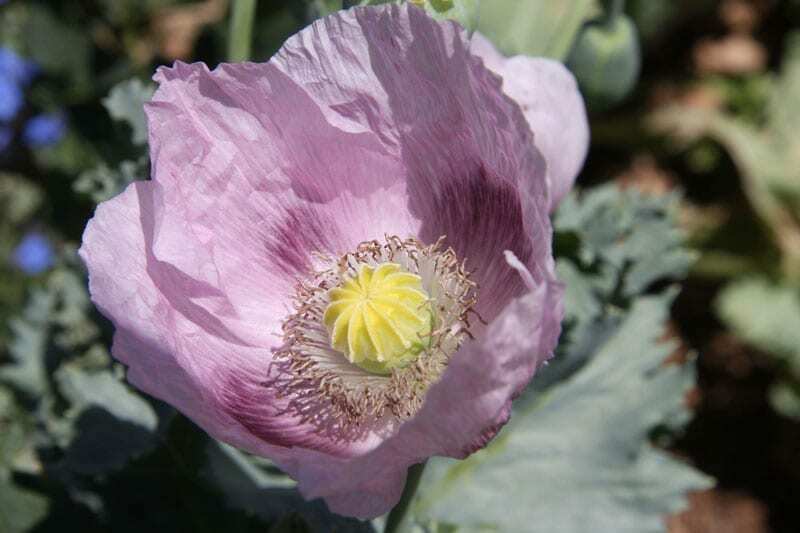 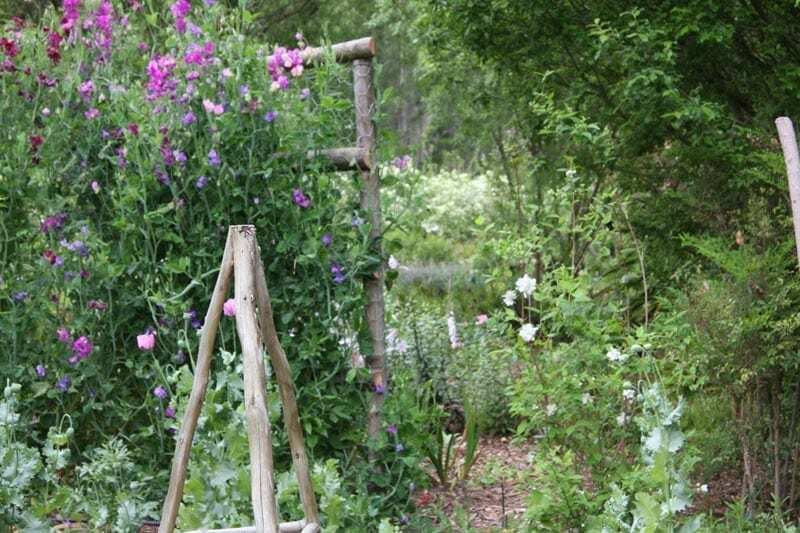 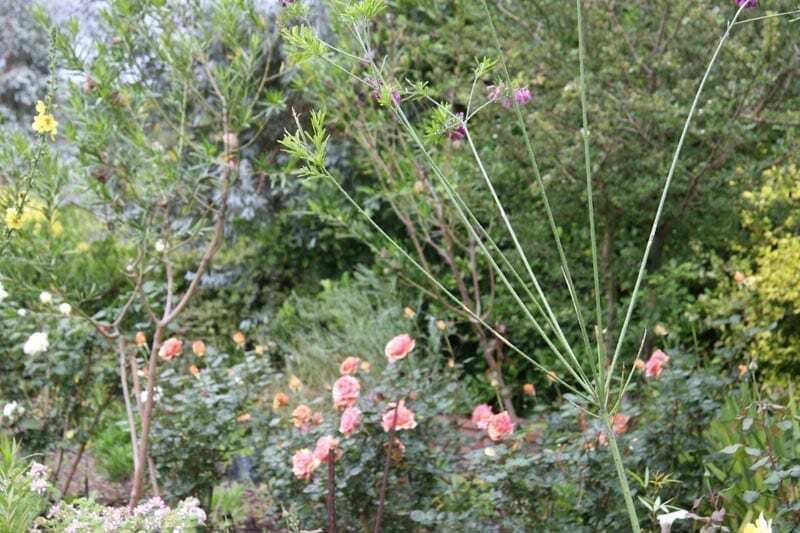 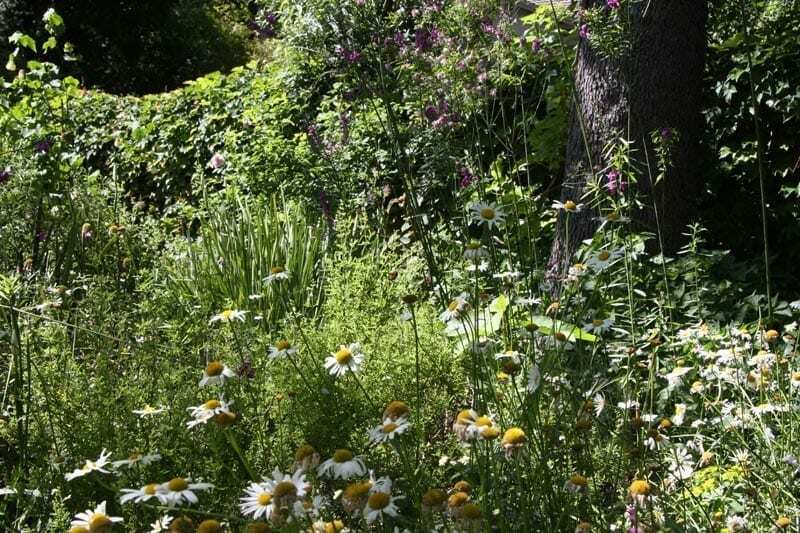 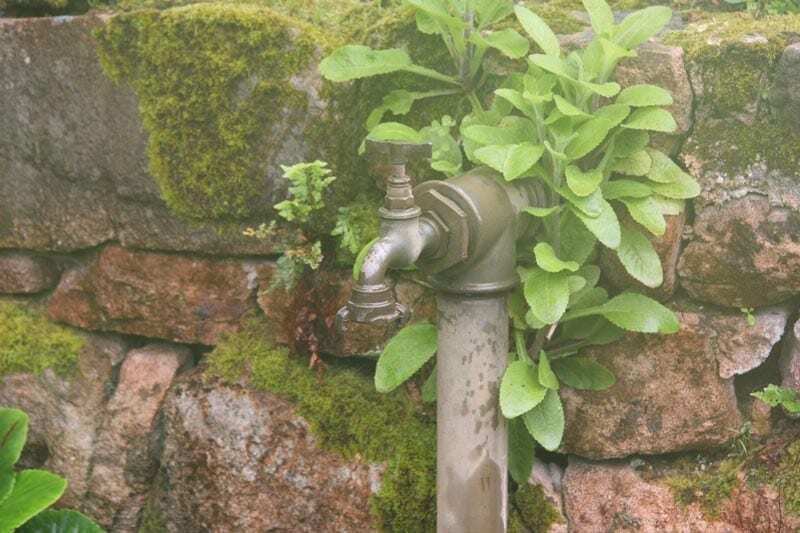 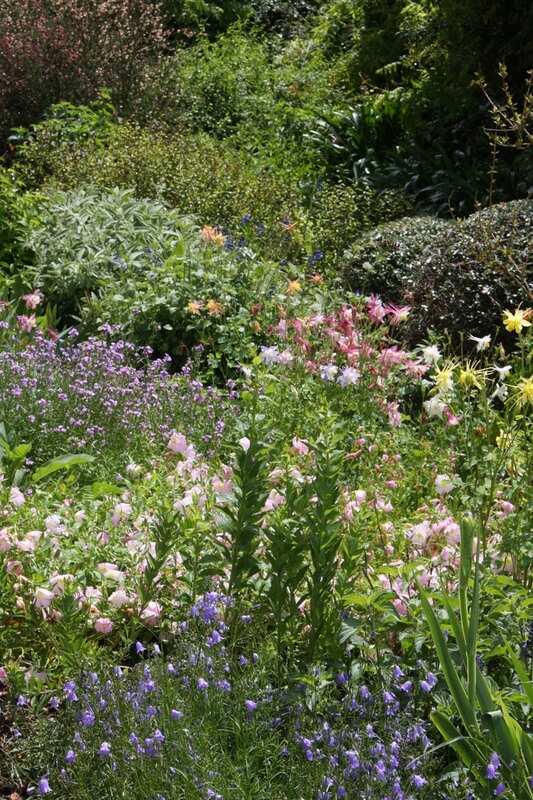 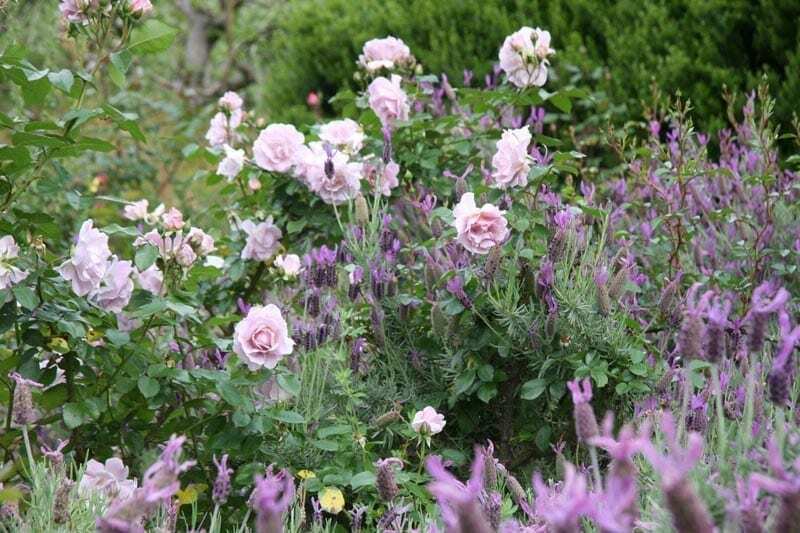 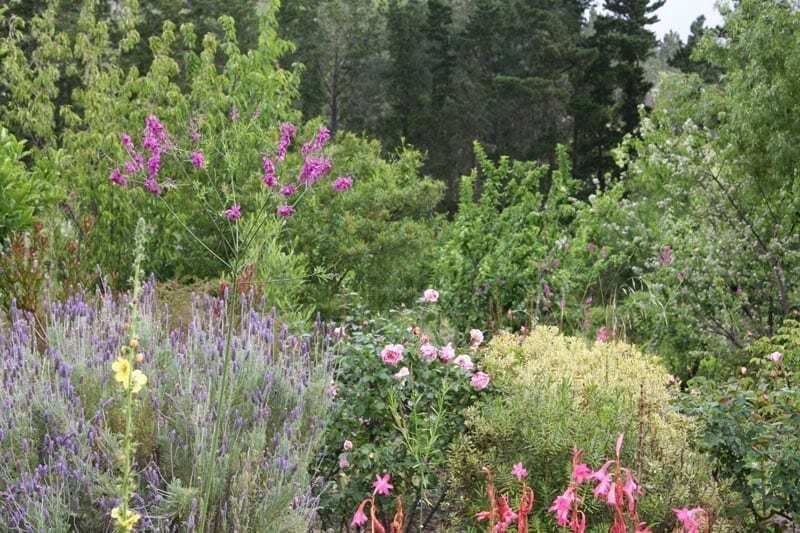 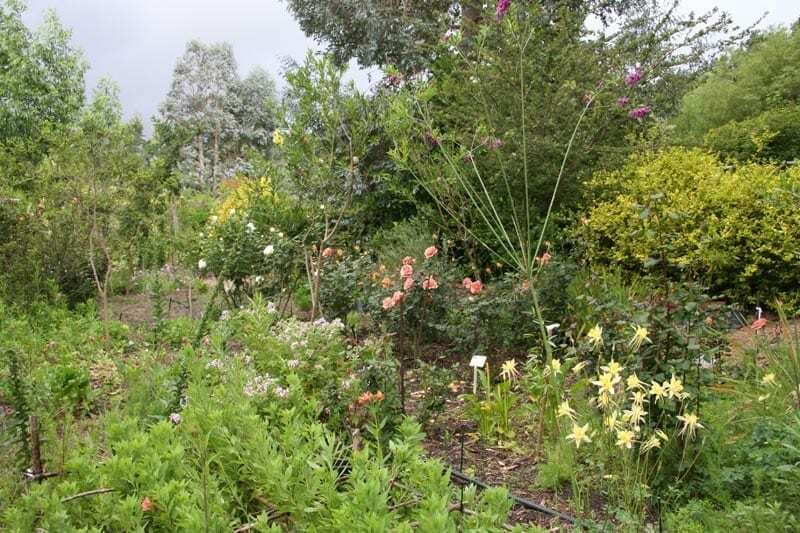 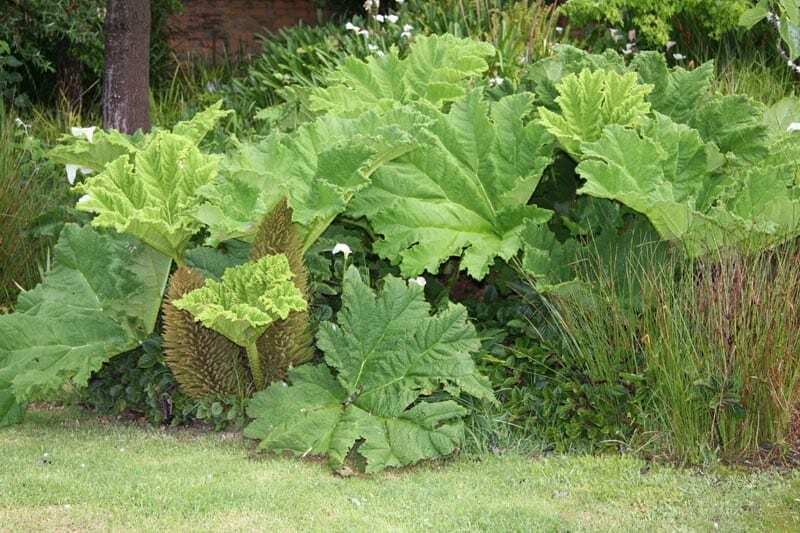 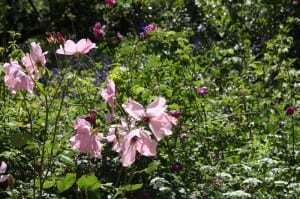 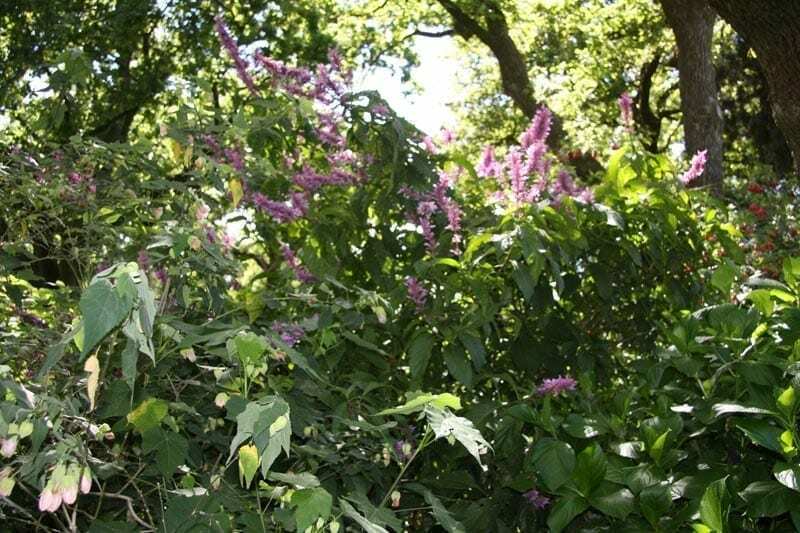 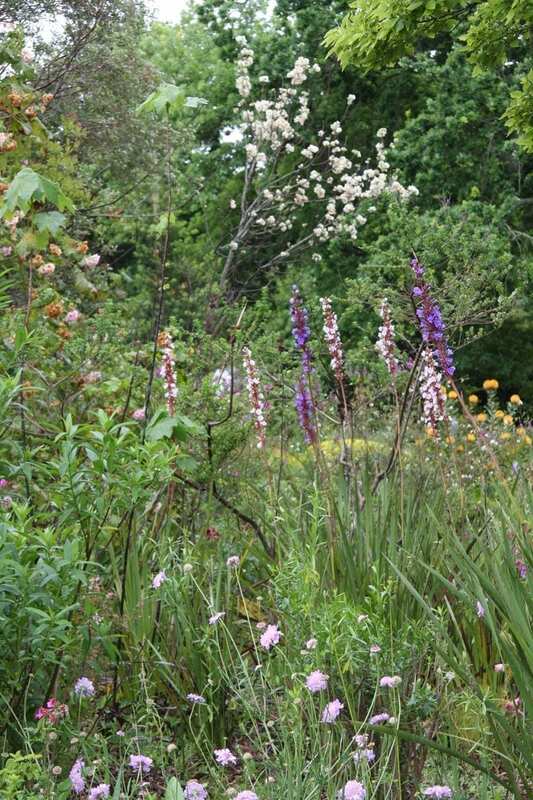 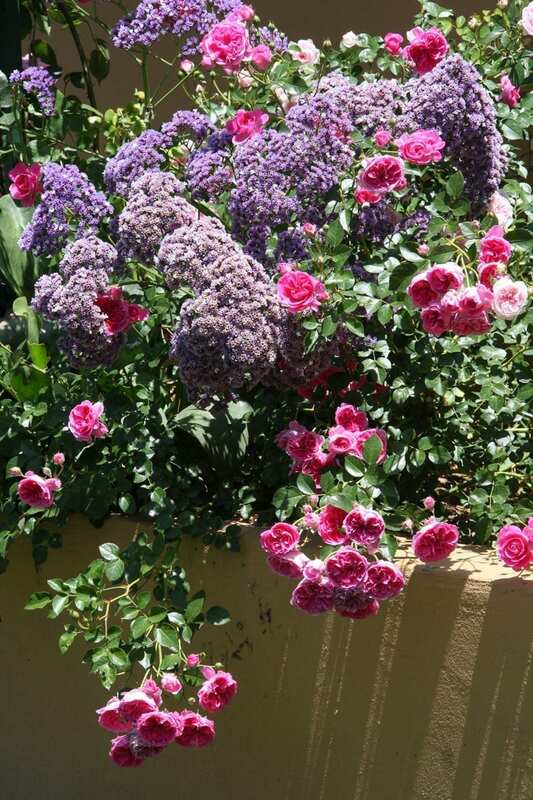 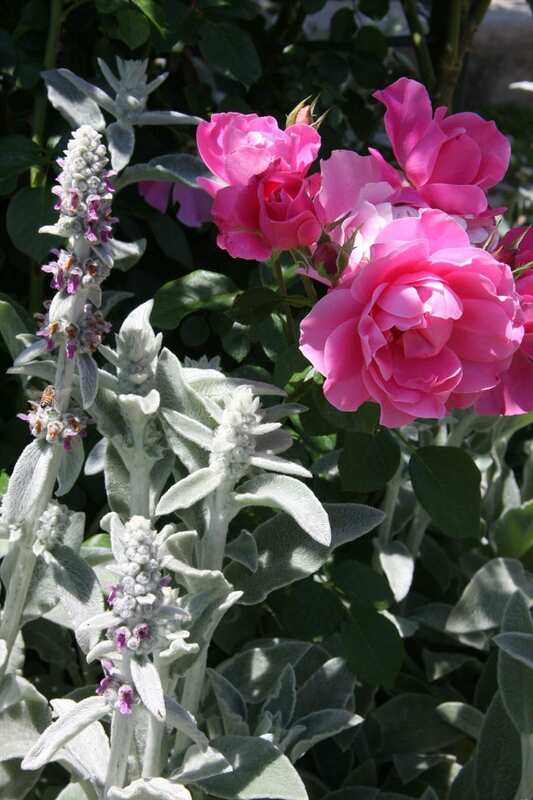 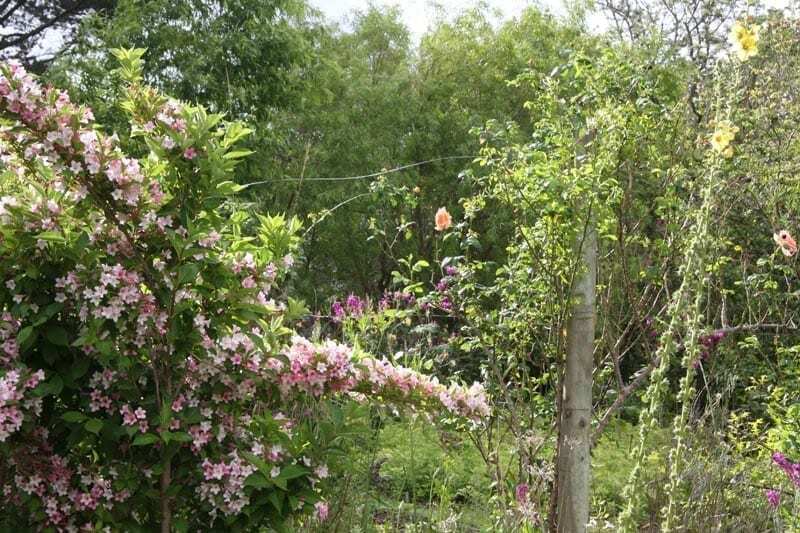 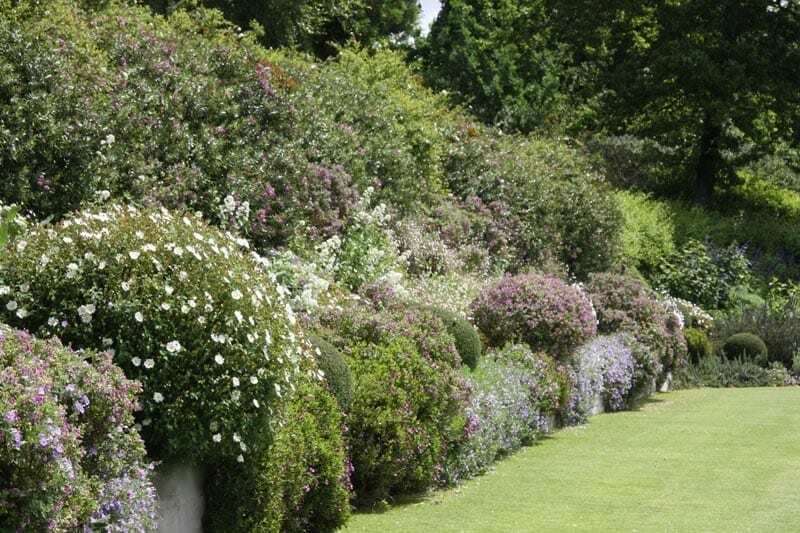 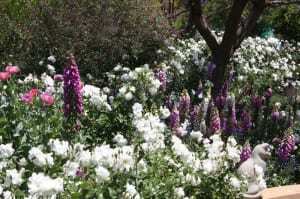 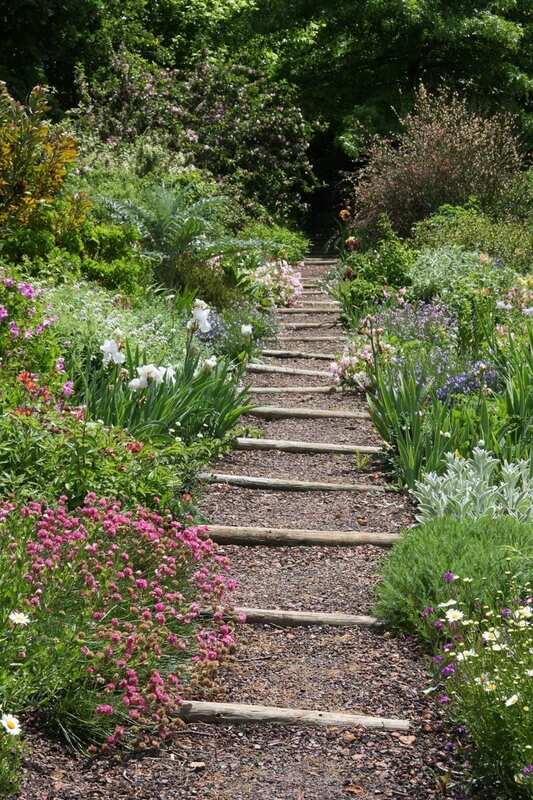 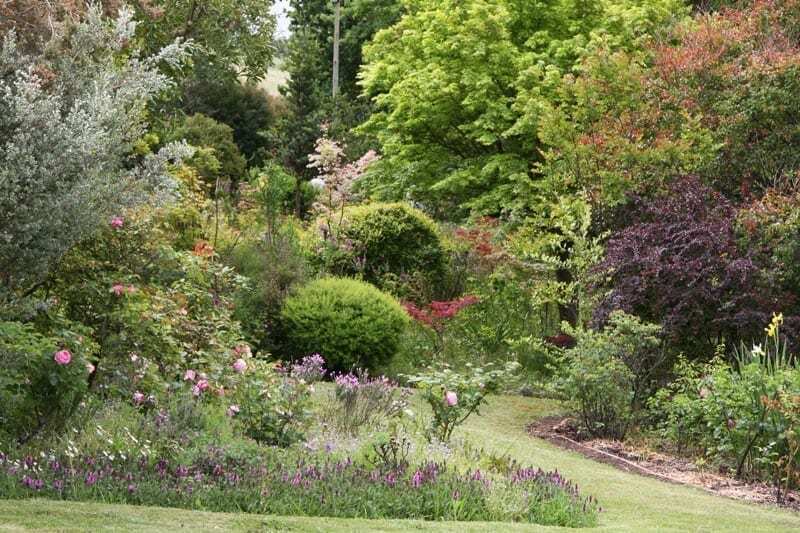 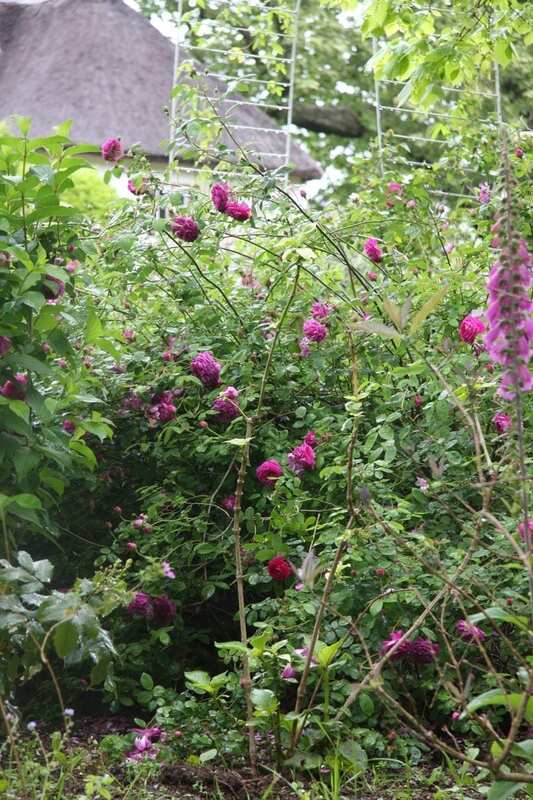 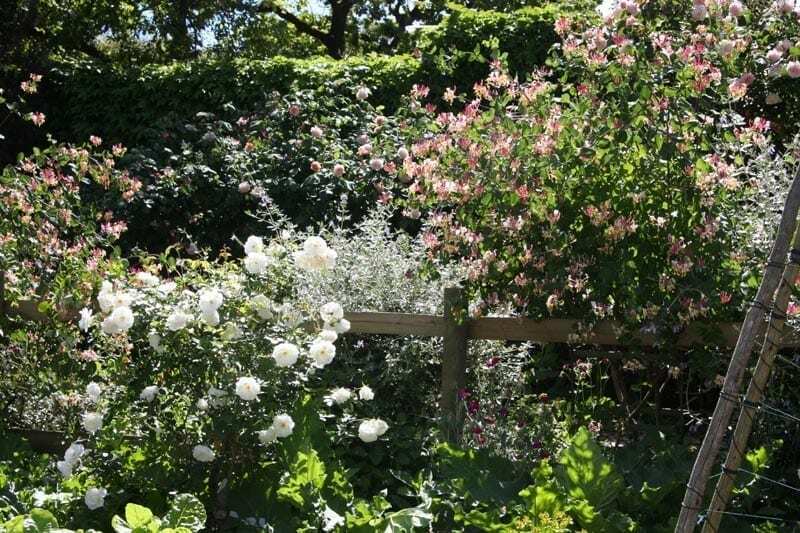 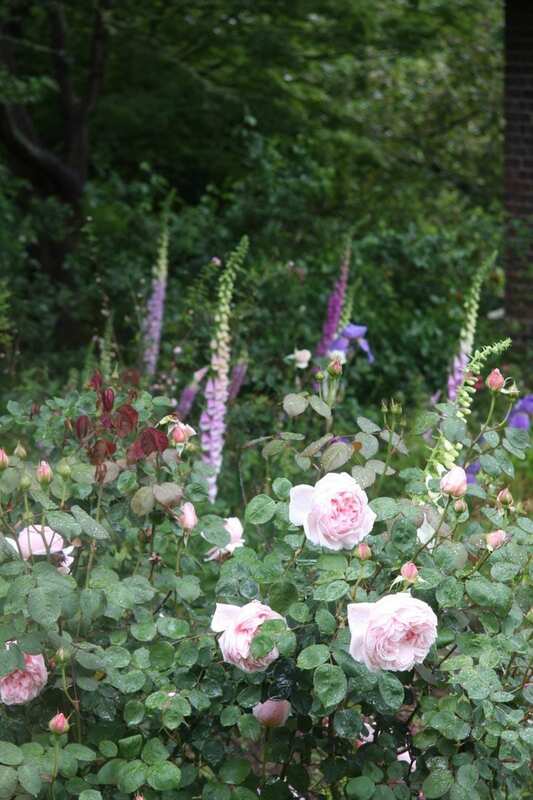 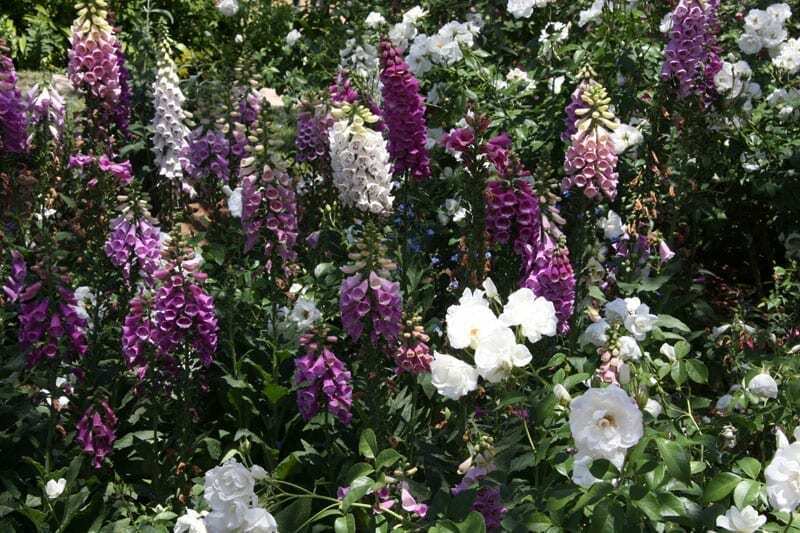 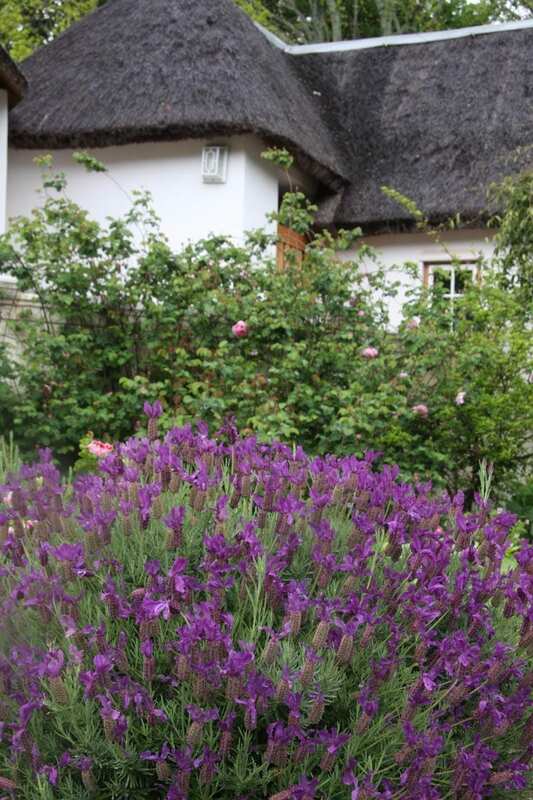 I enjoy planting as many different plants as possible around my roses, such as Foxgloves, Delphinium’s, Cleomes, Erigeron, Scabious, Salvia, Lambs Ear, Borage, Spinach and Parsley. 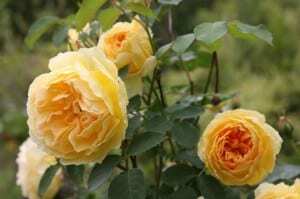 Well what I am planning next or what I would like to do? 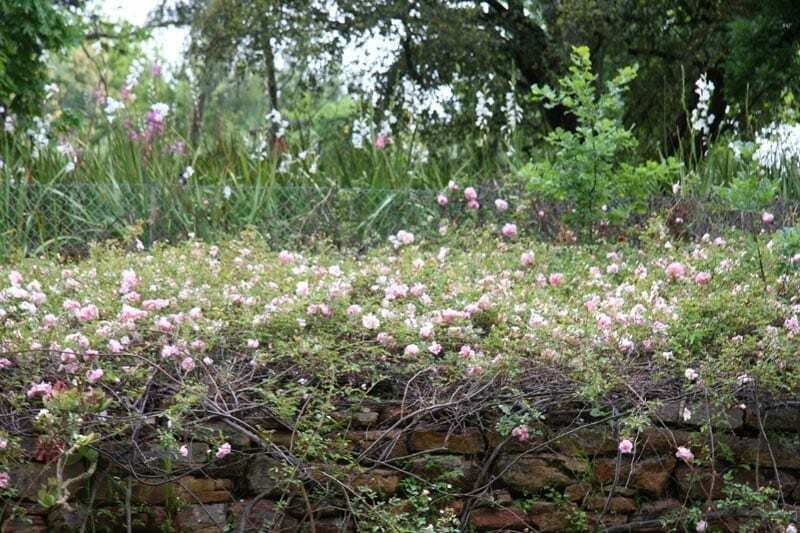 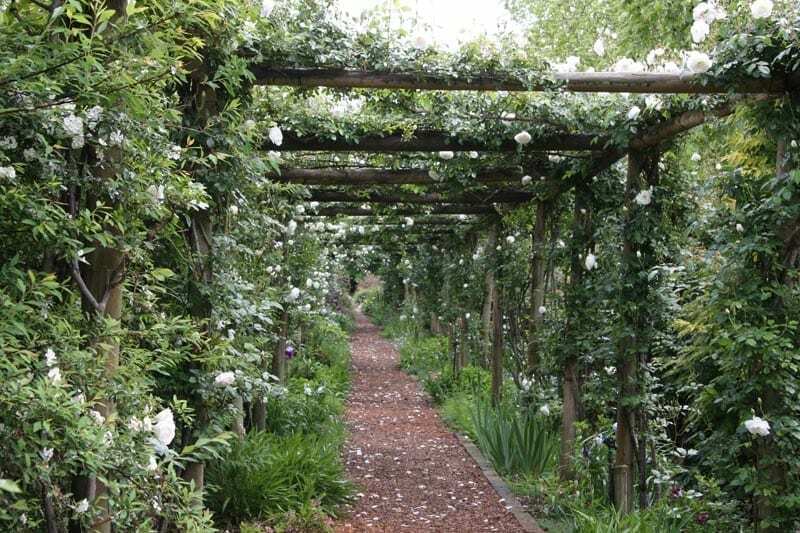 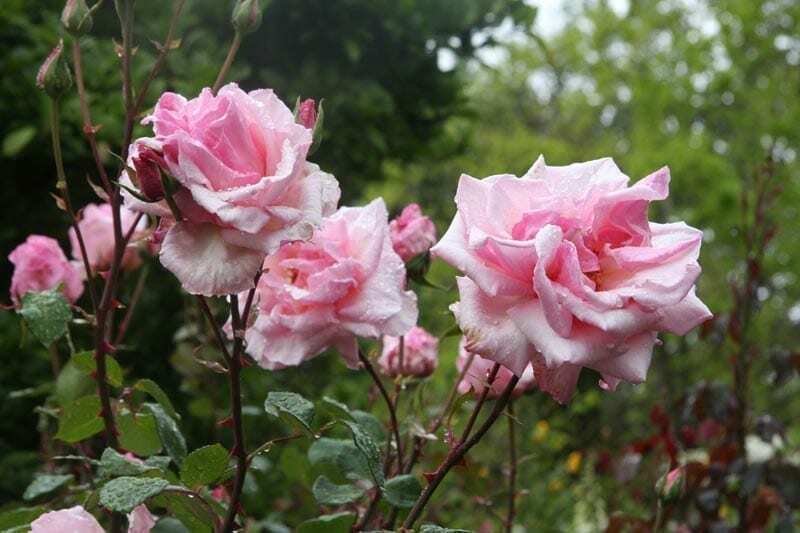 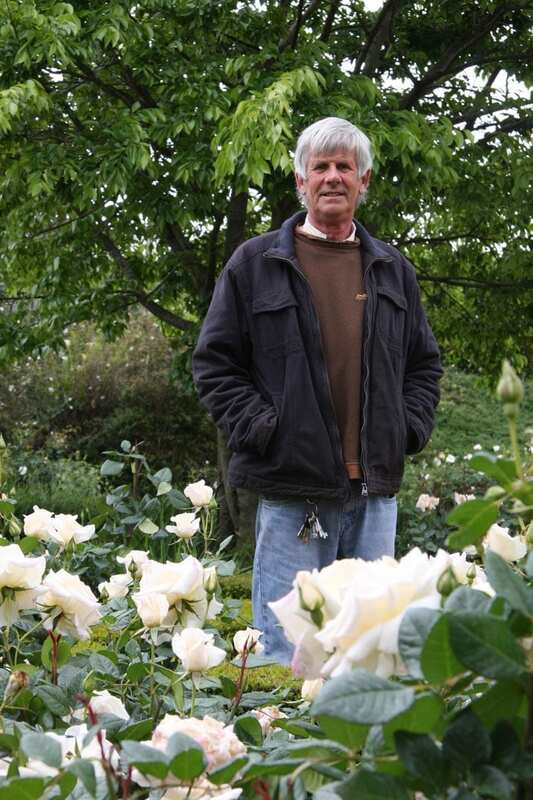 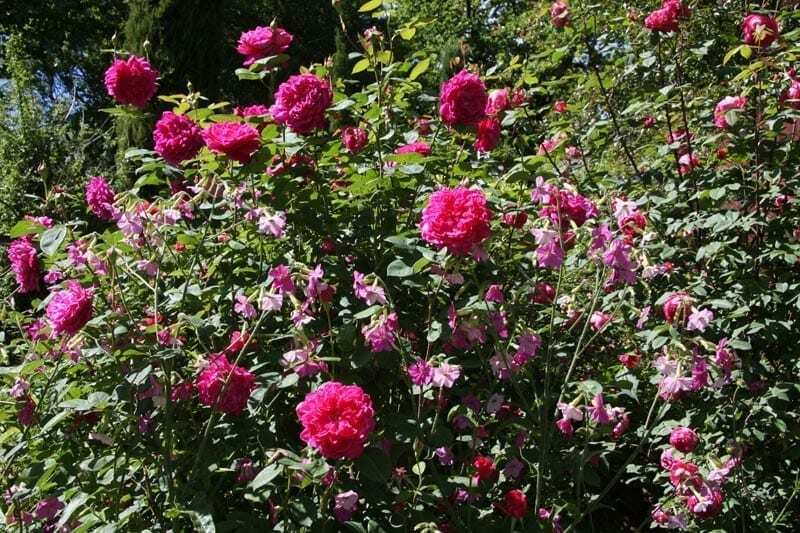 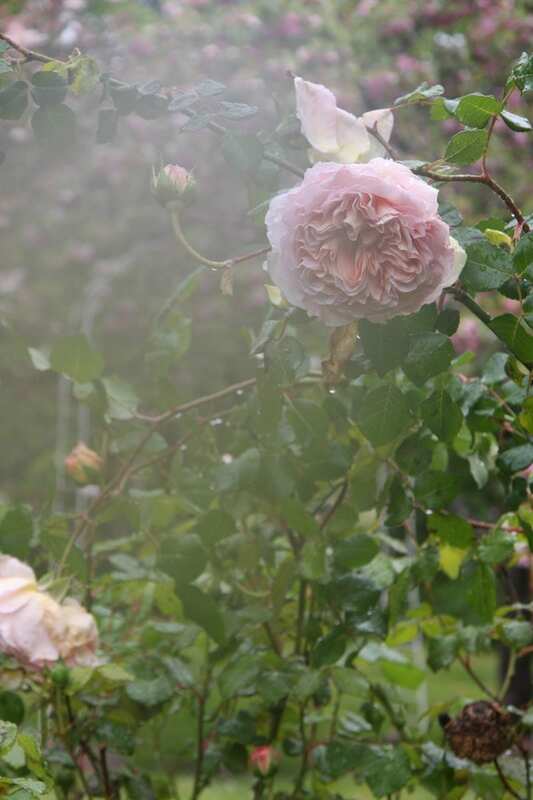 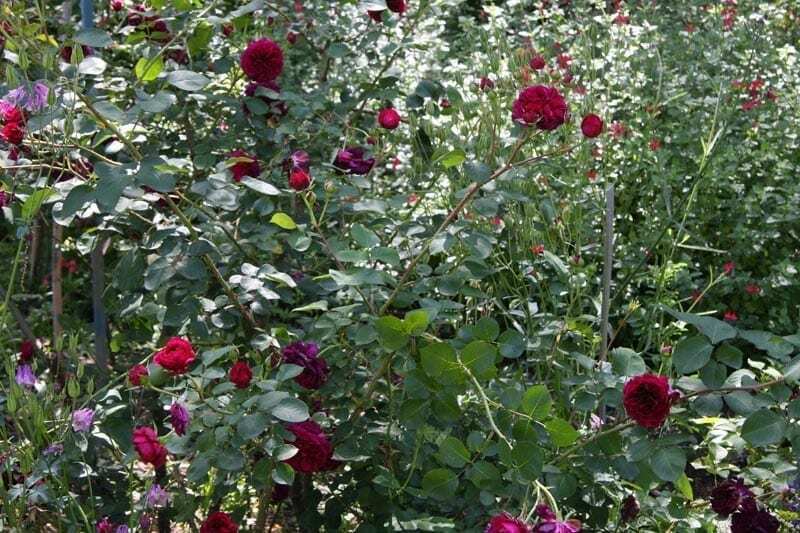 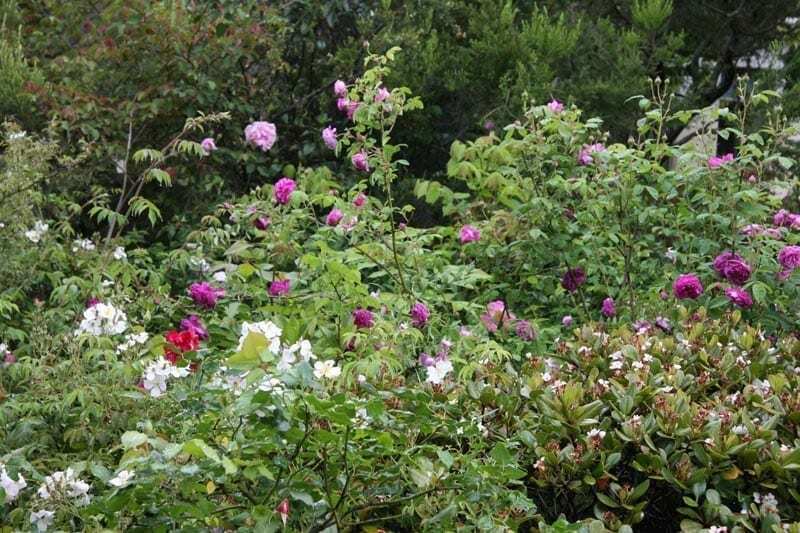 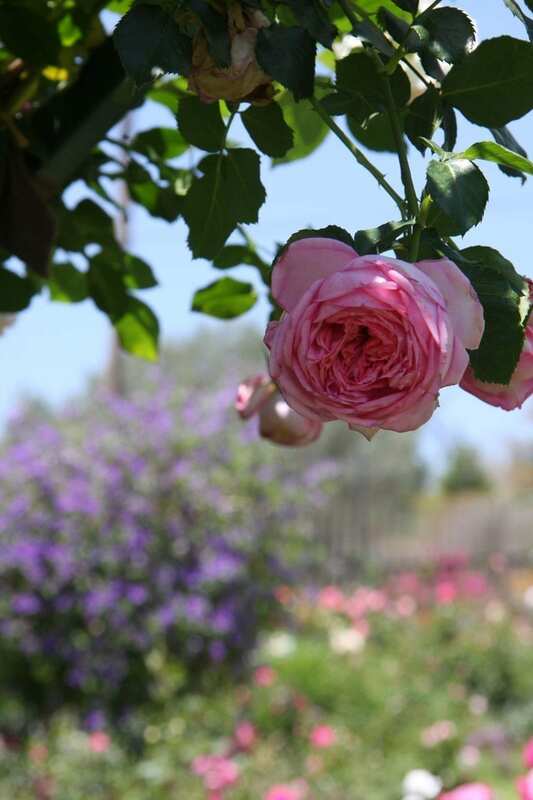 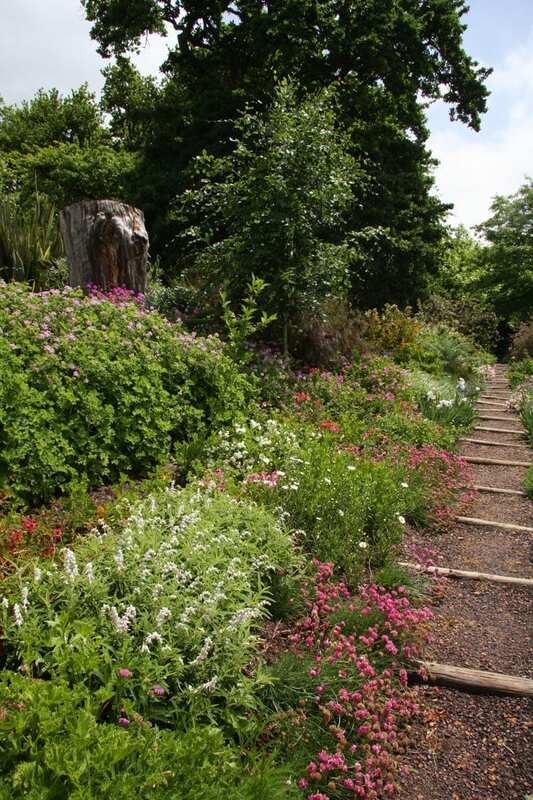 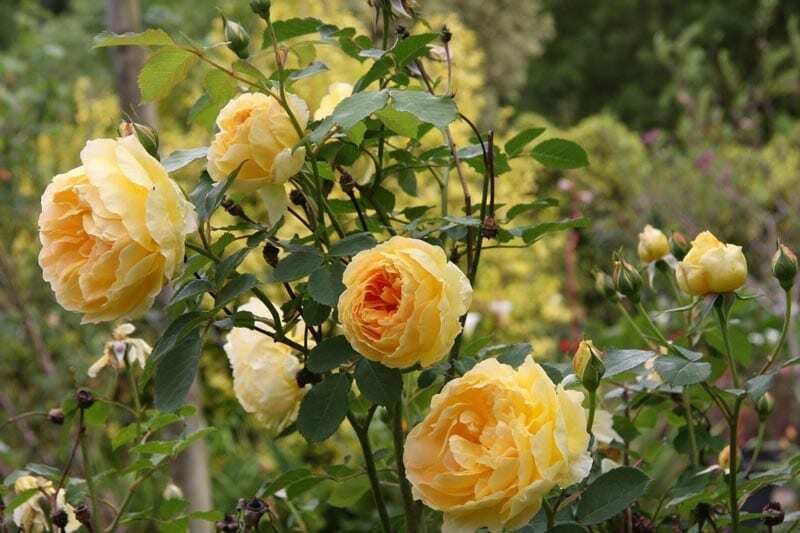 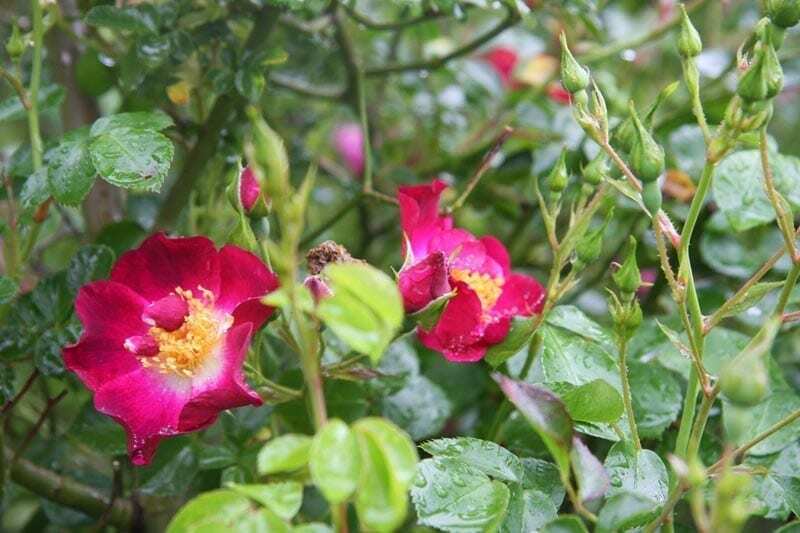 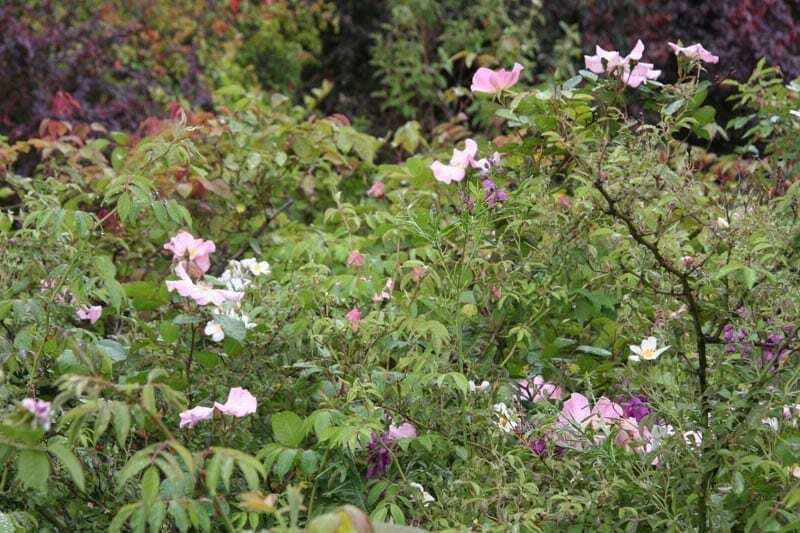 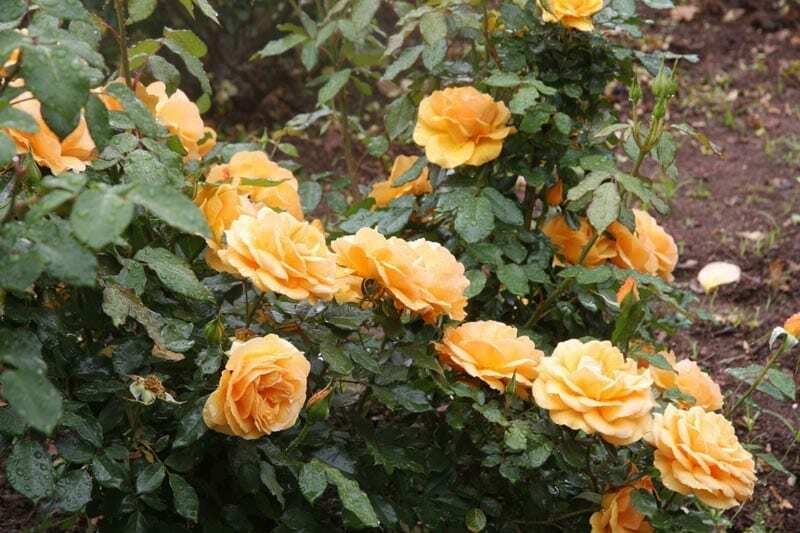 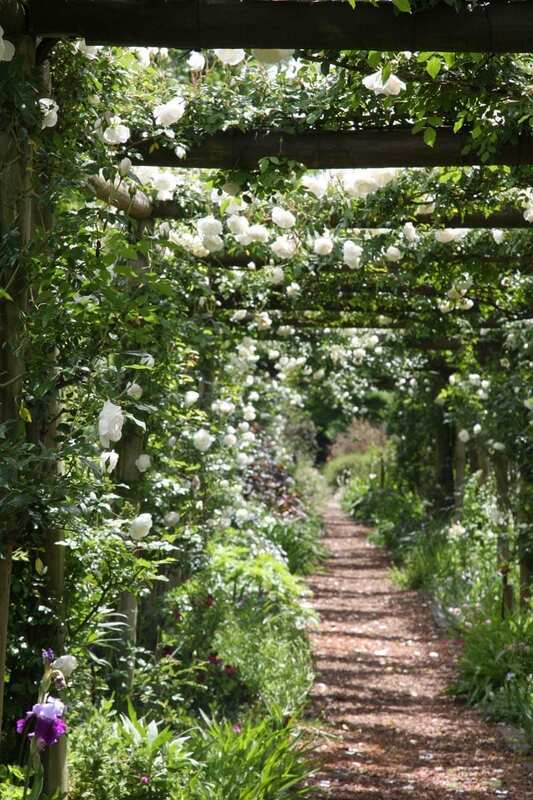 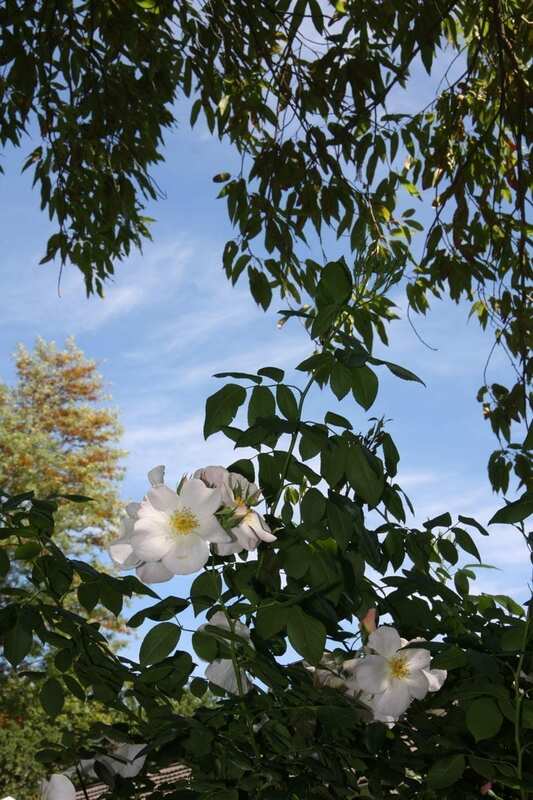 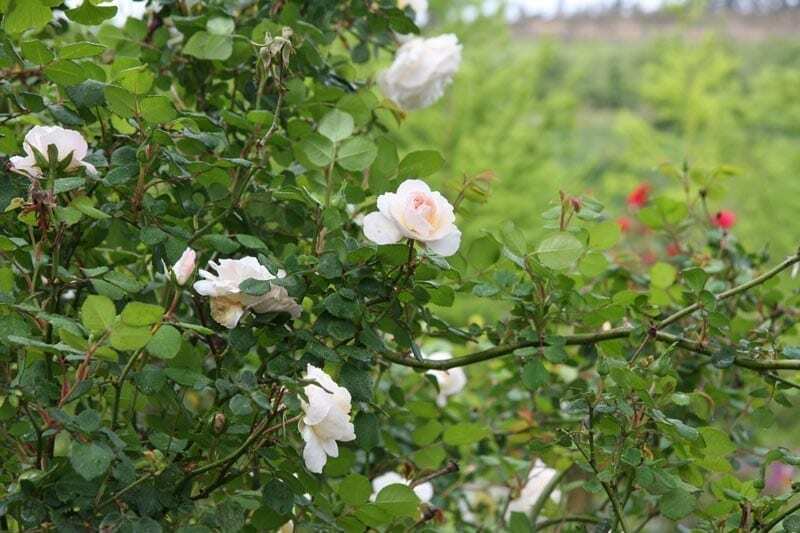 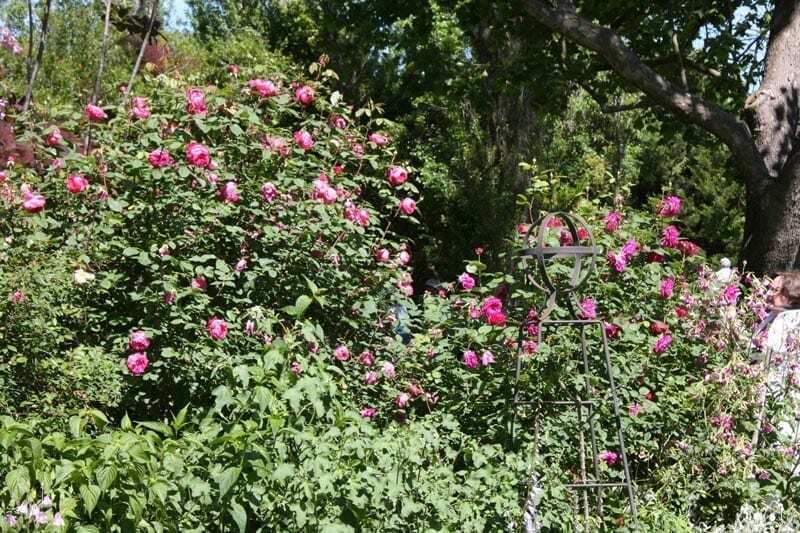 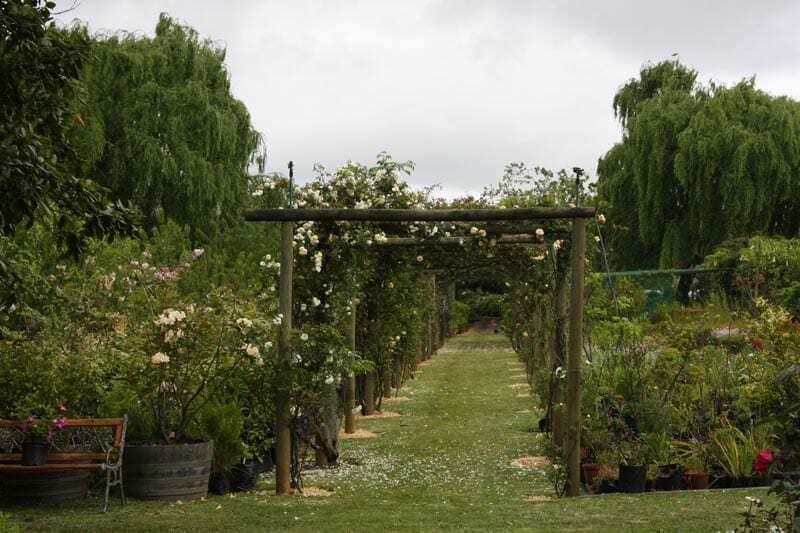 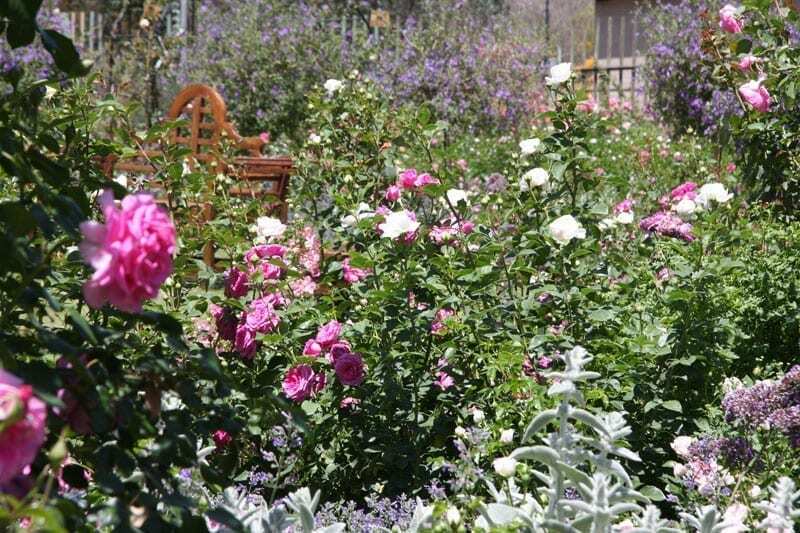 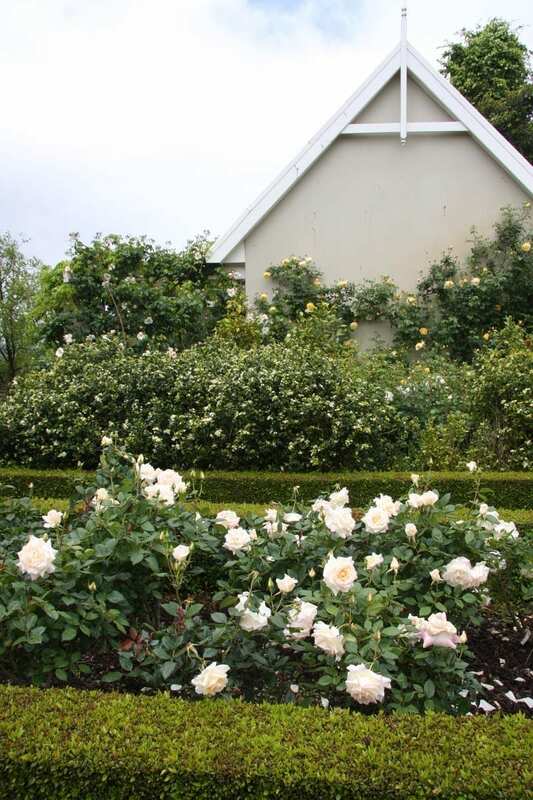 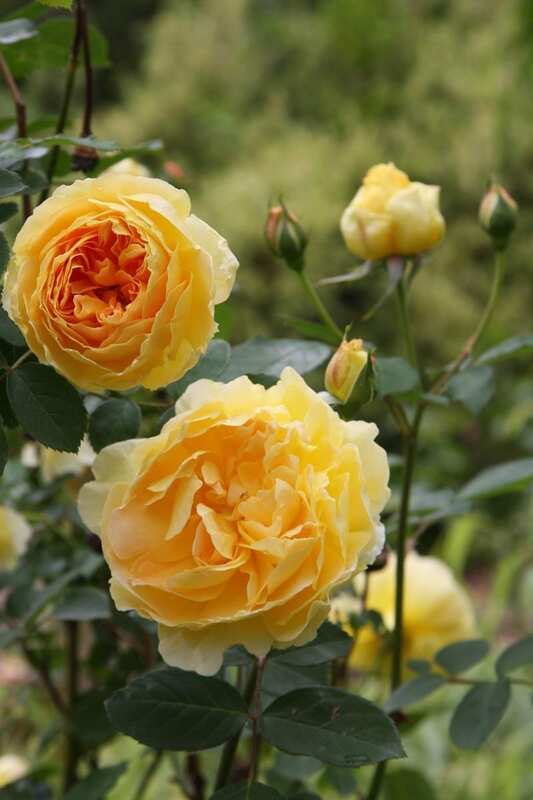 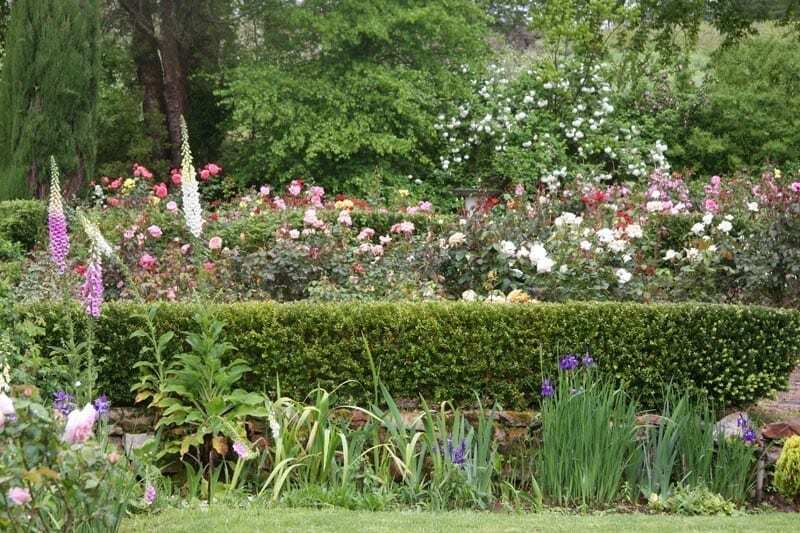 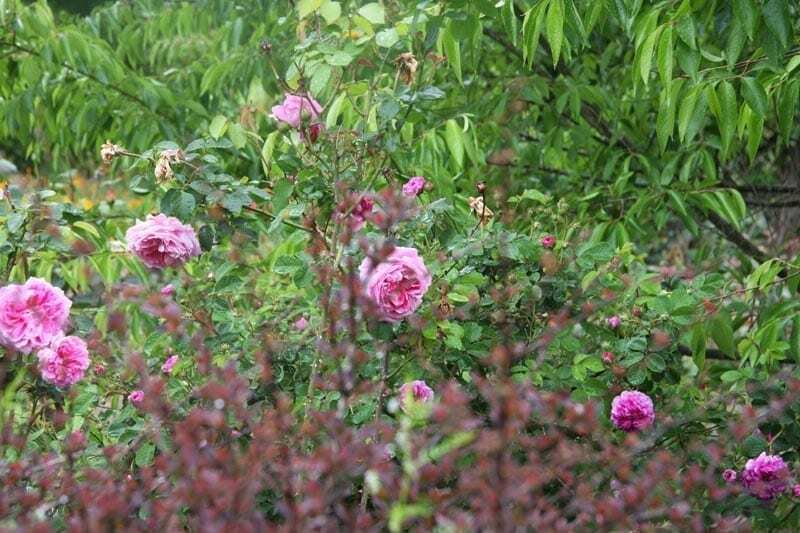 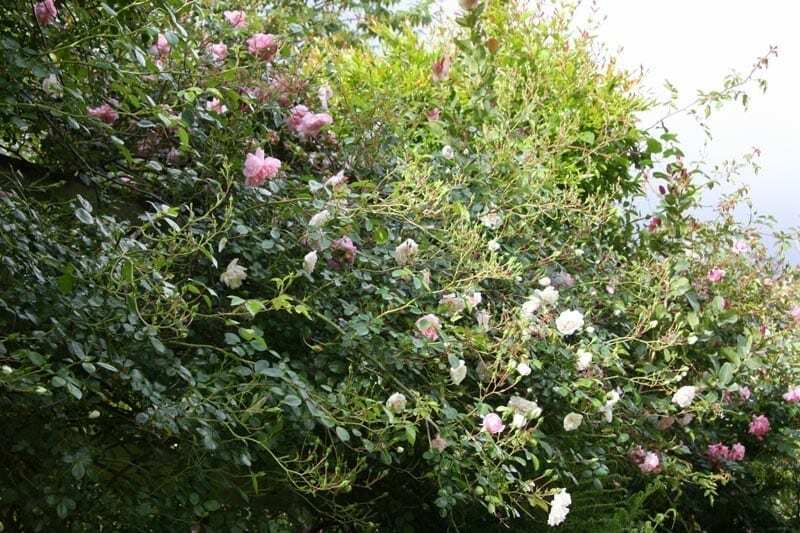 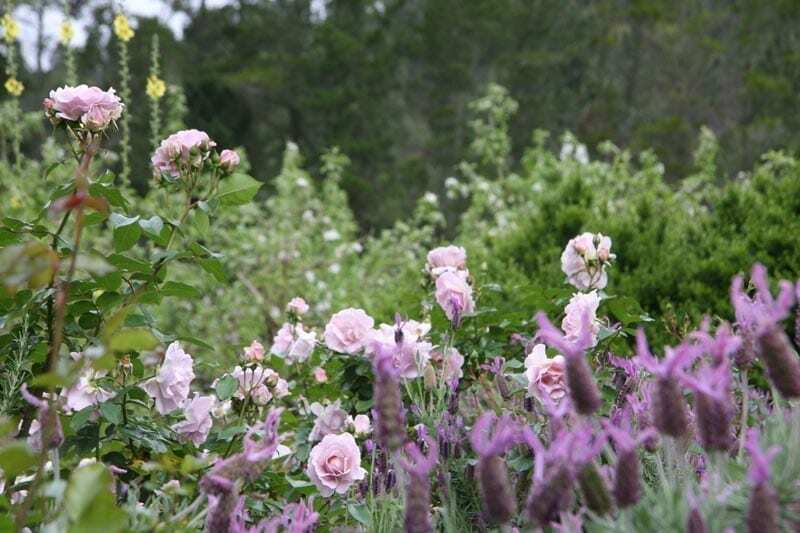 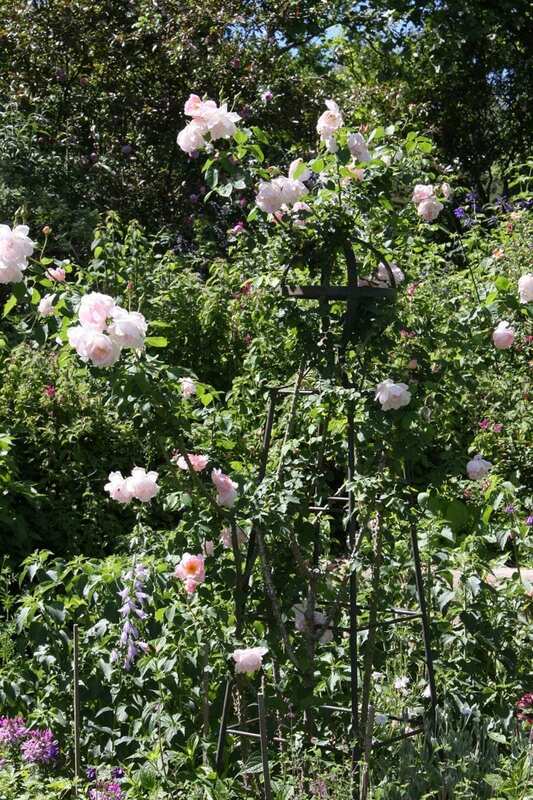 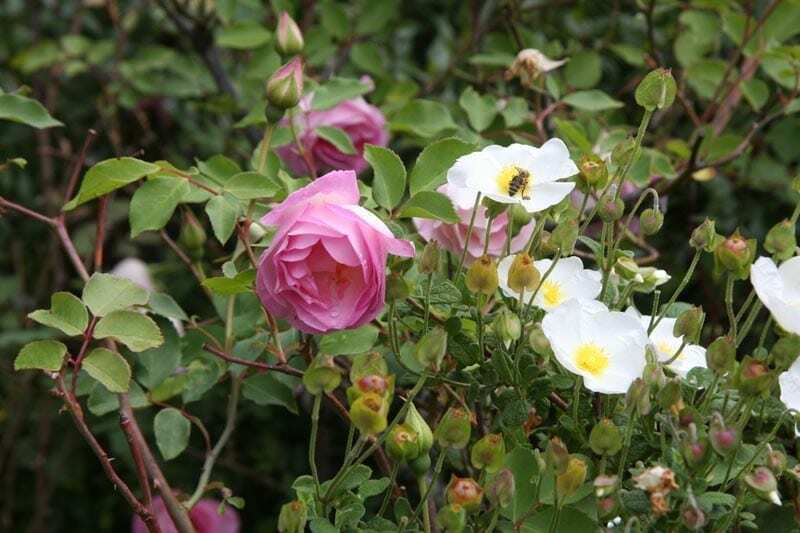 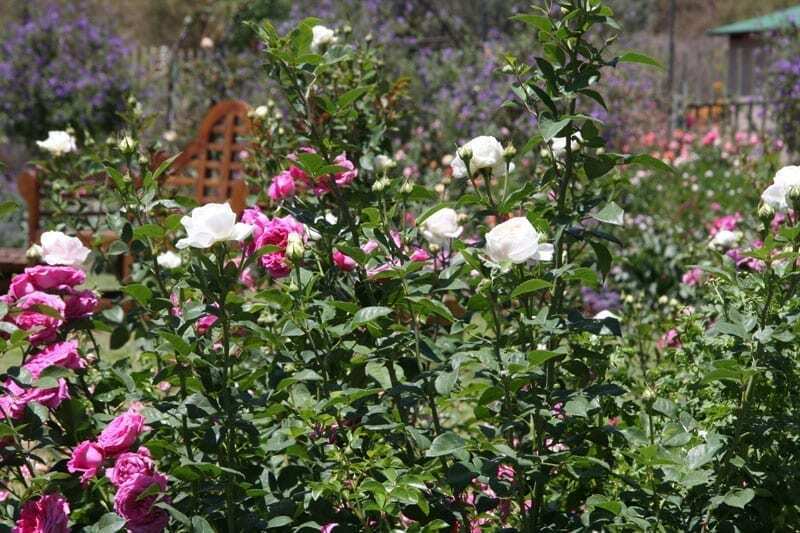 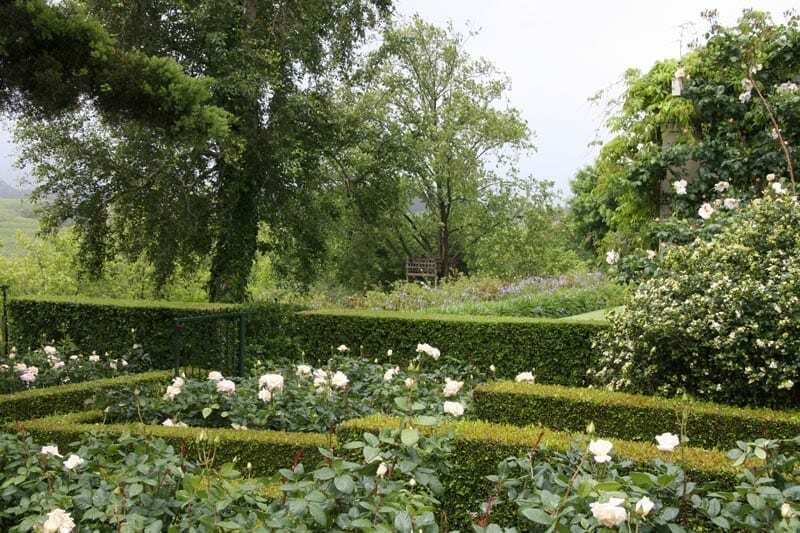 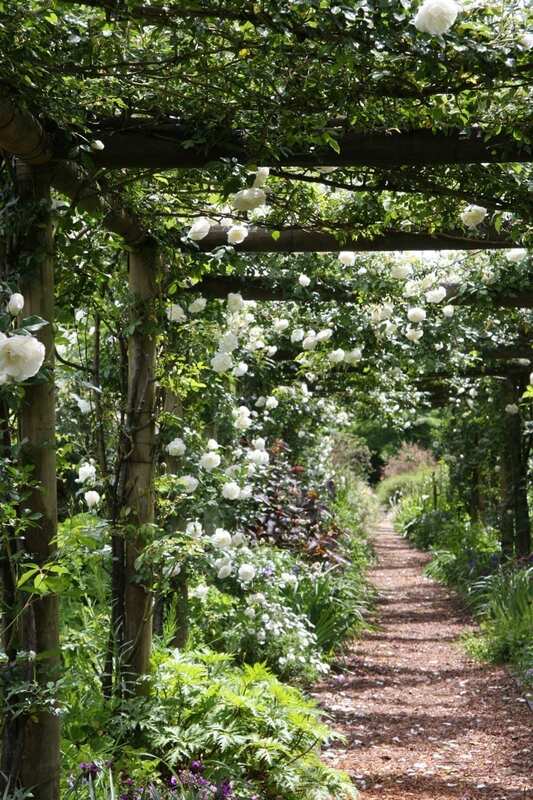 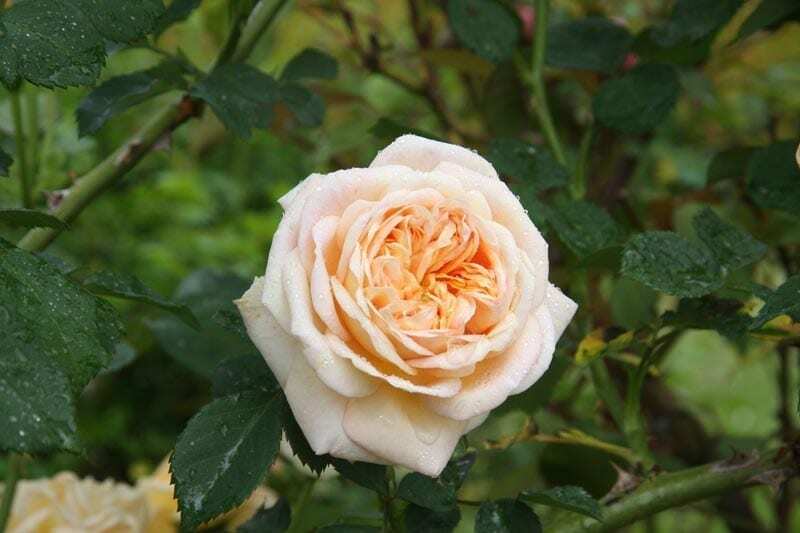 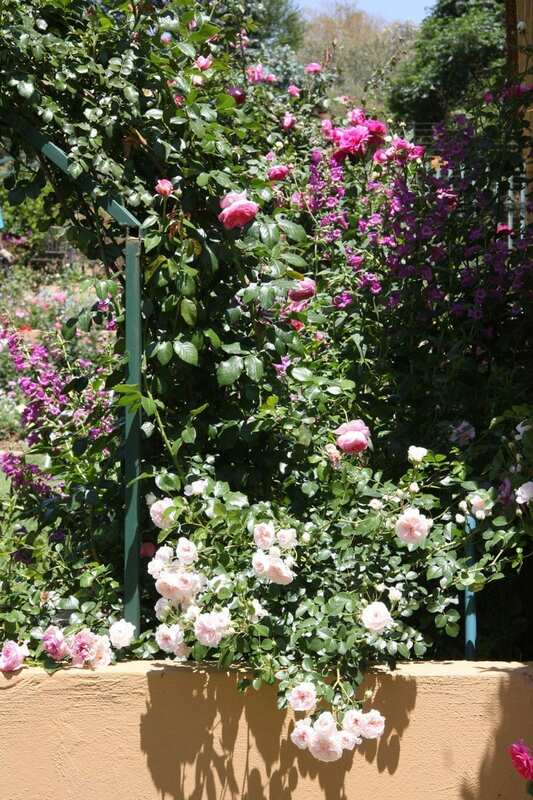 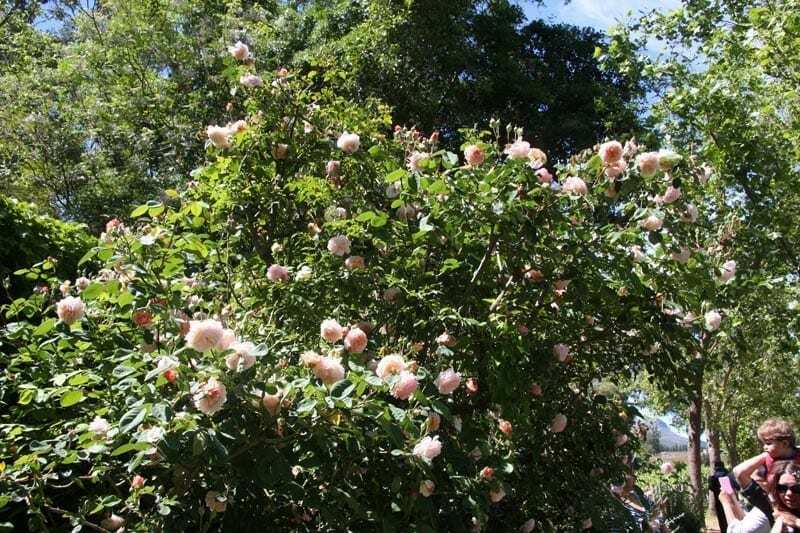 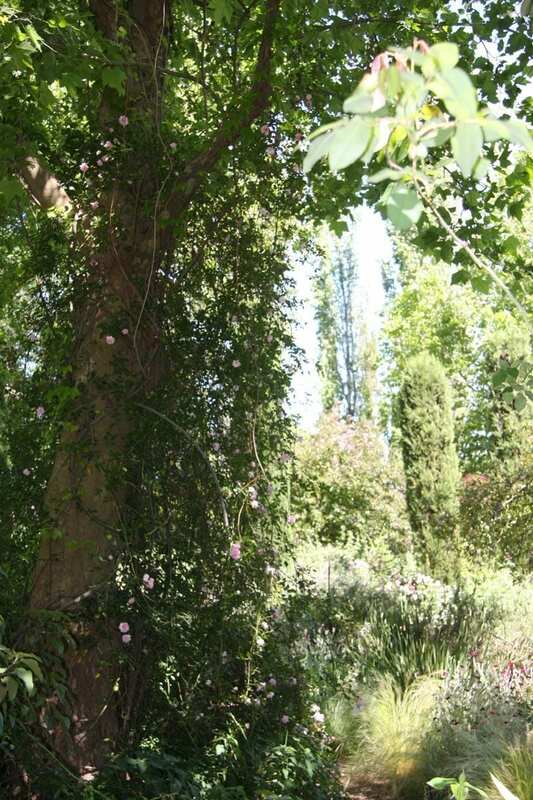 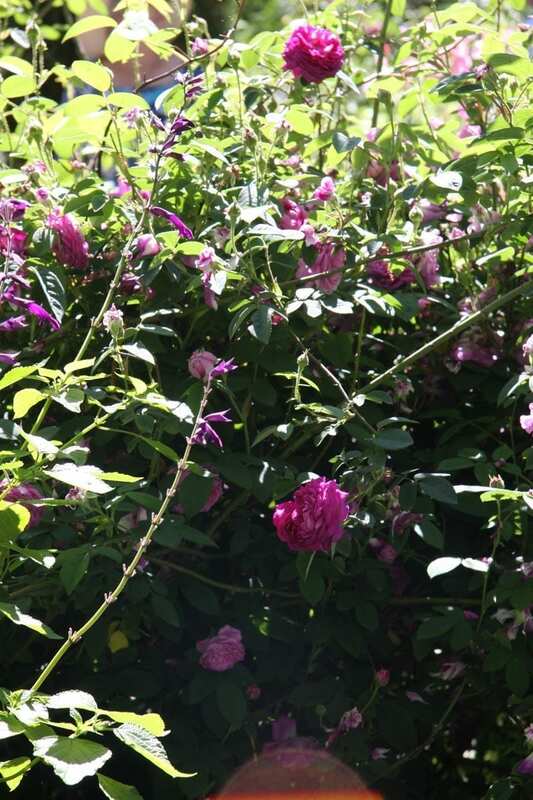 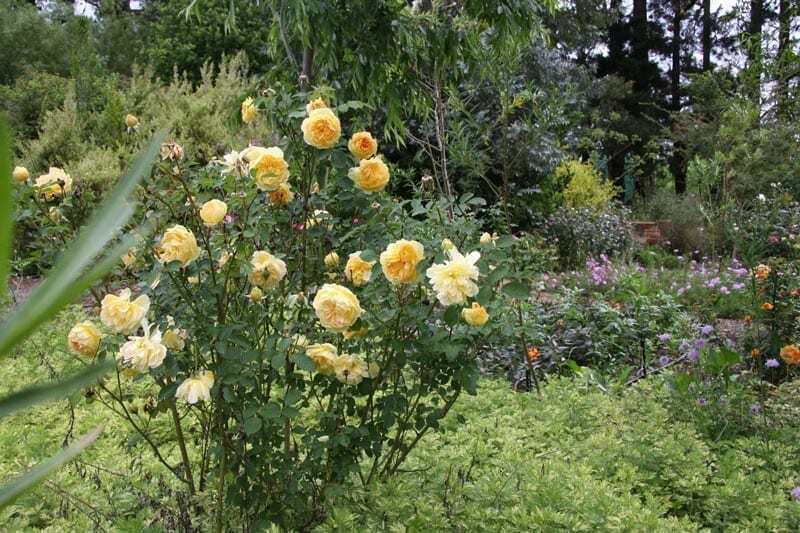 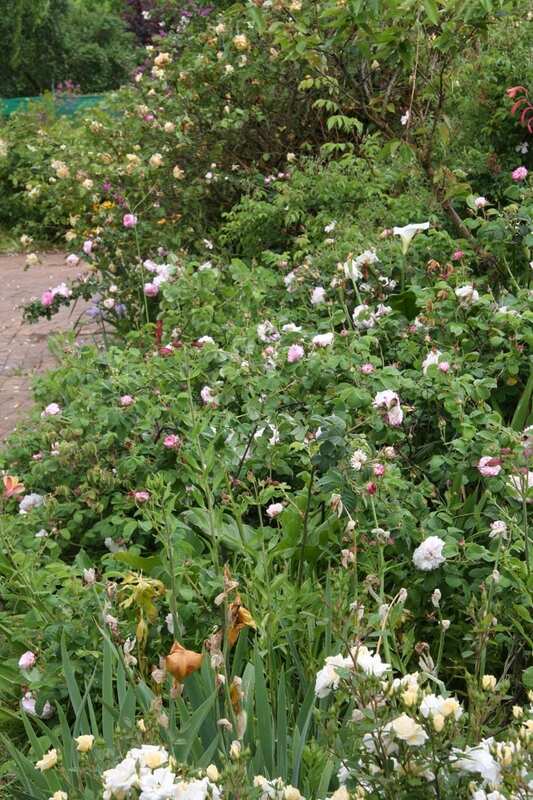 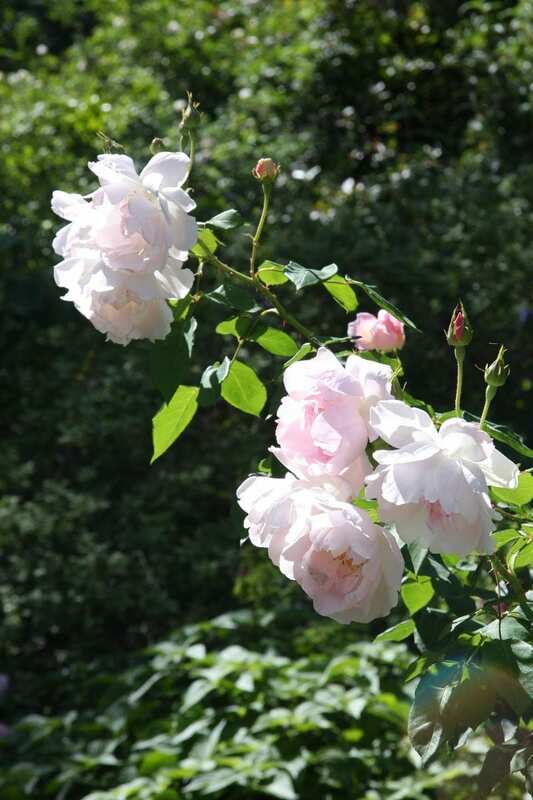 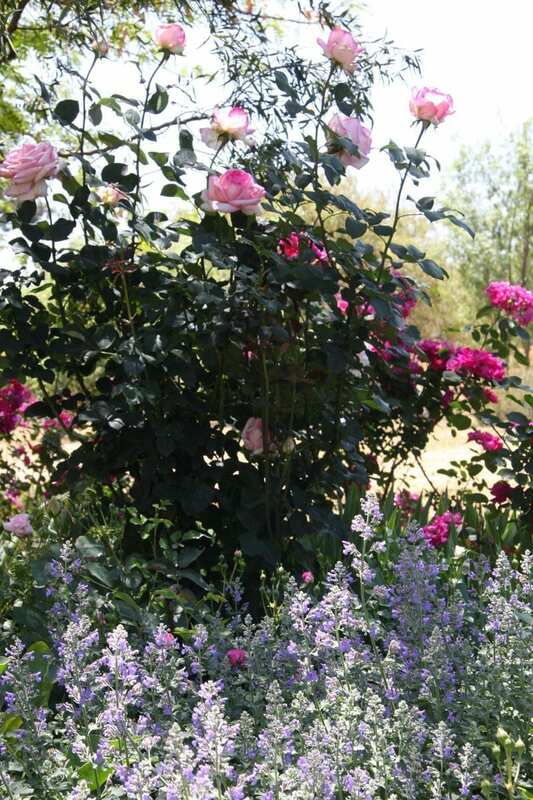 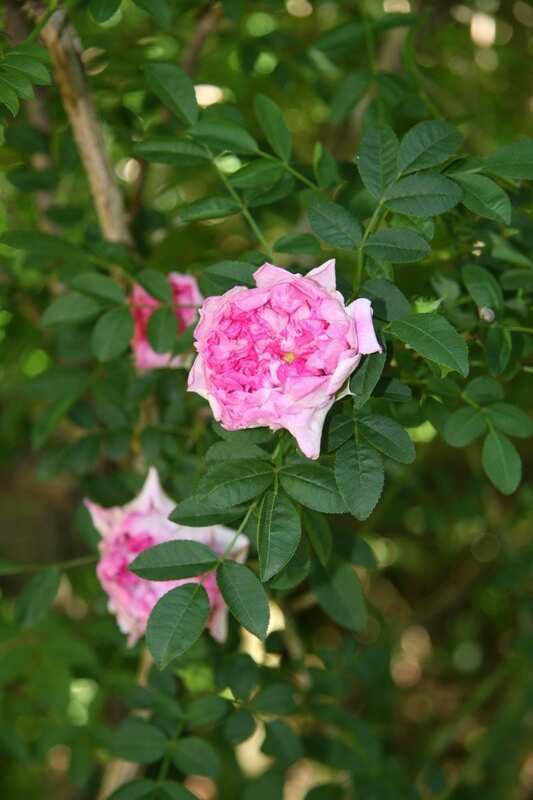 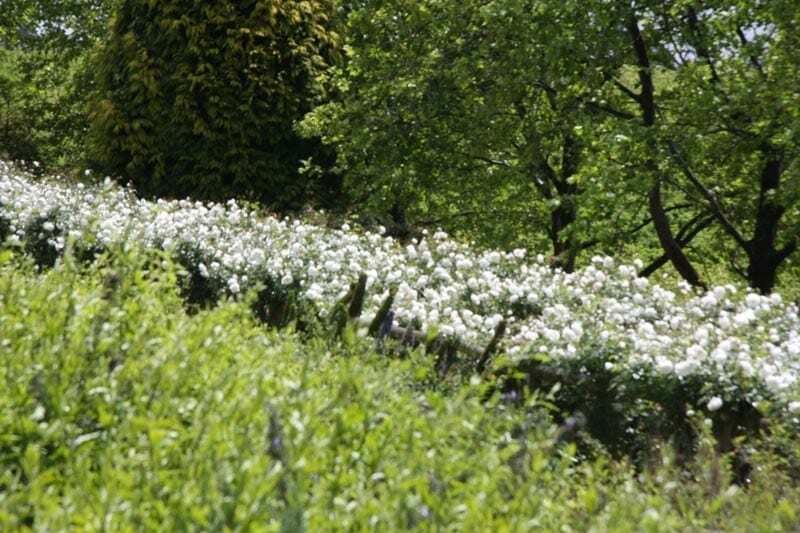 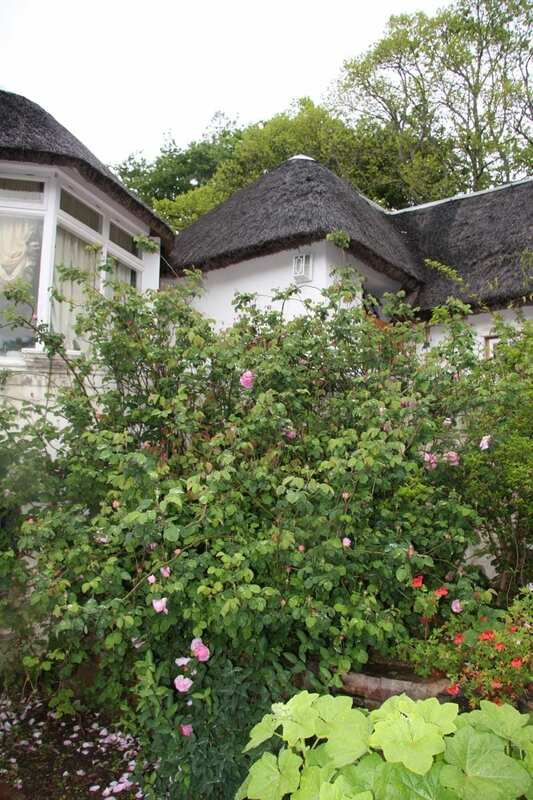 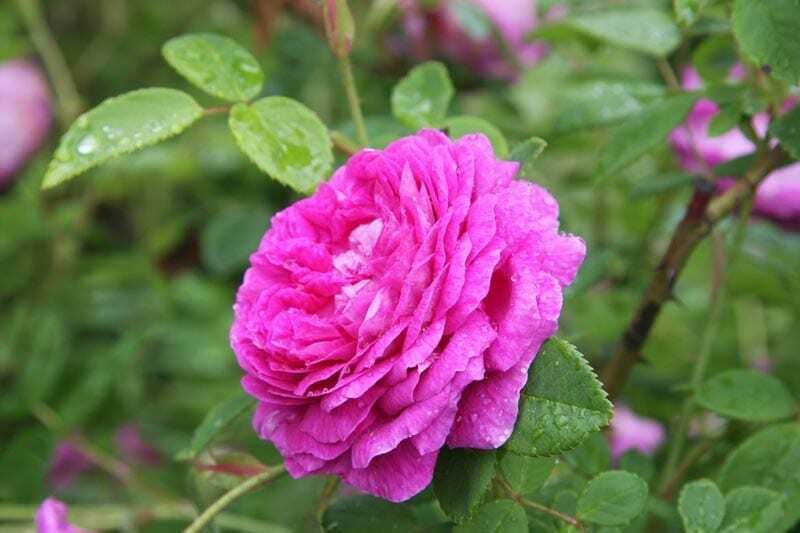 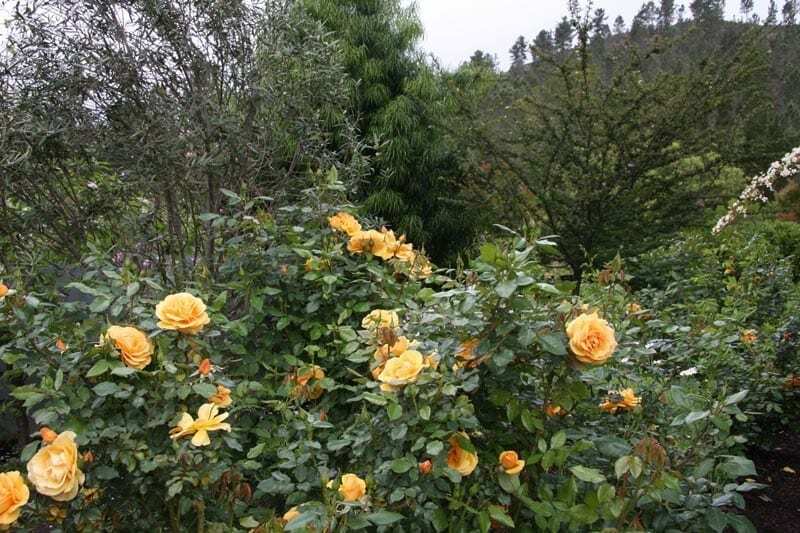 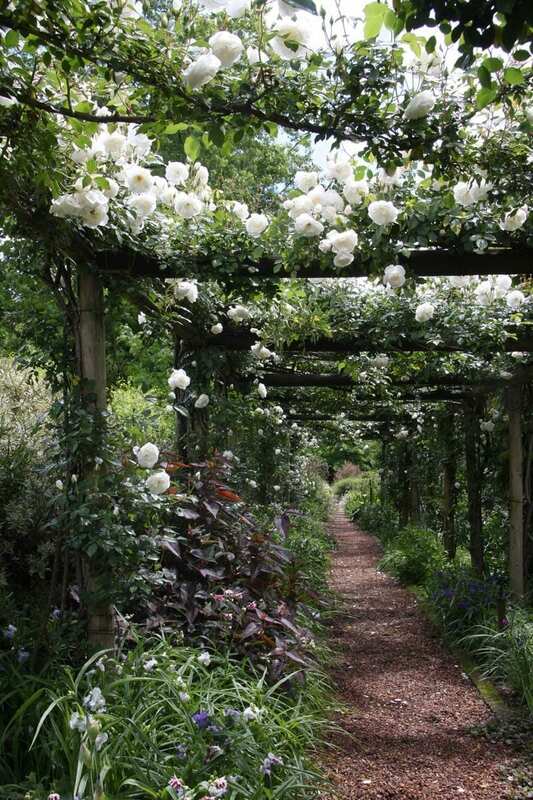 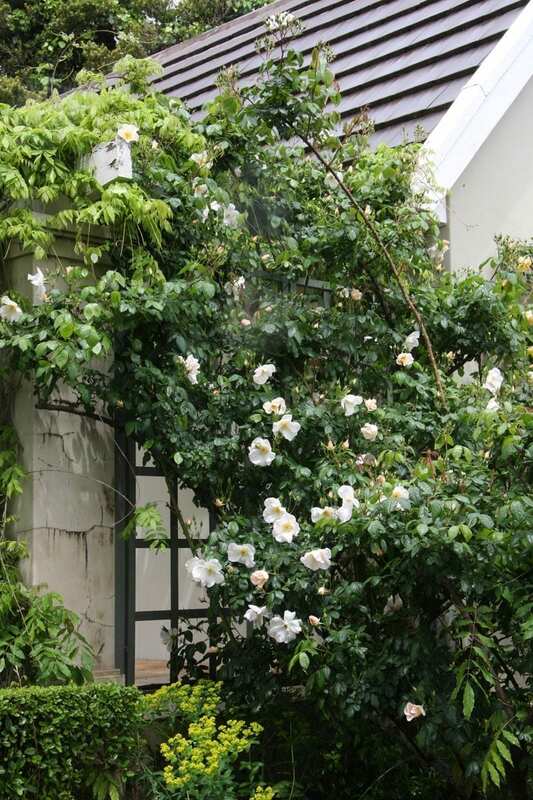 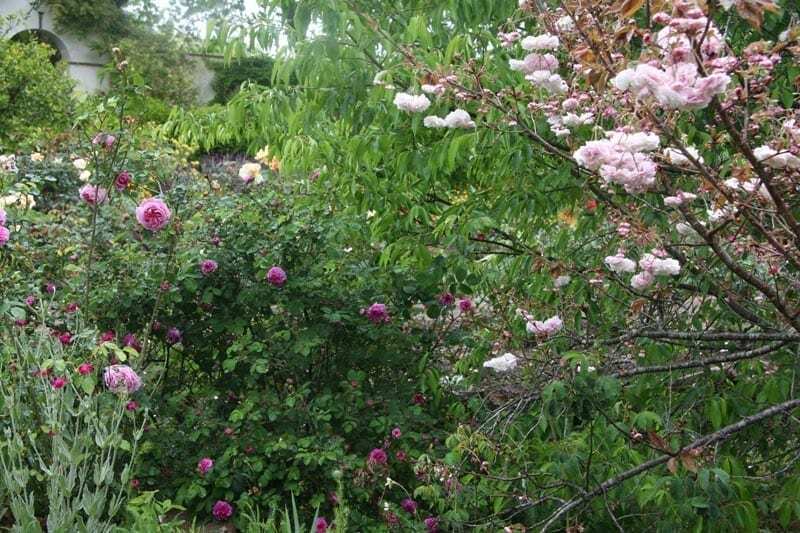 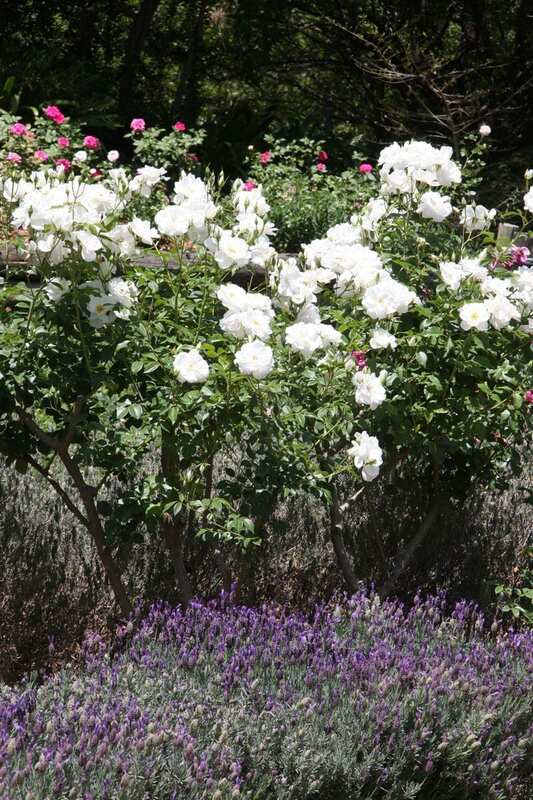 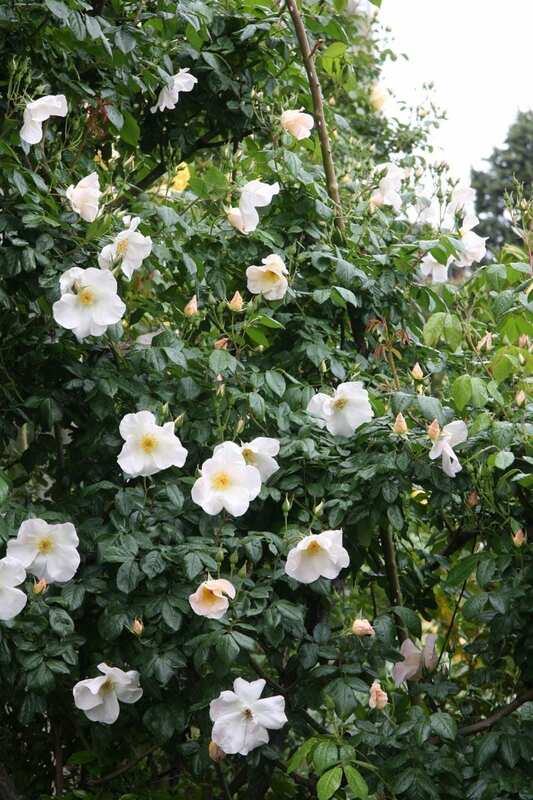 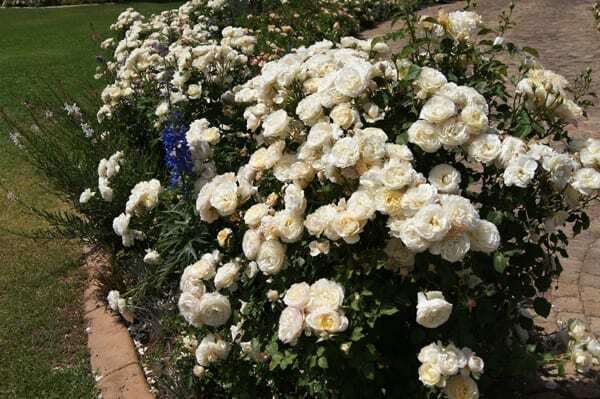 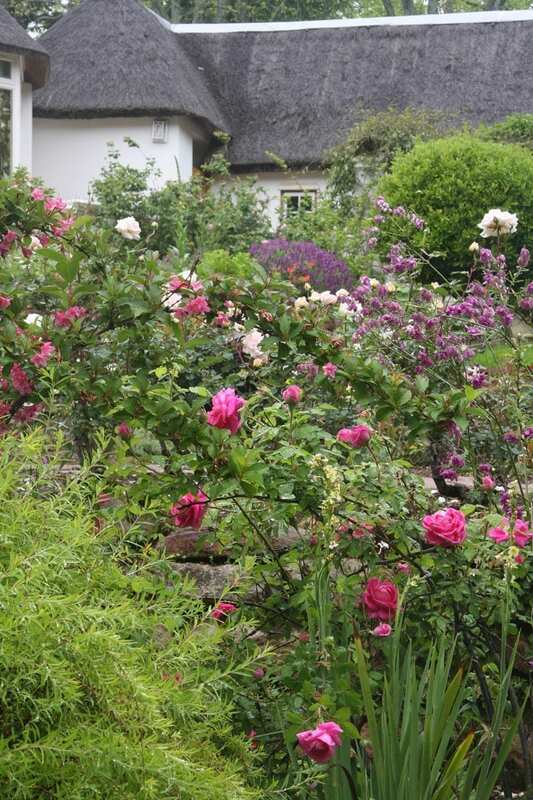 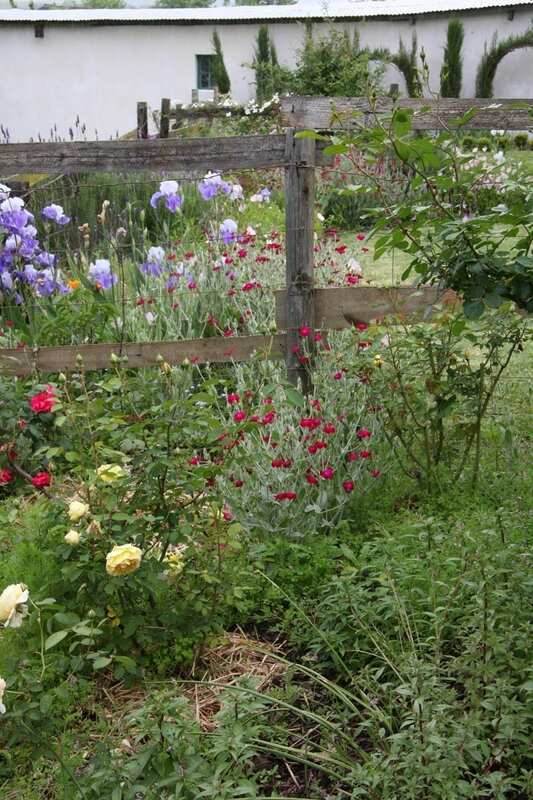 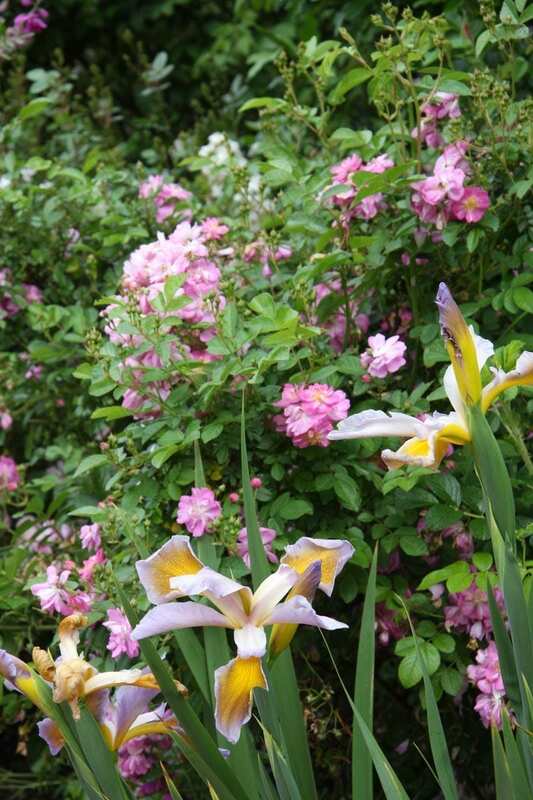 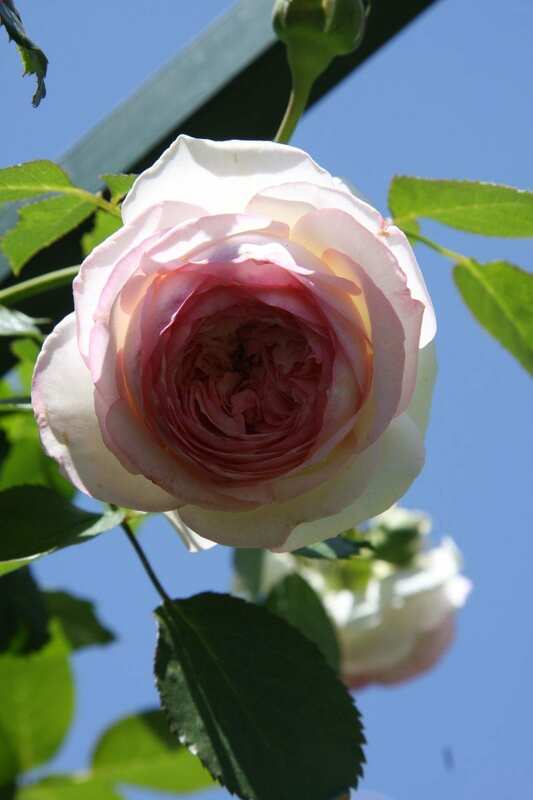 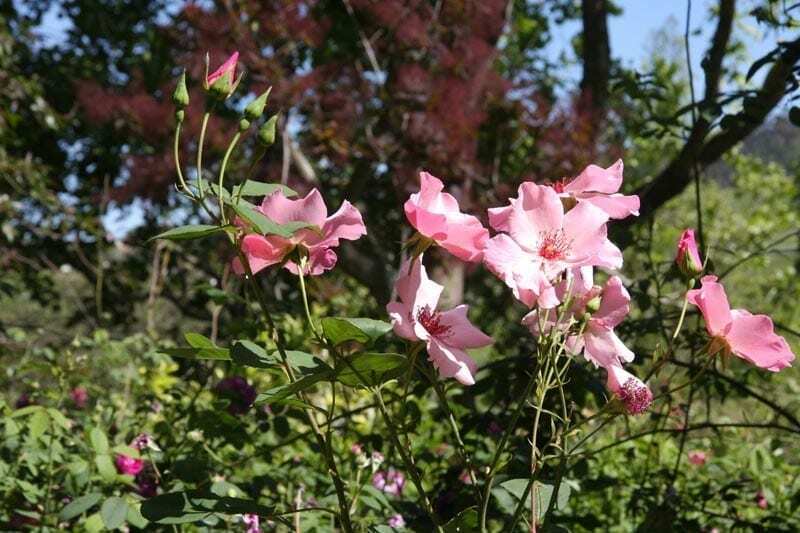 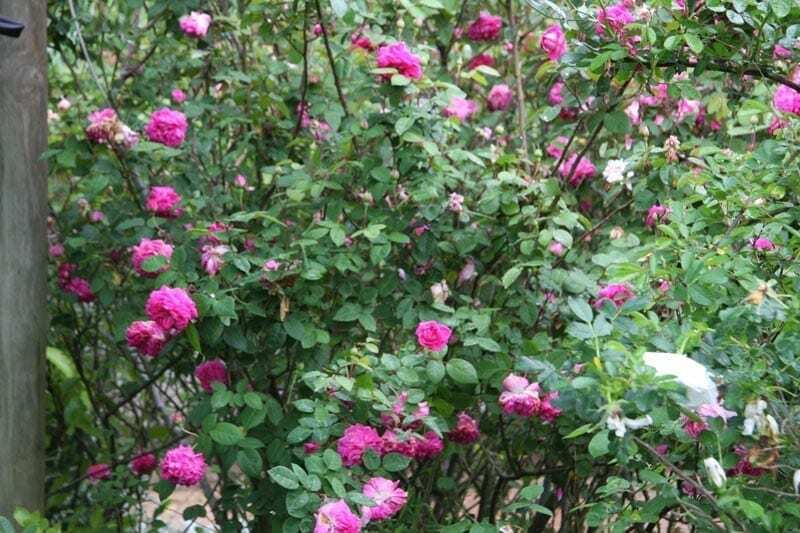 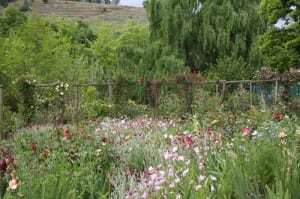 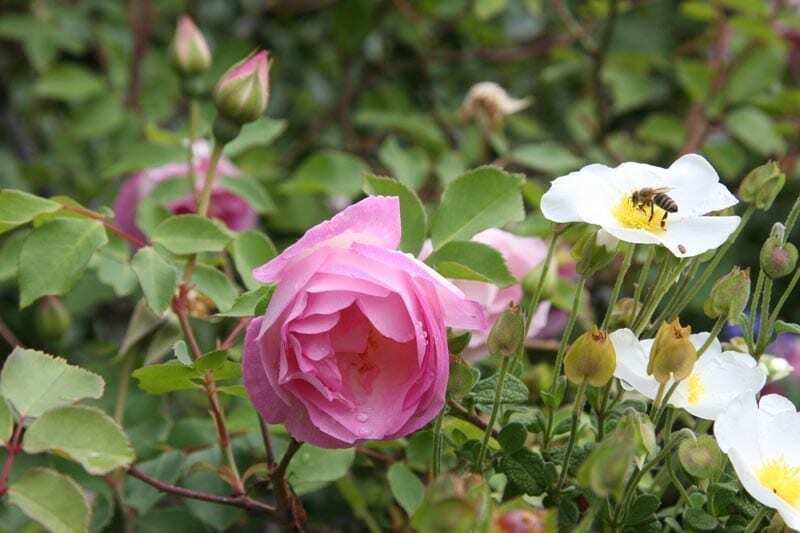 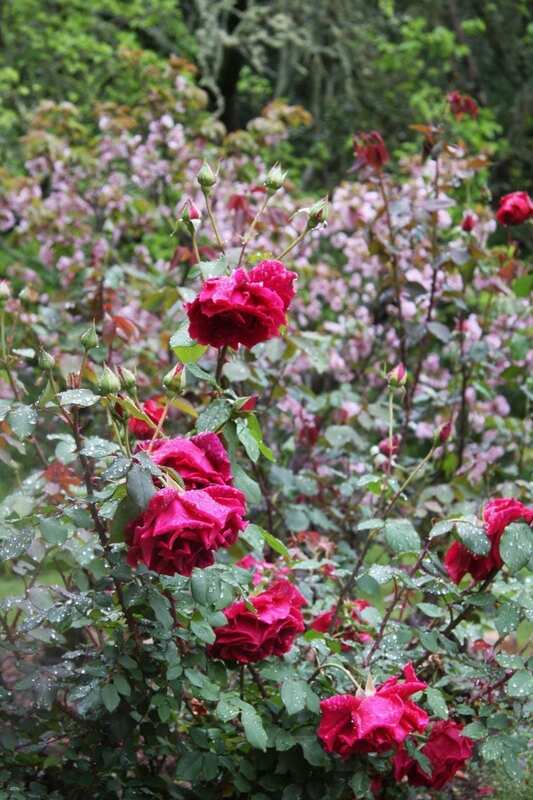 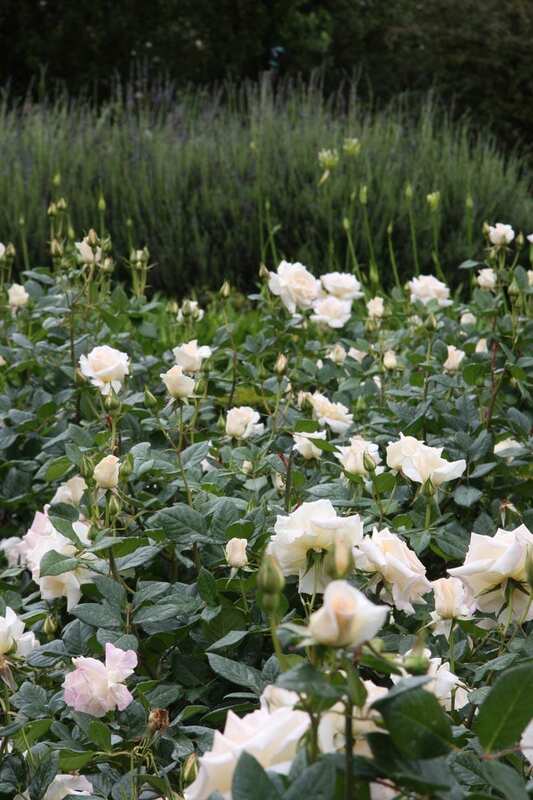 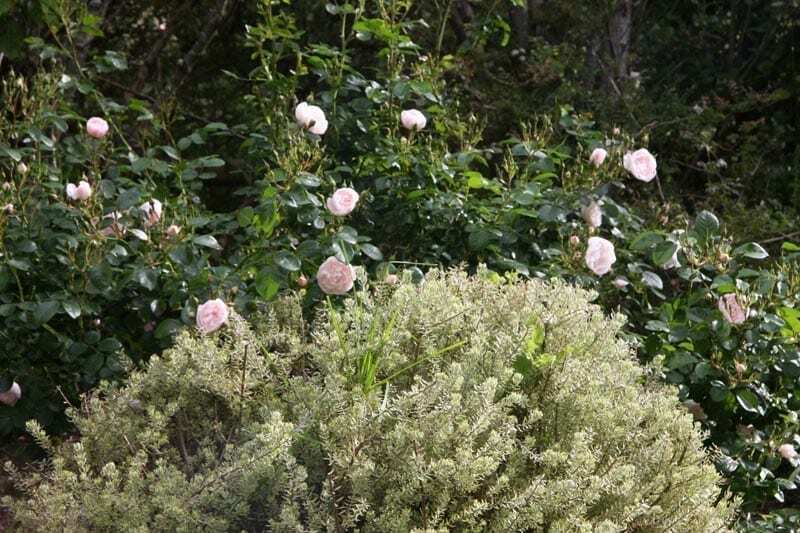 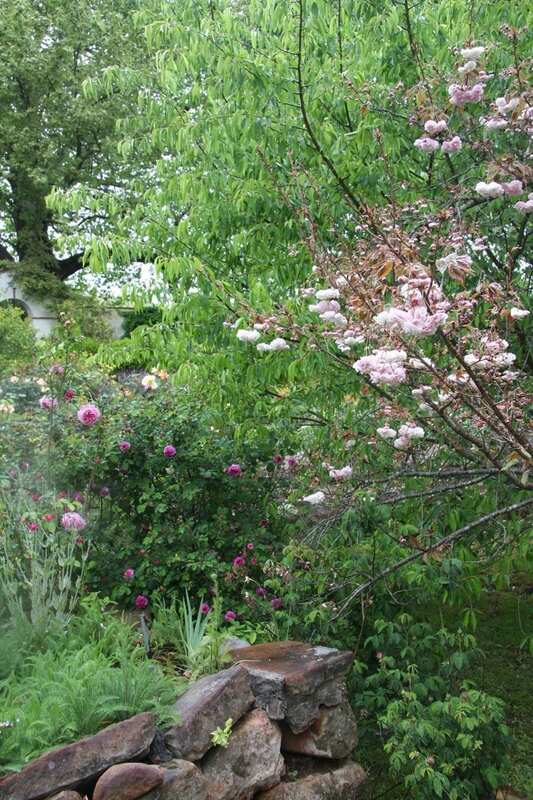 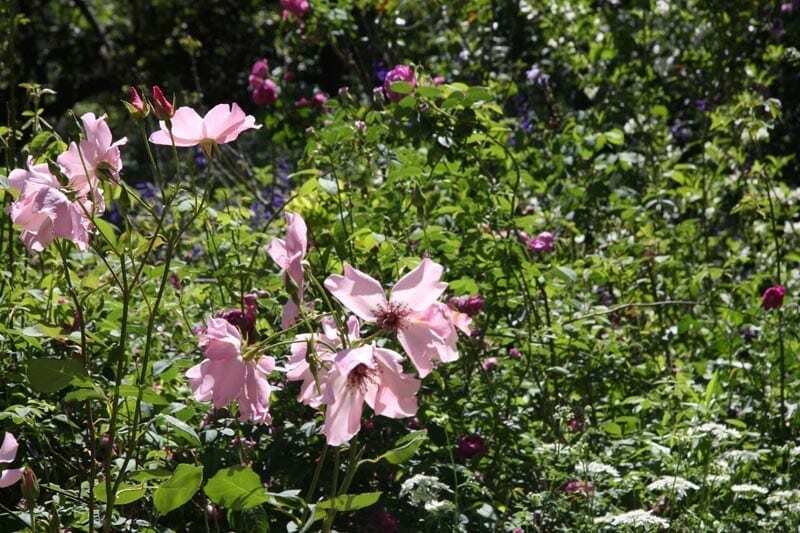 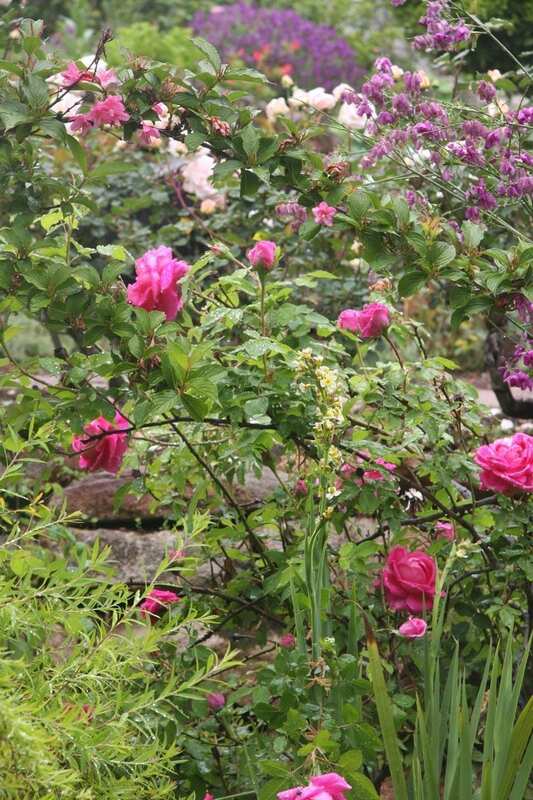 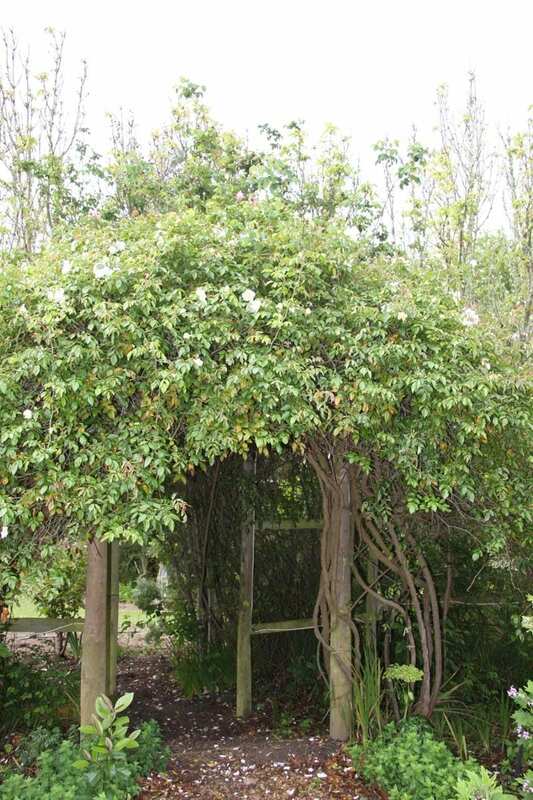 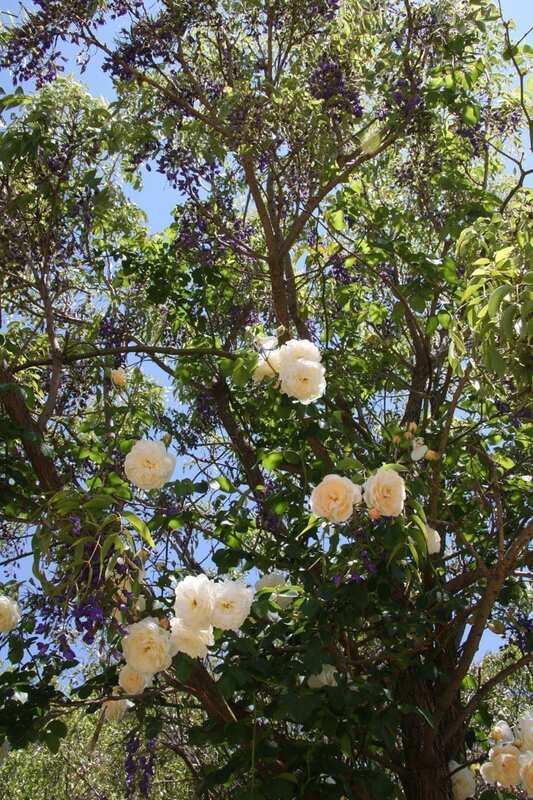 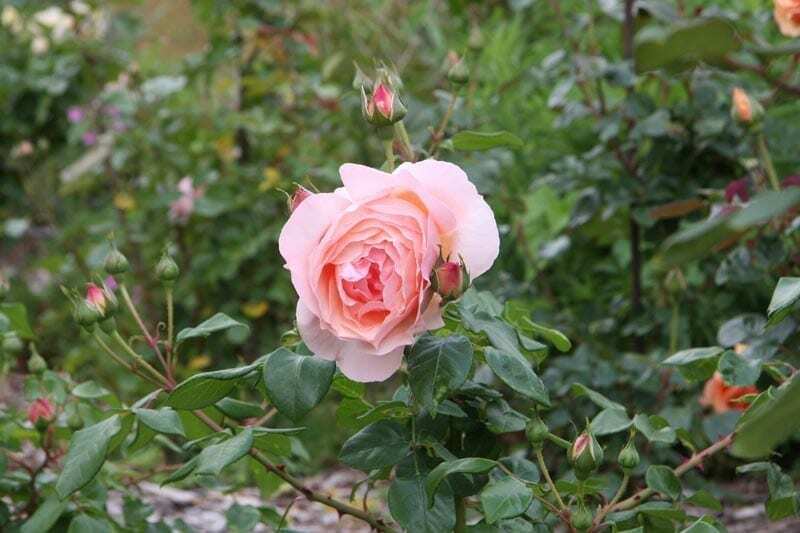 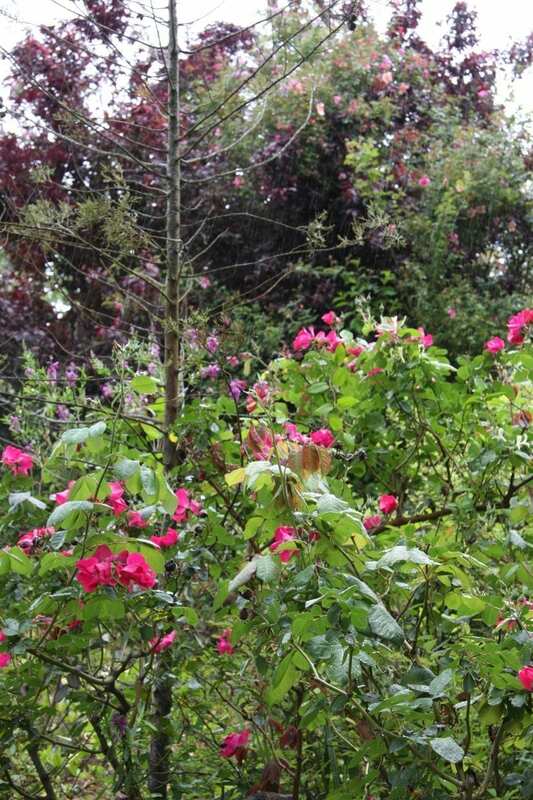 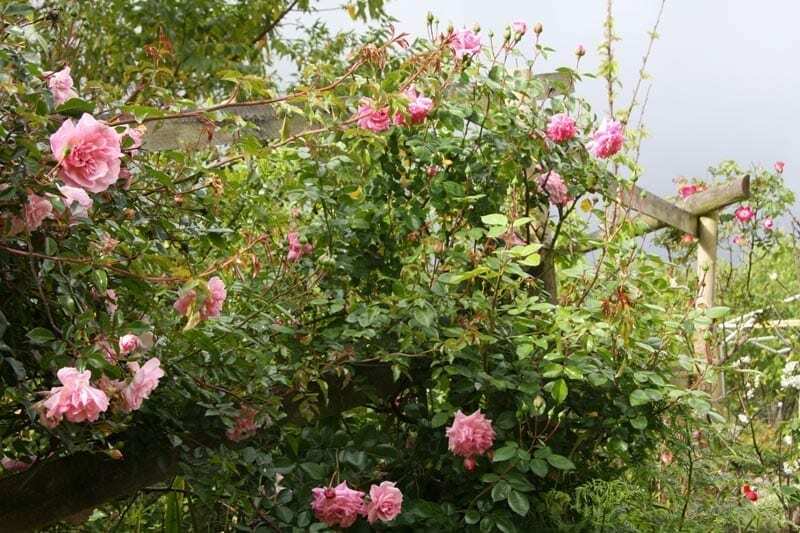 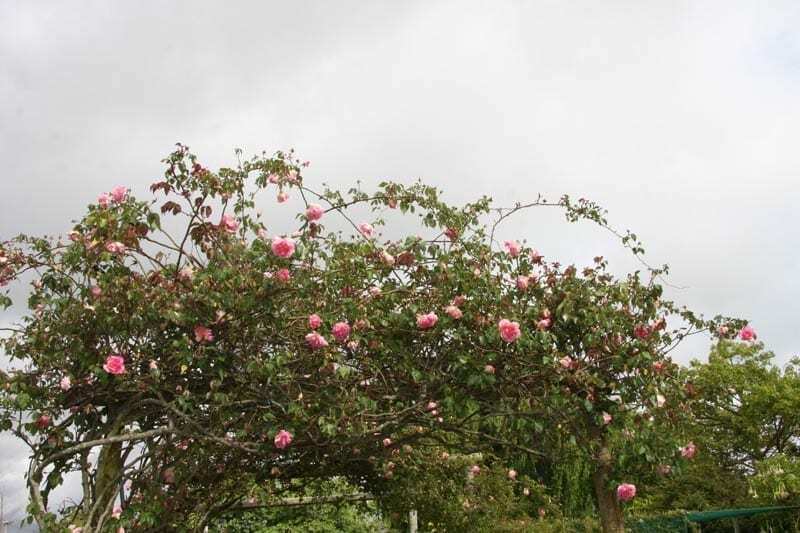 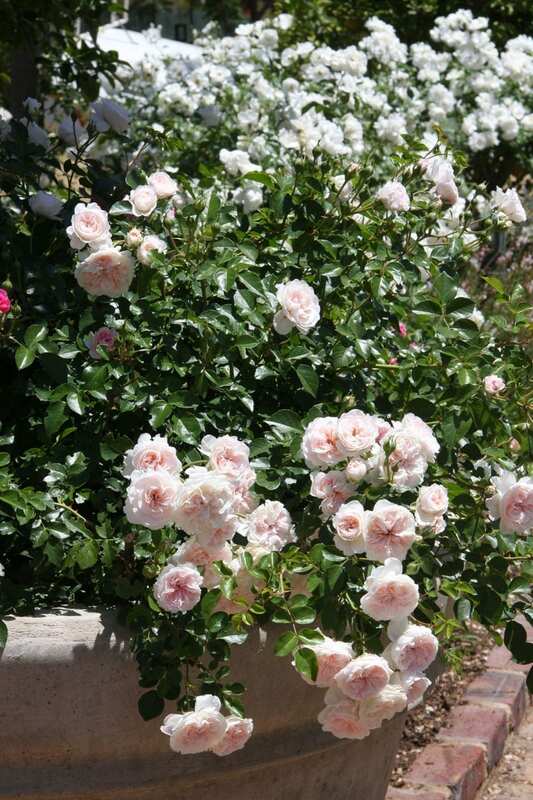 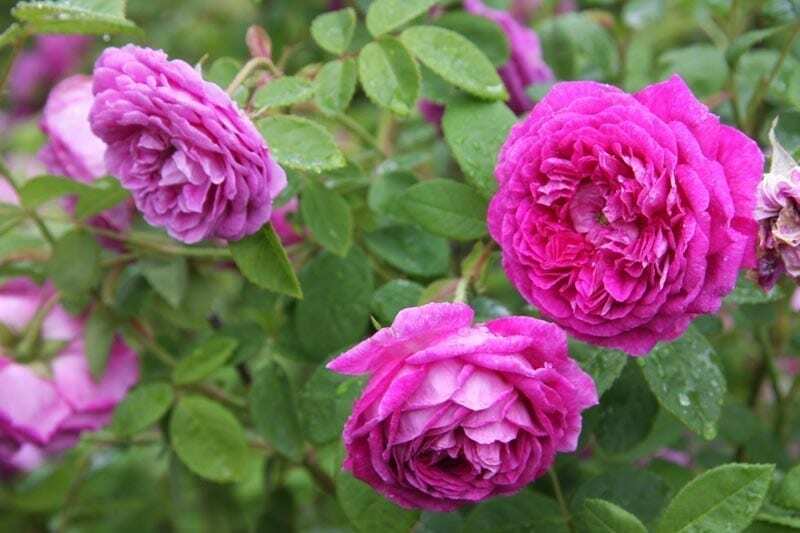 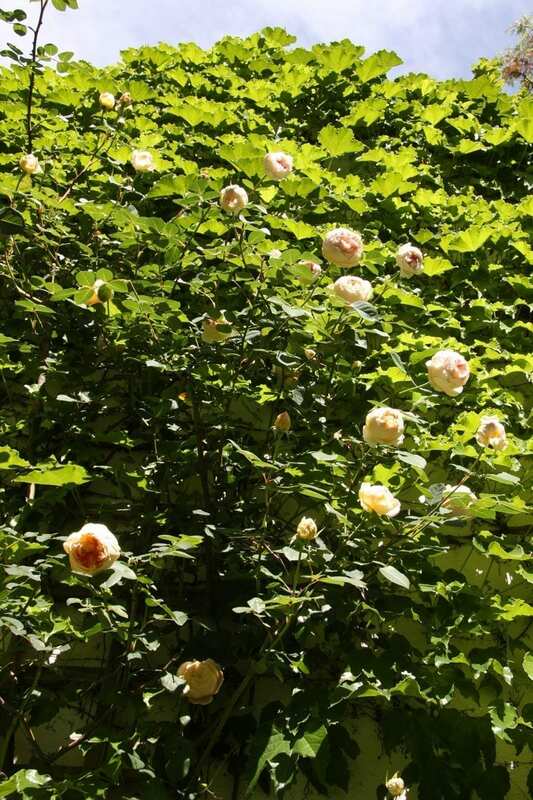 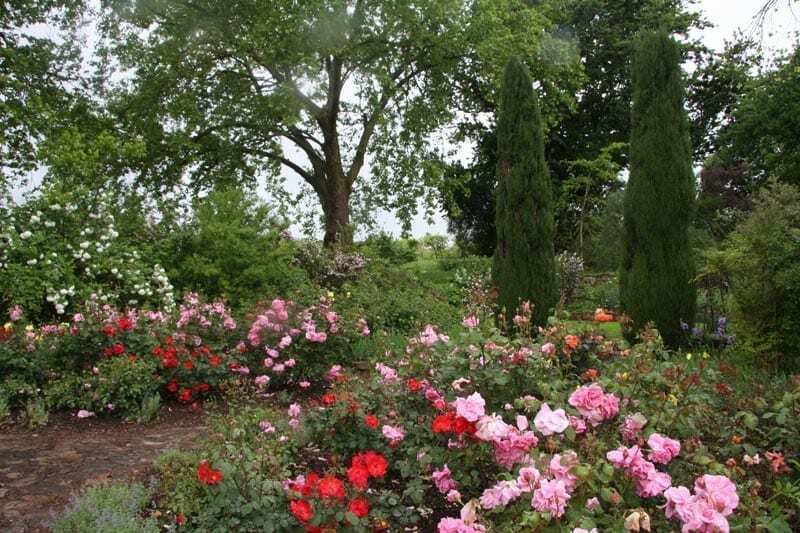 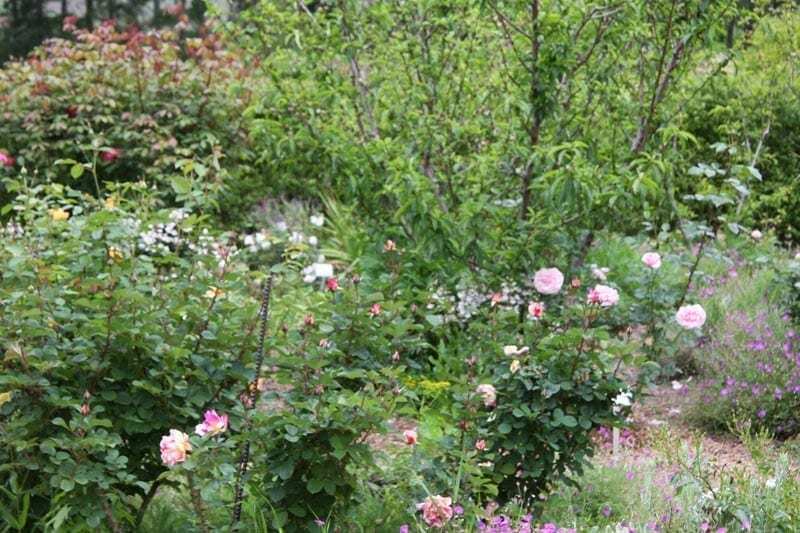 It is a rose garden planted with all the different types of David Austin Roses. 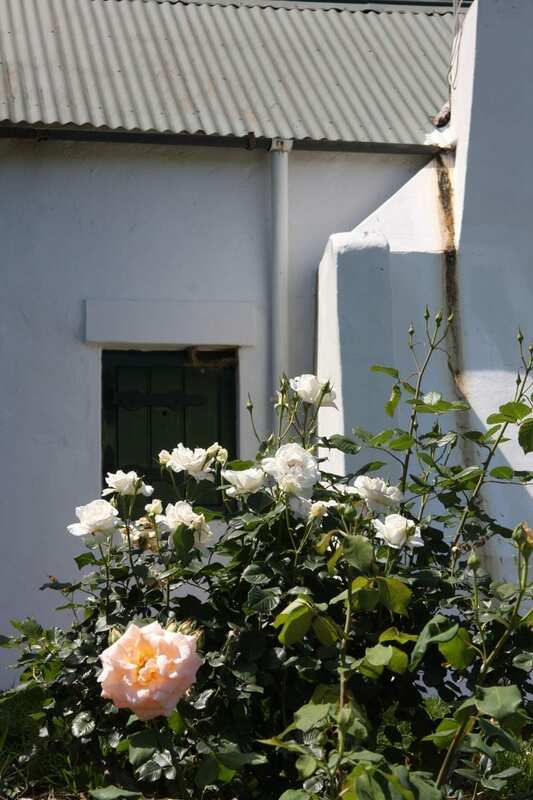 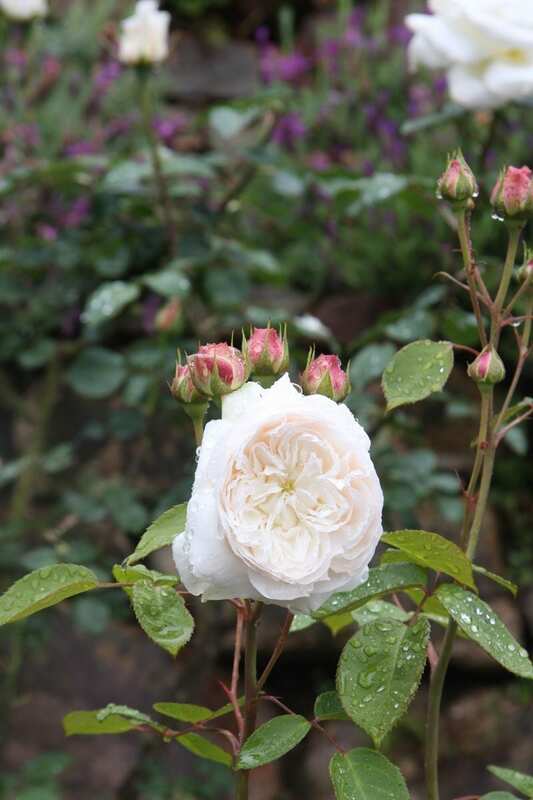 As these roses don’t like our South African sun, I will have to put on my rose hat and give this one some thought! 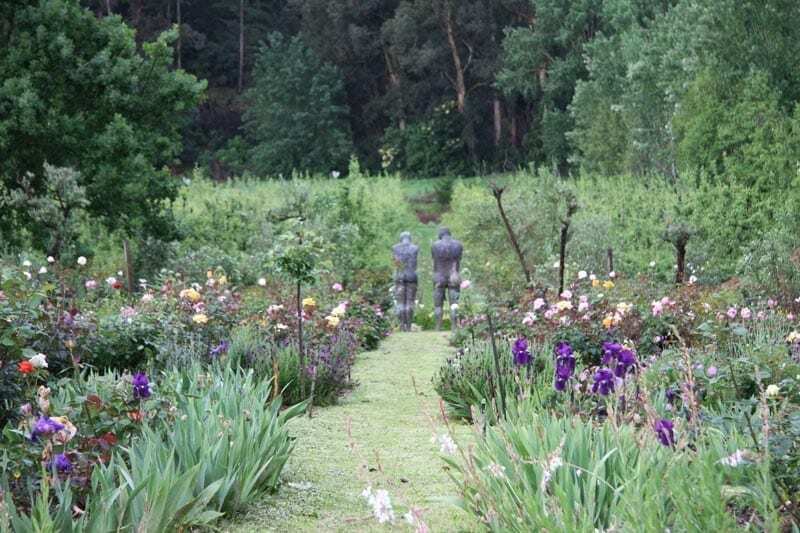 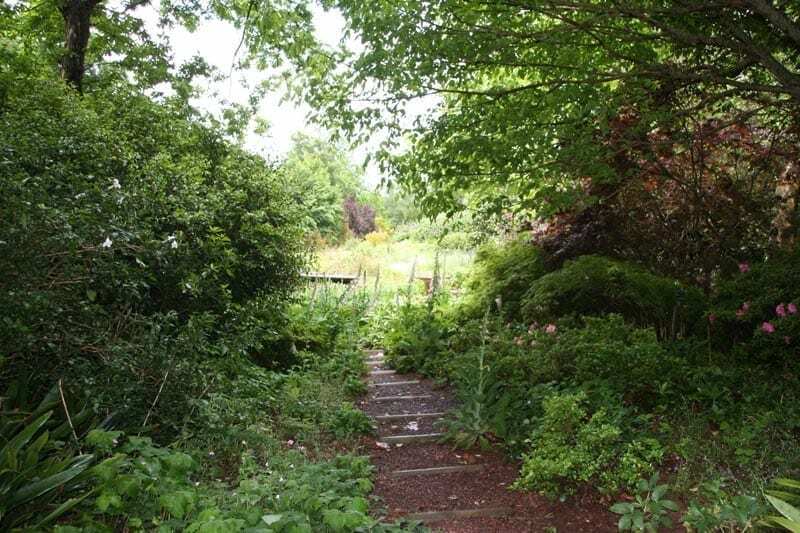 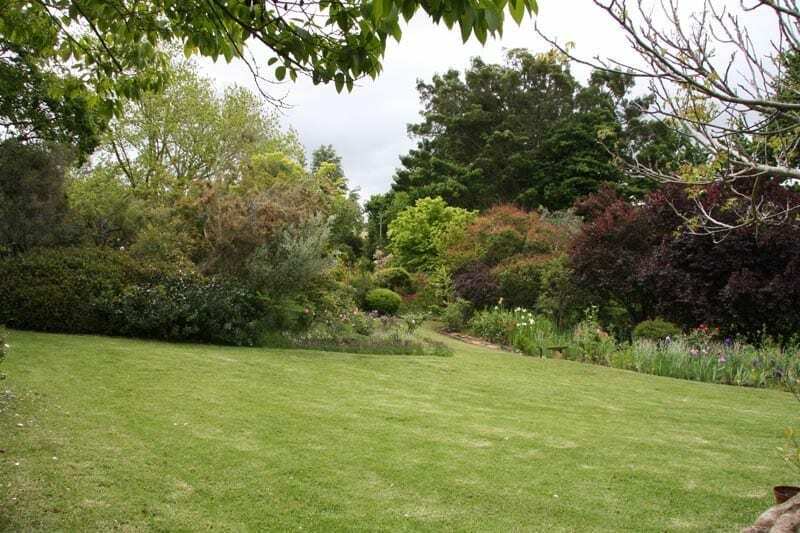 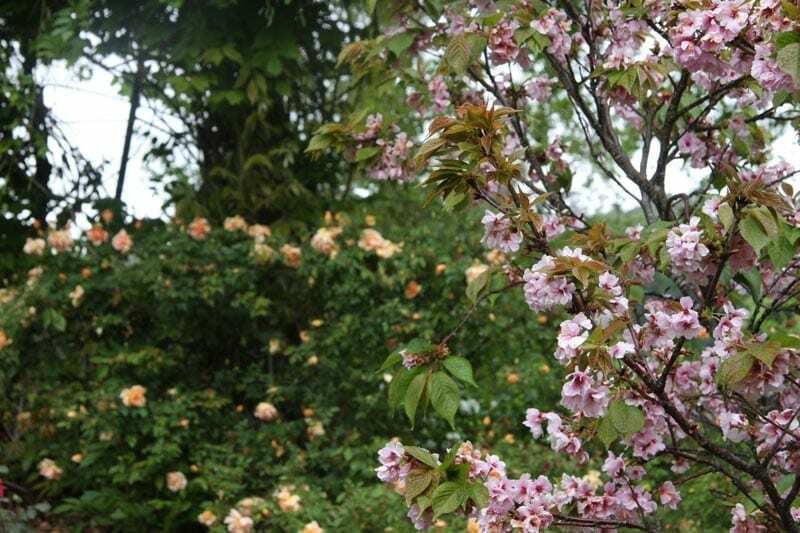 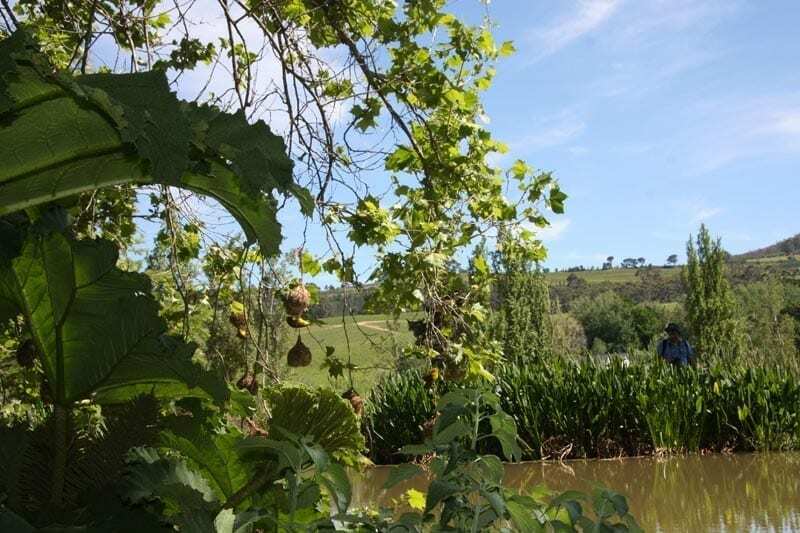 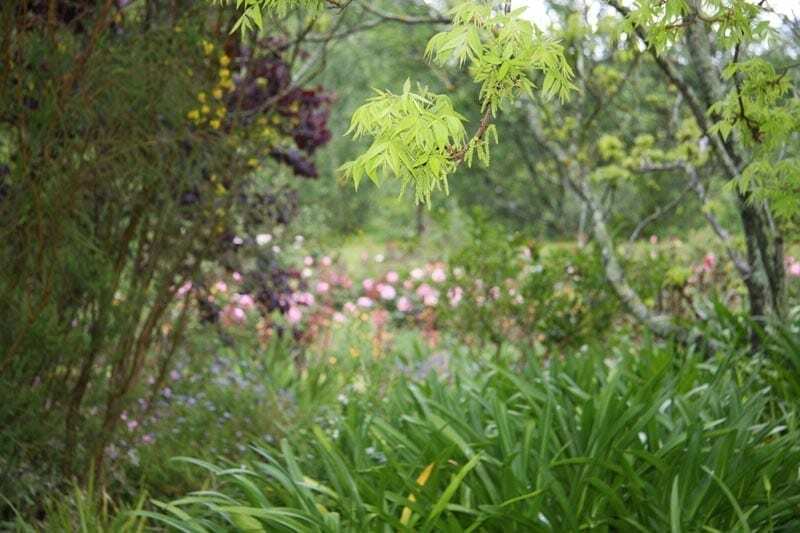 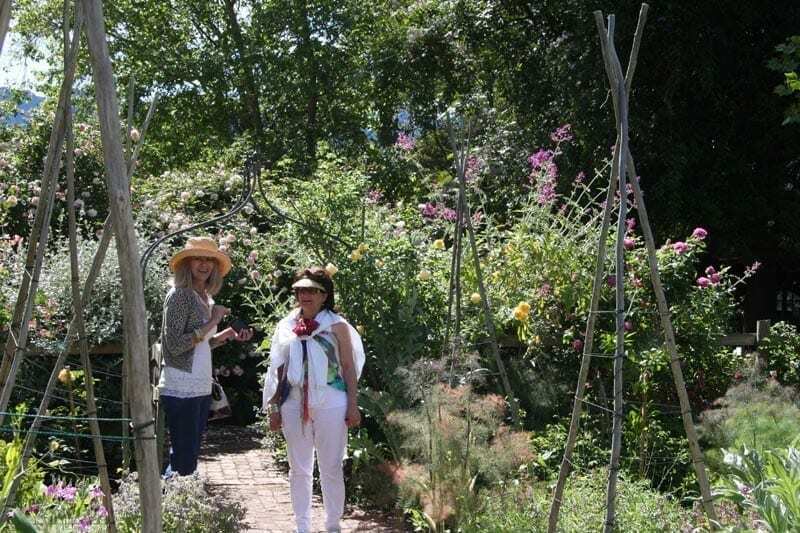 My teams of dedicated workers at The Rose House are Patrick, Amiao, Nelson, Maria and Gloria, who have all been involved to produce the beautiful garden that we love.